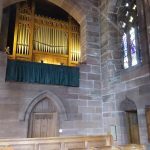 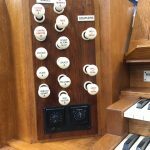 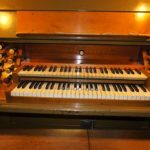 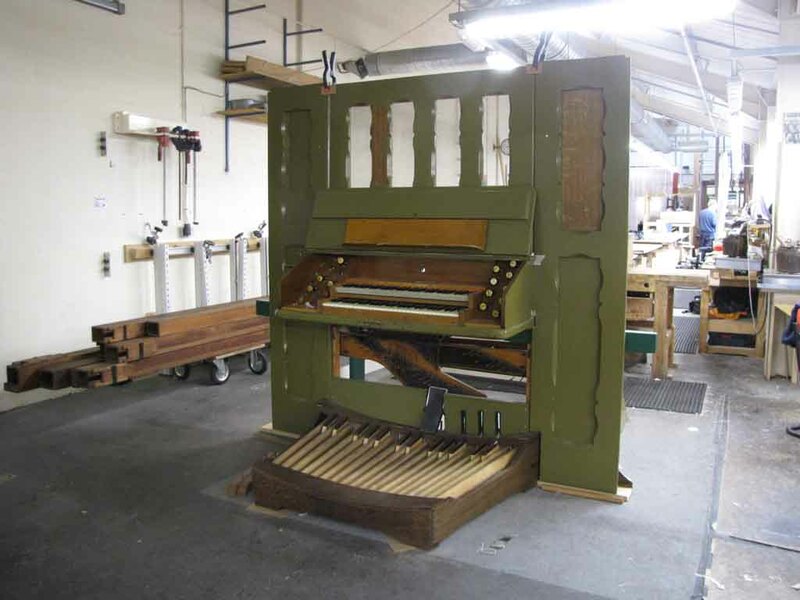 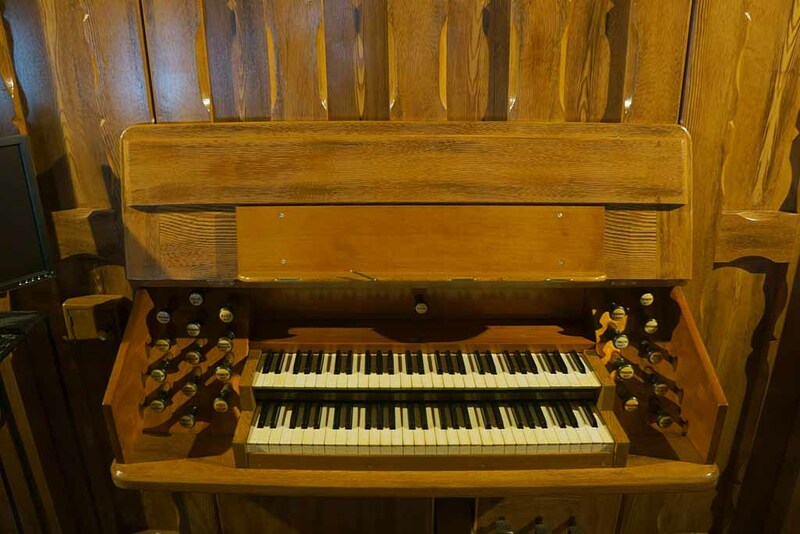 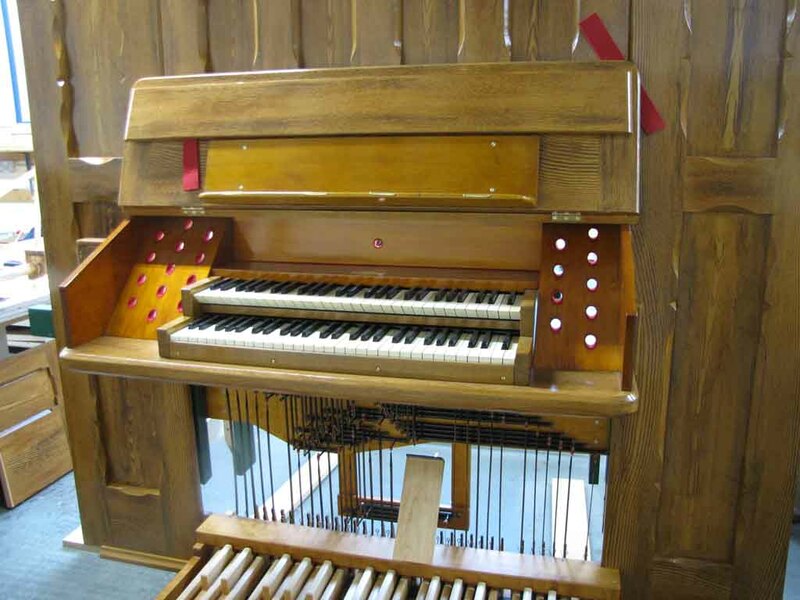 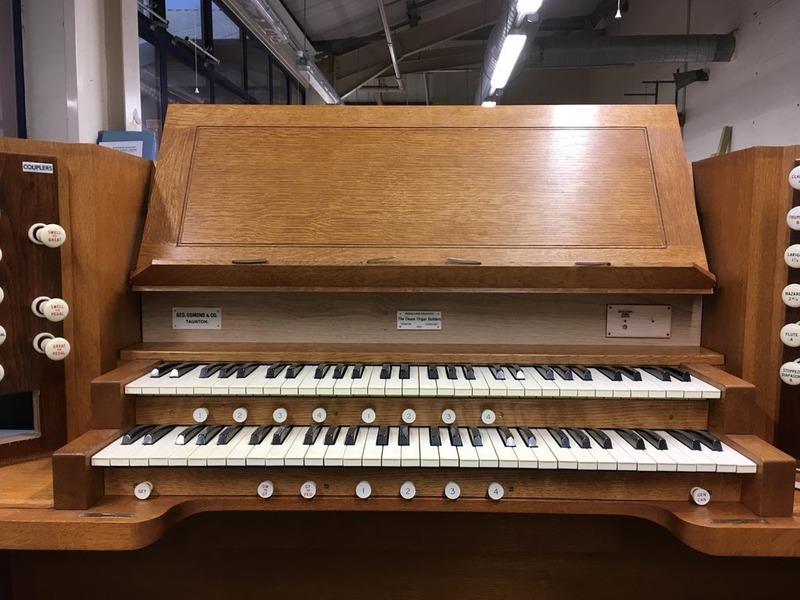 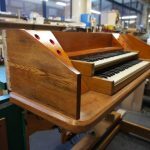 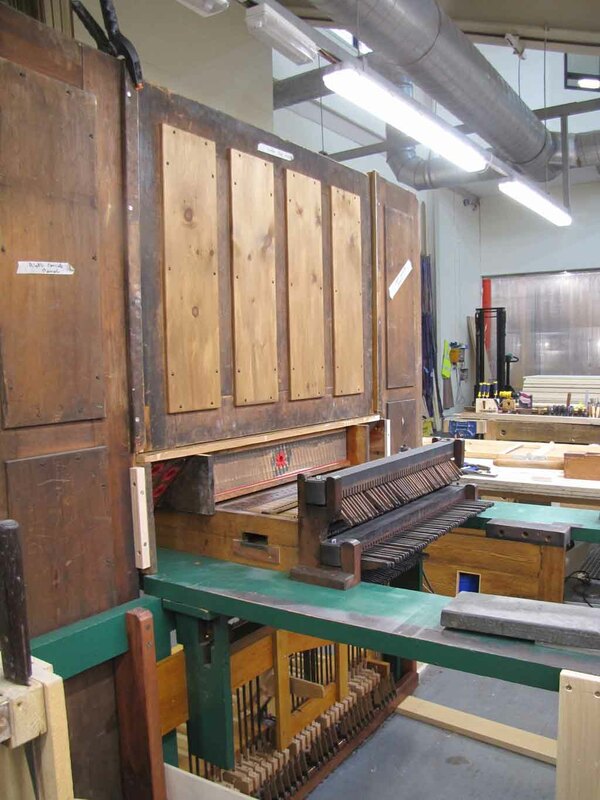 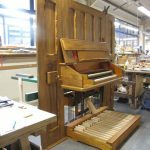 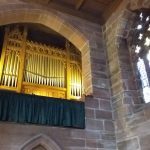 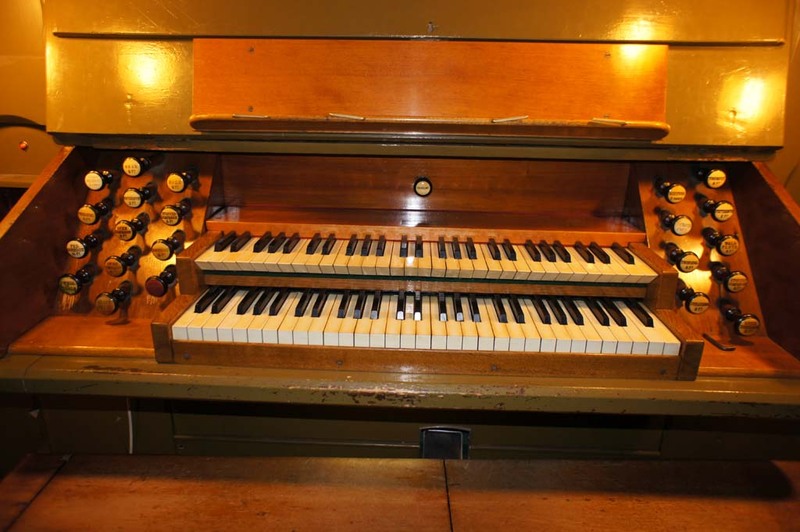 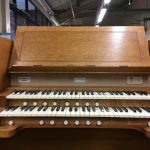 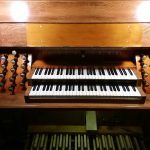 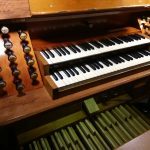 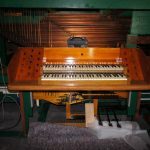 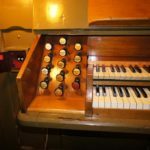 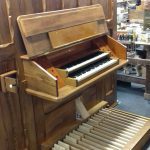 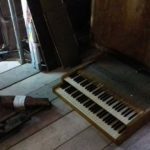 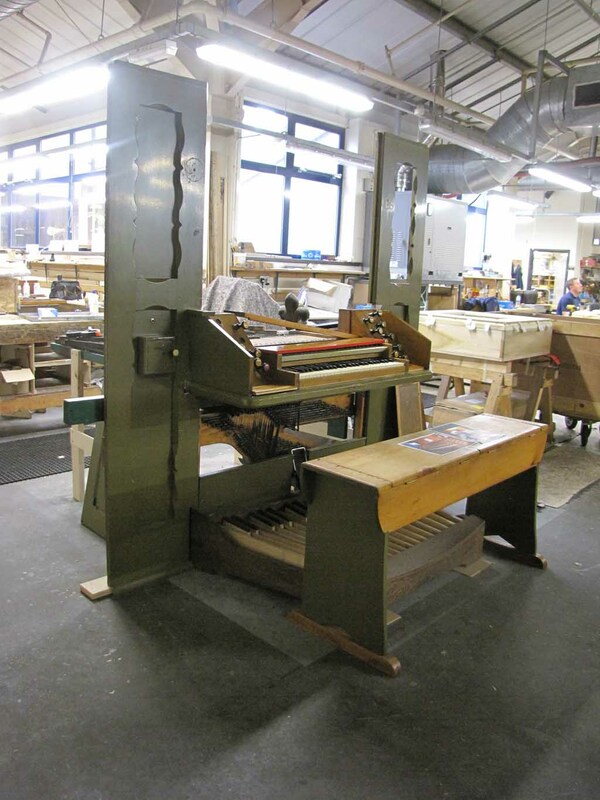 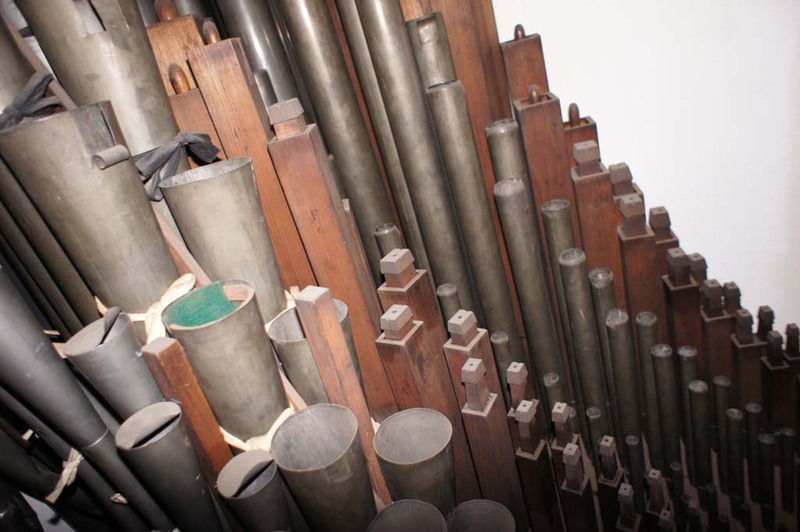 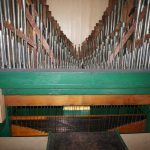 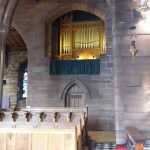 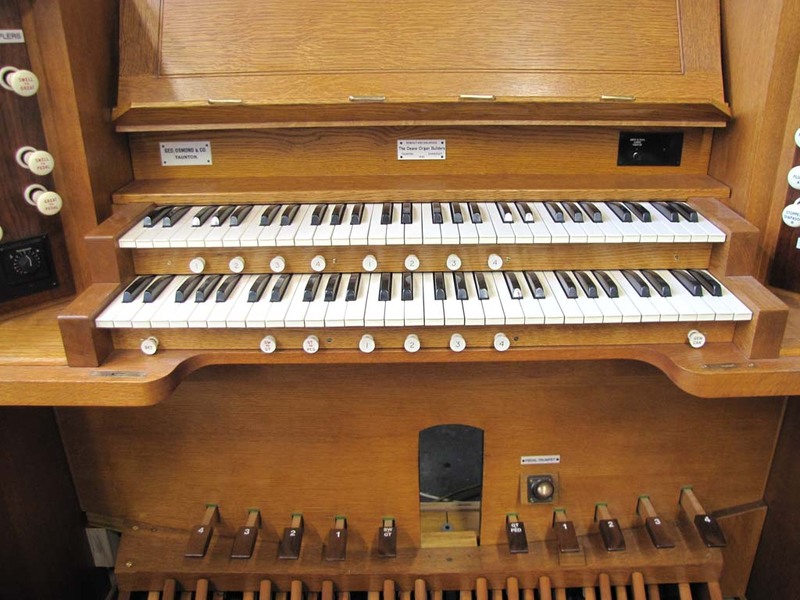 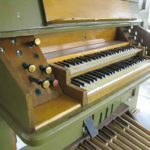 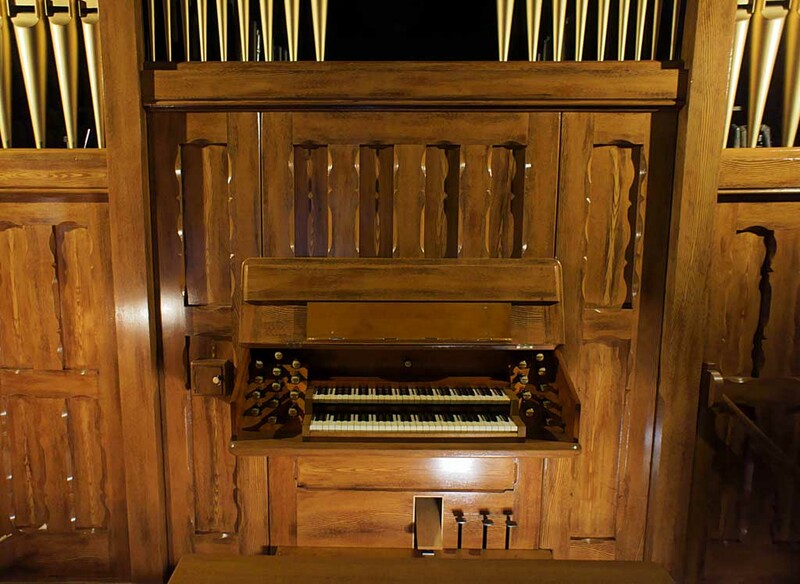 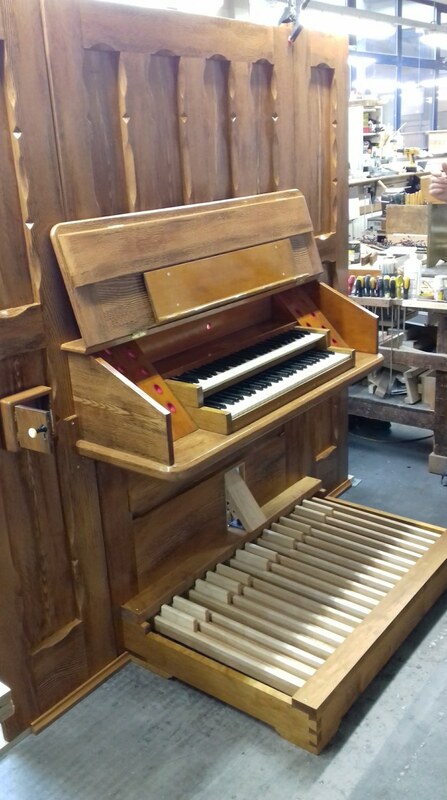 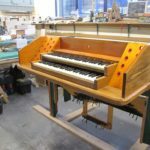 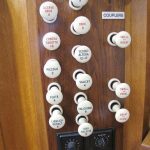 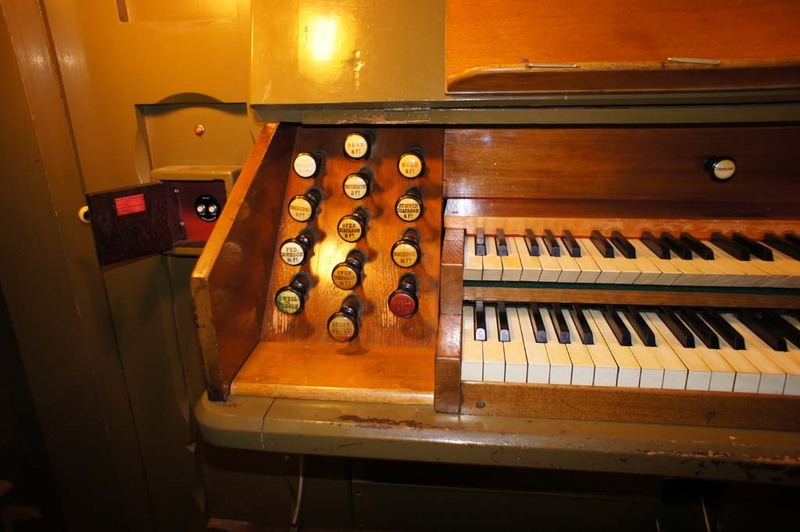 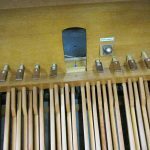 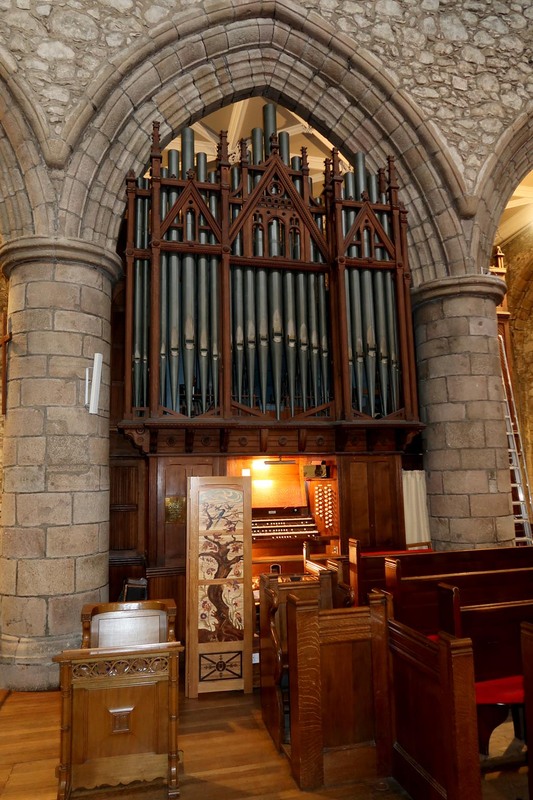 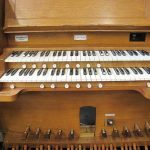 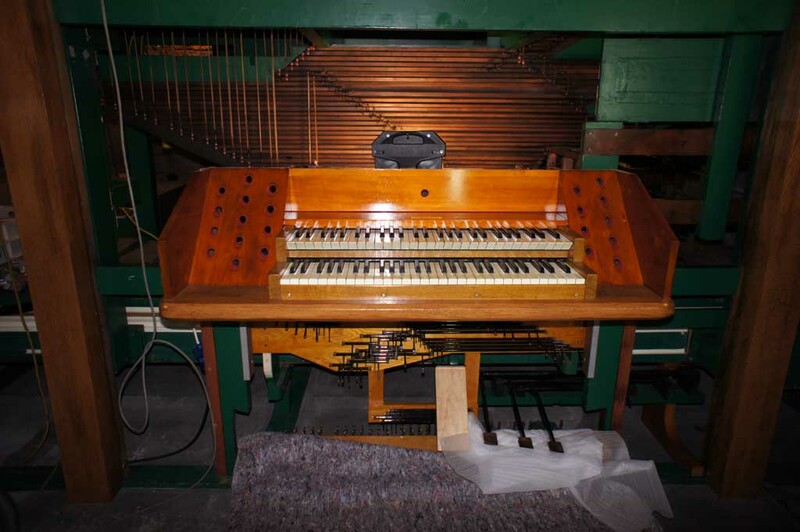 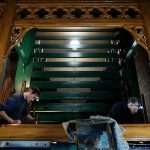 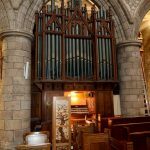 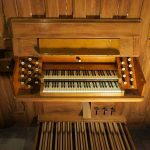 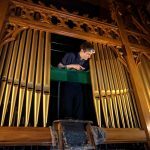 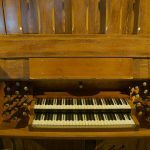 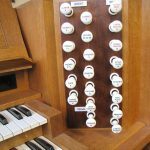 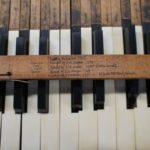 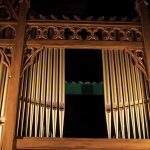 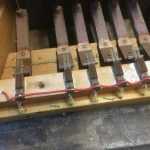 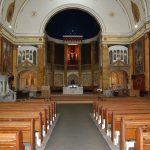 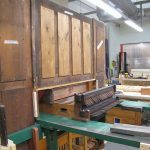 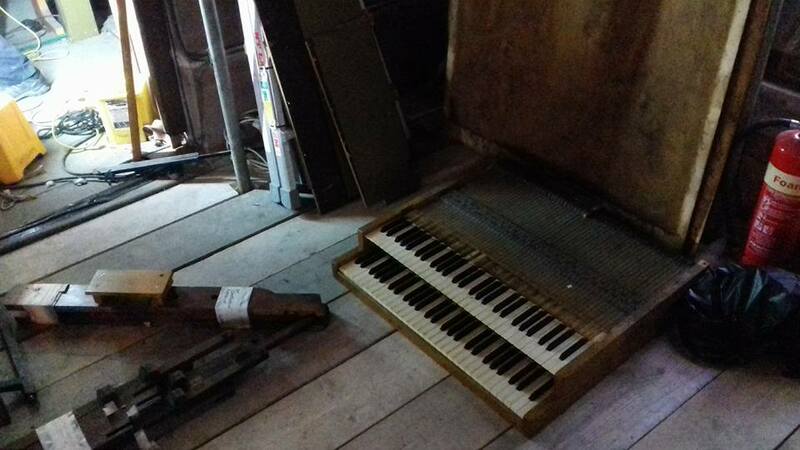 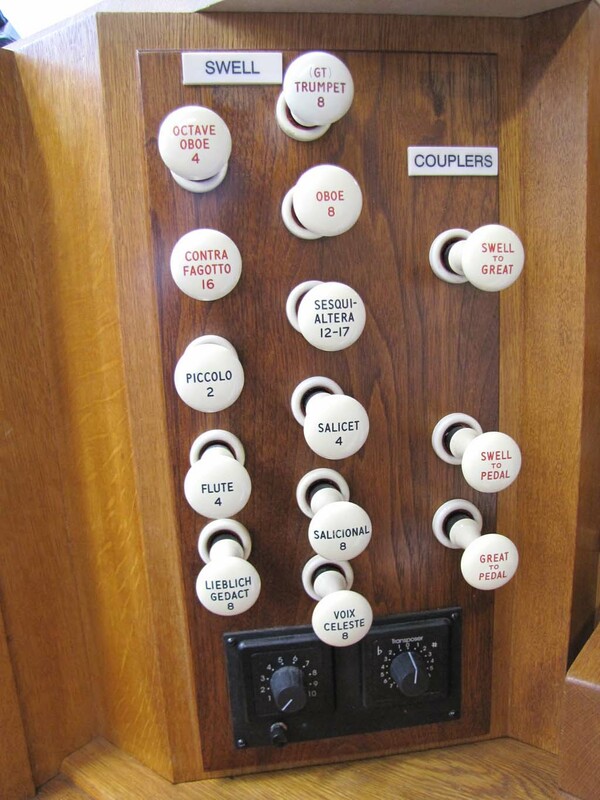 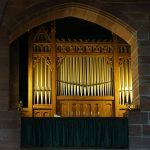 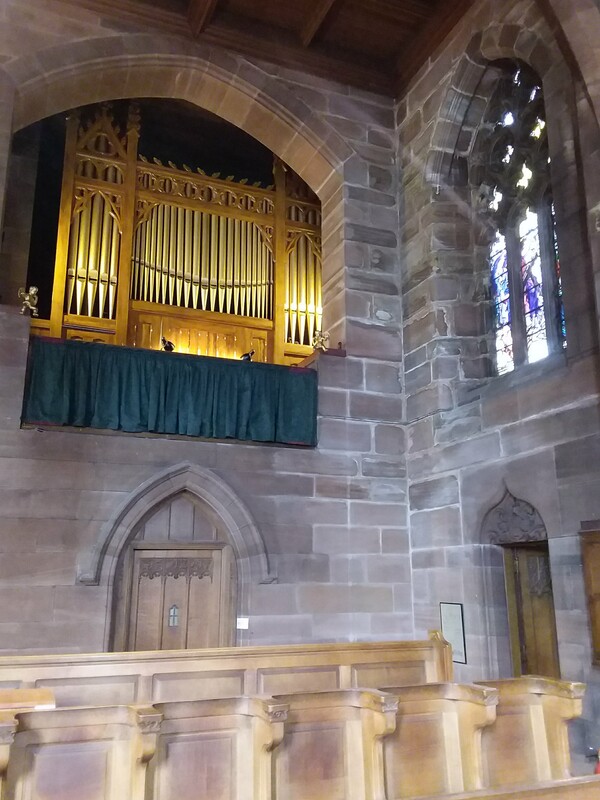 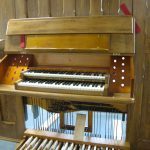 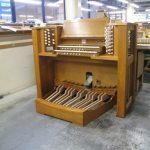 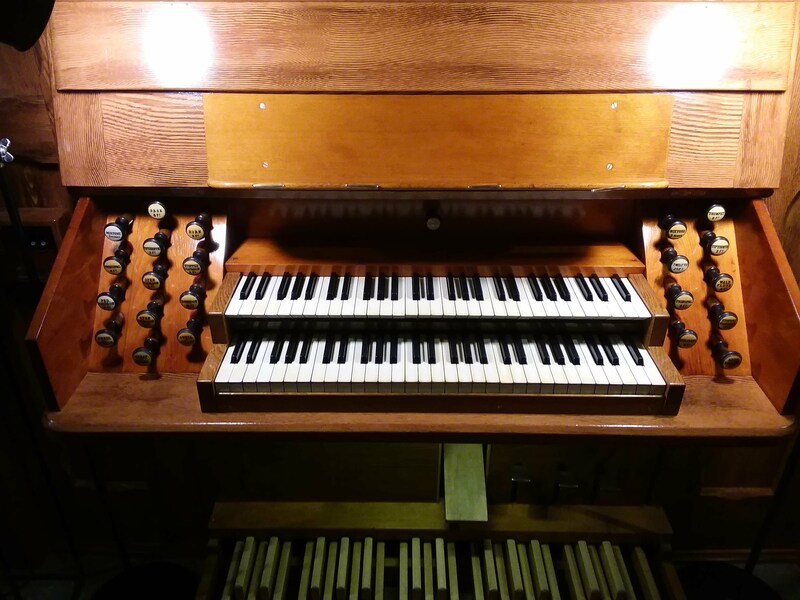 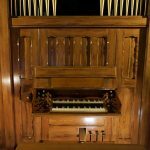 Organ by Henry Willis & Sons 1891, overhauled by NP Mander 1970. 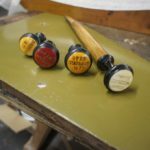 3 manuals, 46 stops. 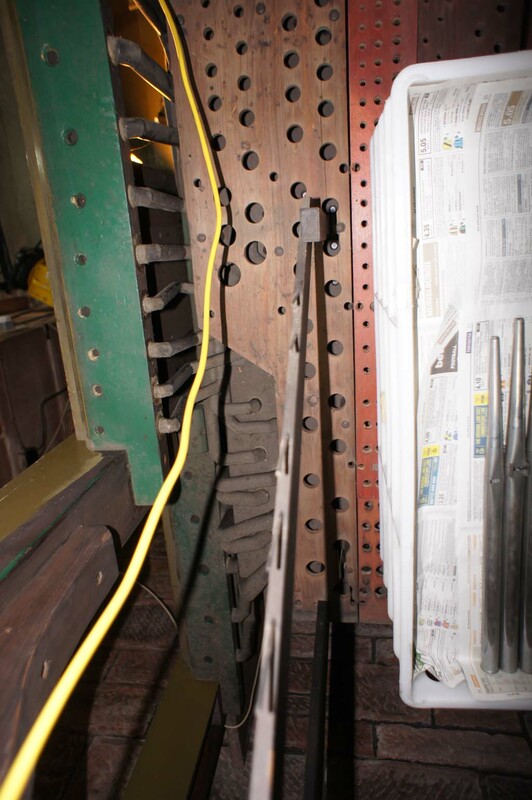 H&H 1923 1992, 3 manuals 50 stops. 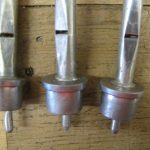 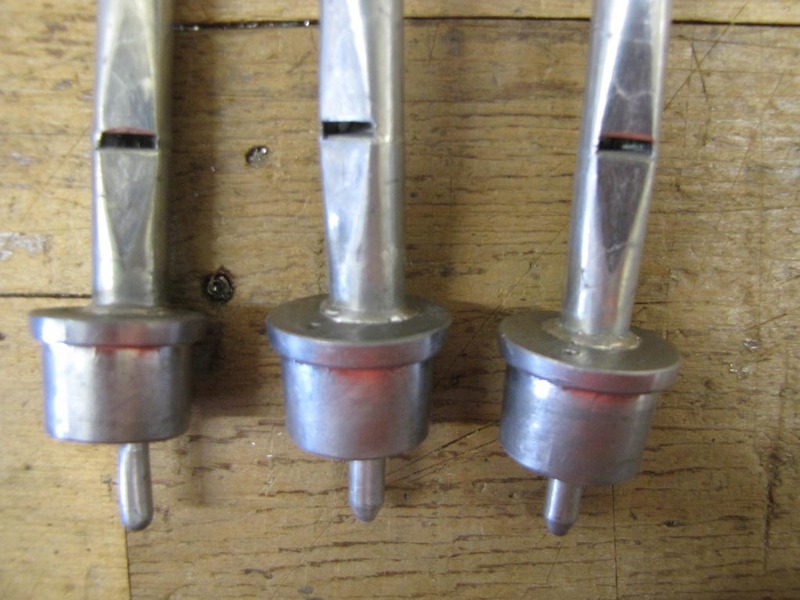 Upgrade of the piston system. 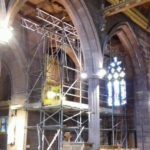 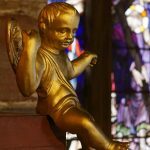 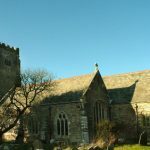 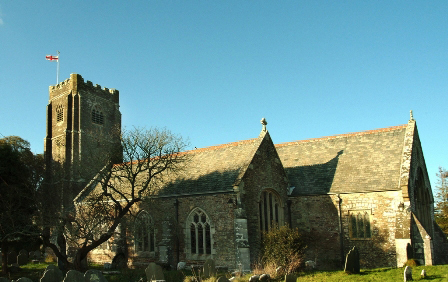 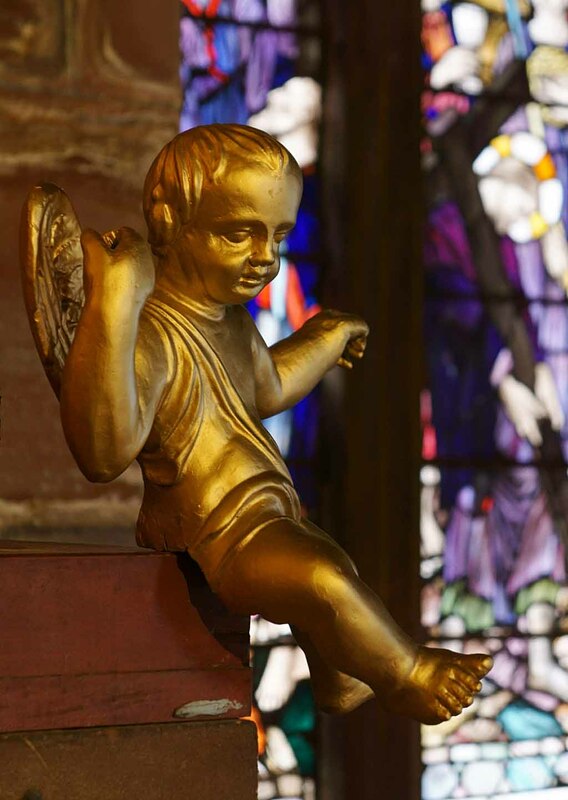 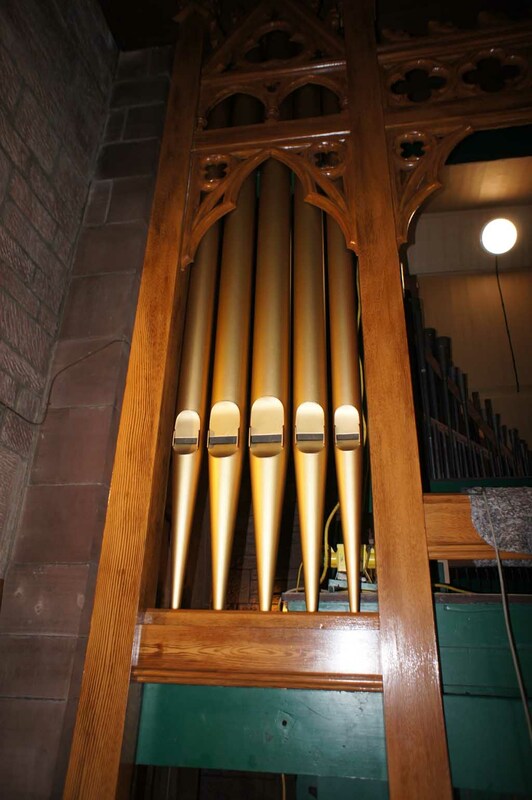 H&H 1971 for St John’s Church, Perth. 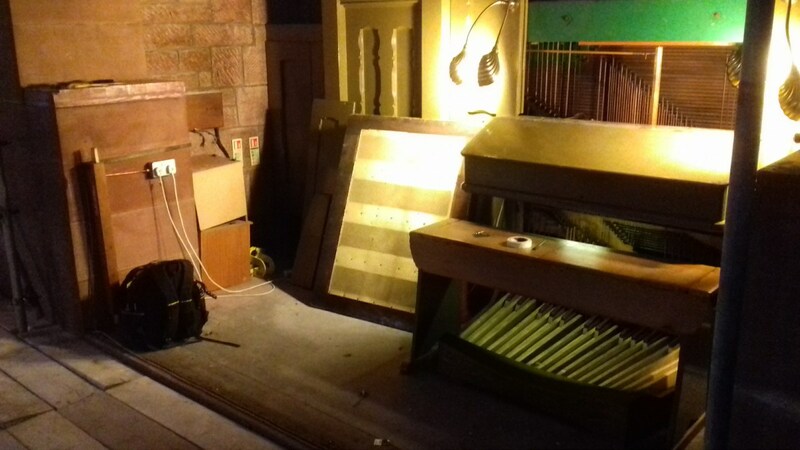 Rehomed to Edinburgh by another company. 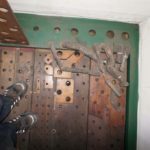 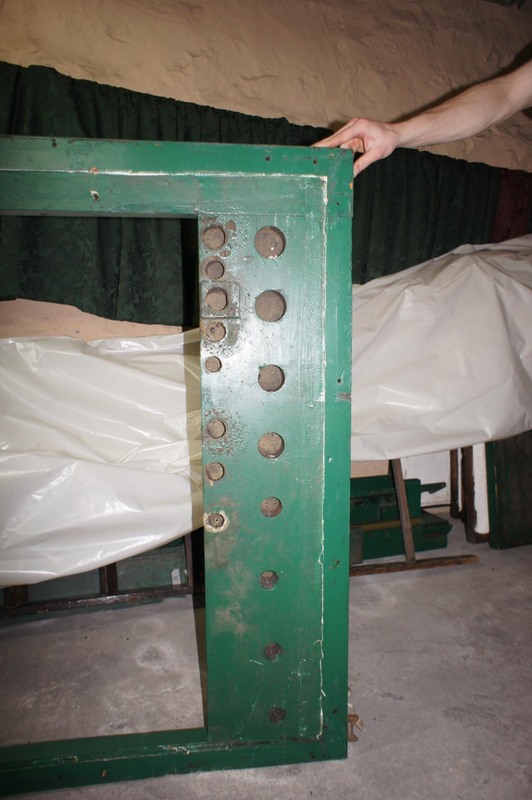 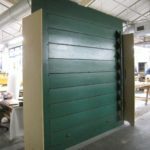 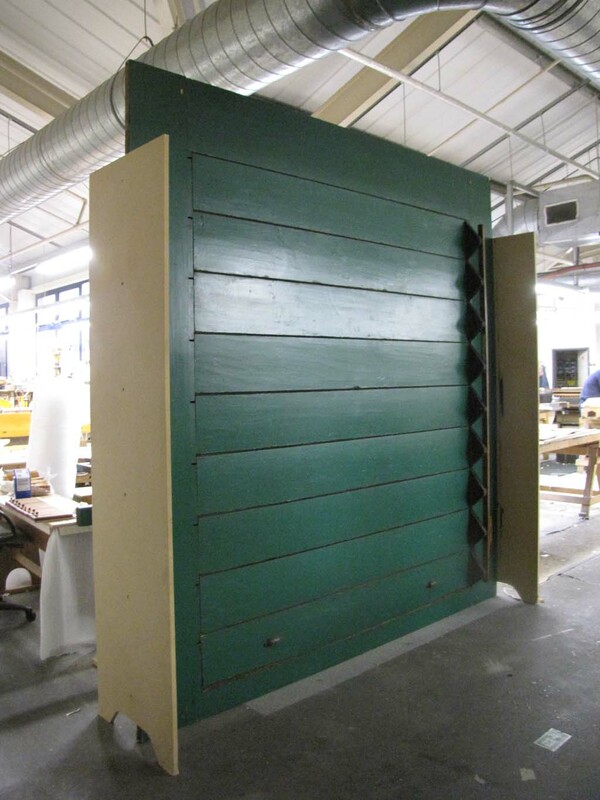 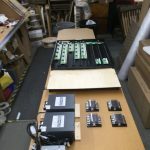 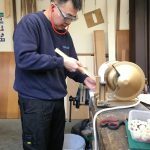 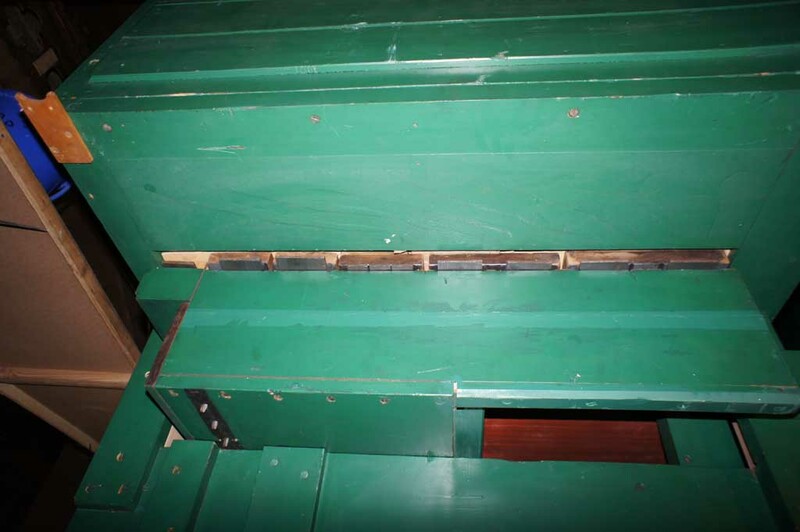 Attention to actions, Swell shutter mechanism, and voicing. 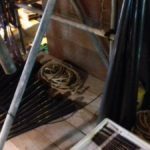 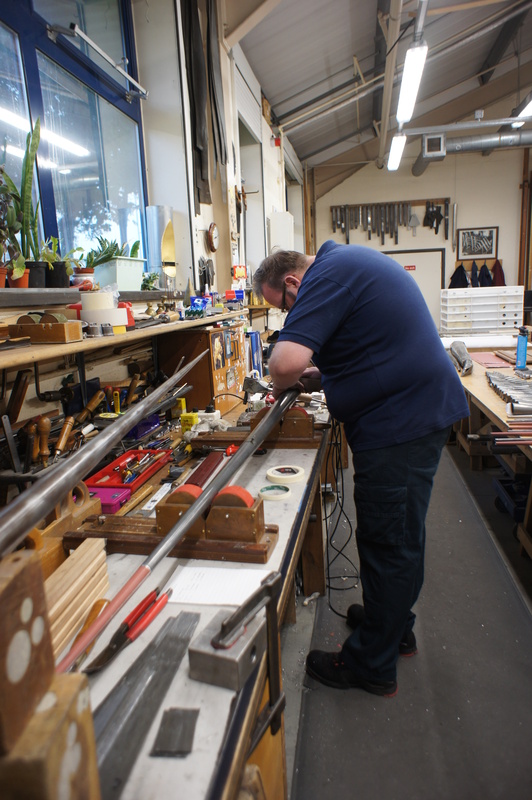 All pipework will be cleaned and that of 4ft and less will be washed. 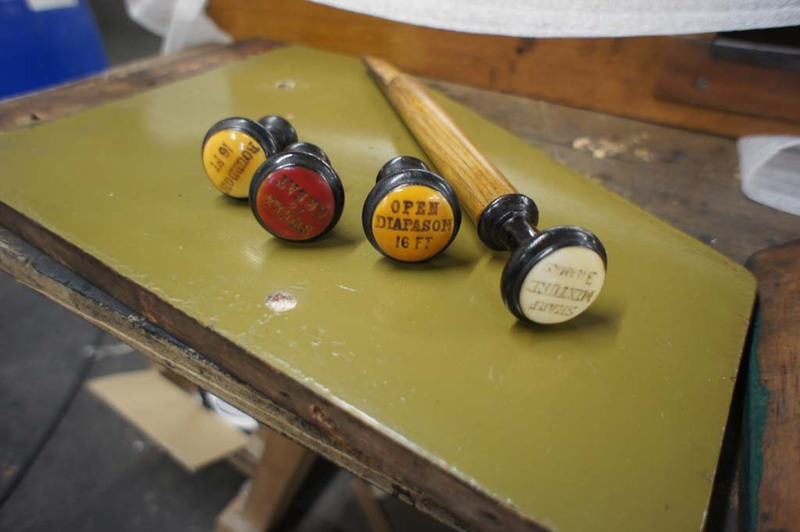 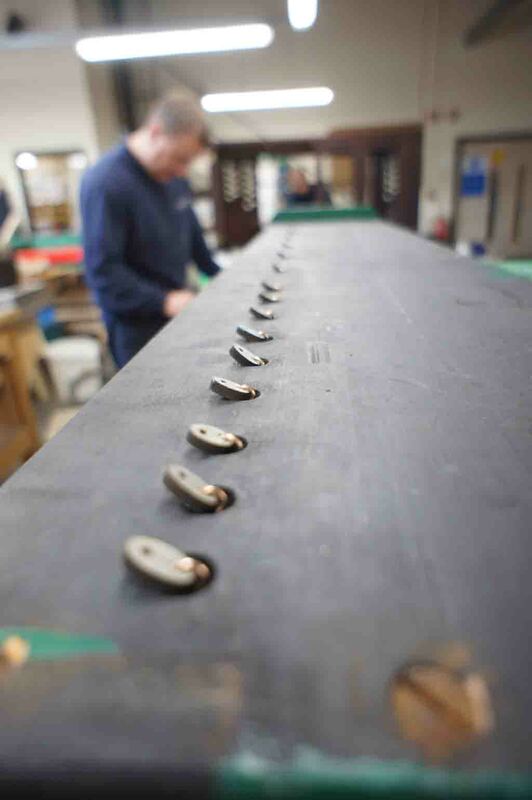 All stoppers checked, refitted and greased, as necessary. 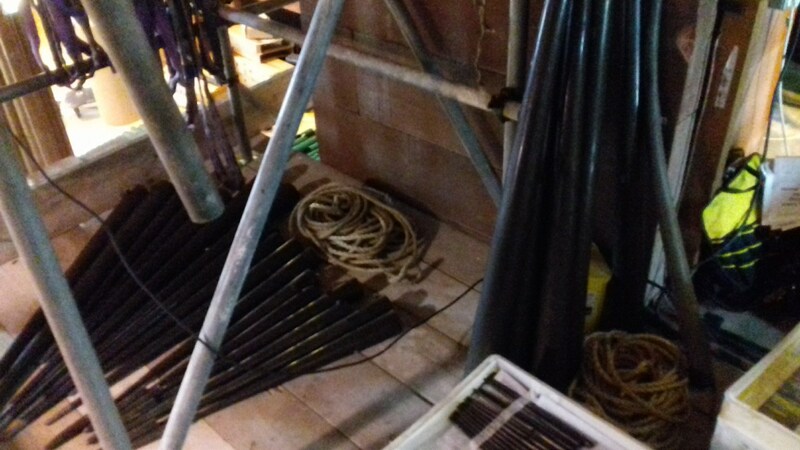 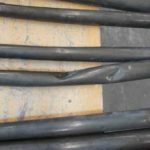 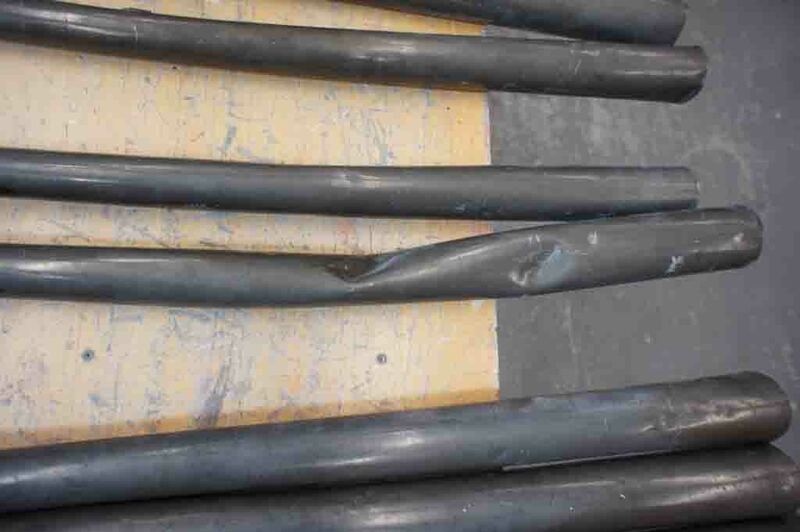 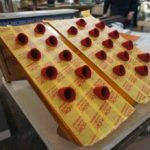 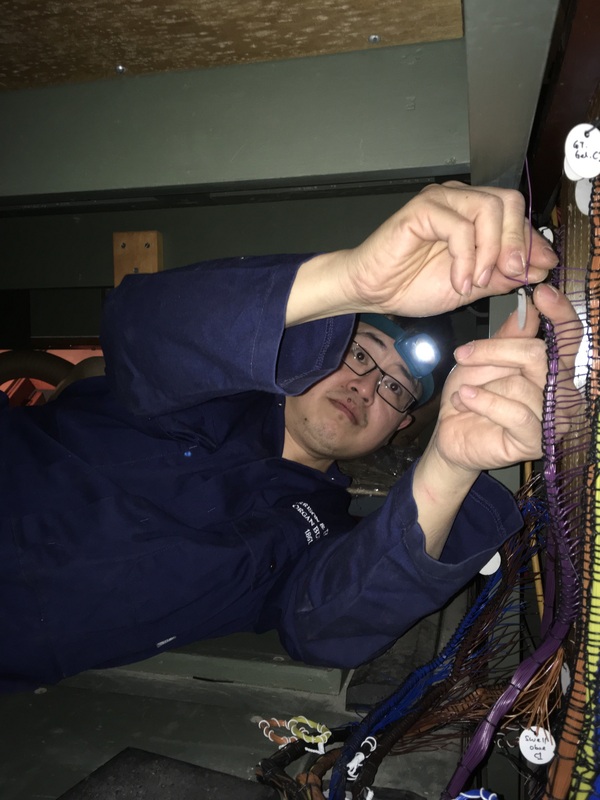 Damaged pipes will be repaired. 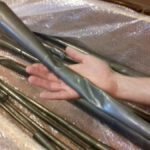 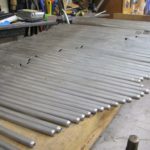 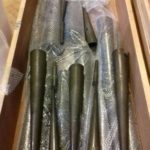 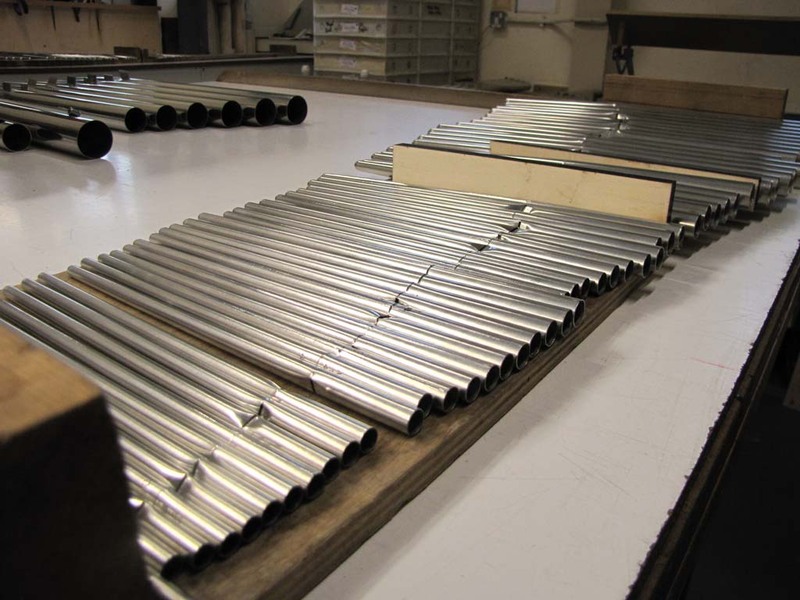 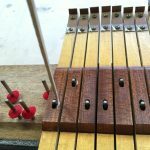 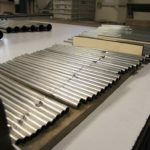 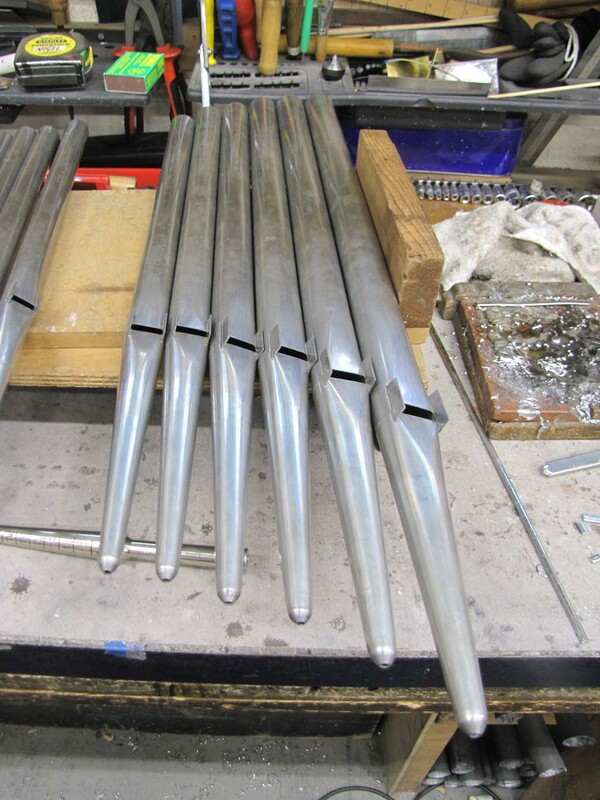 Swell Oboe – New bass resonators and better support created at a higher level. 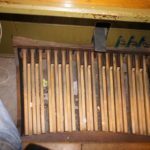 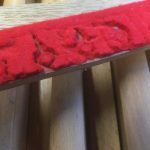 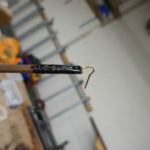 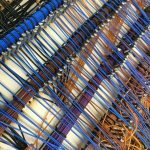 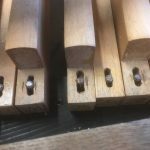 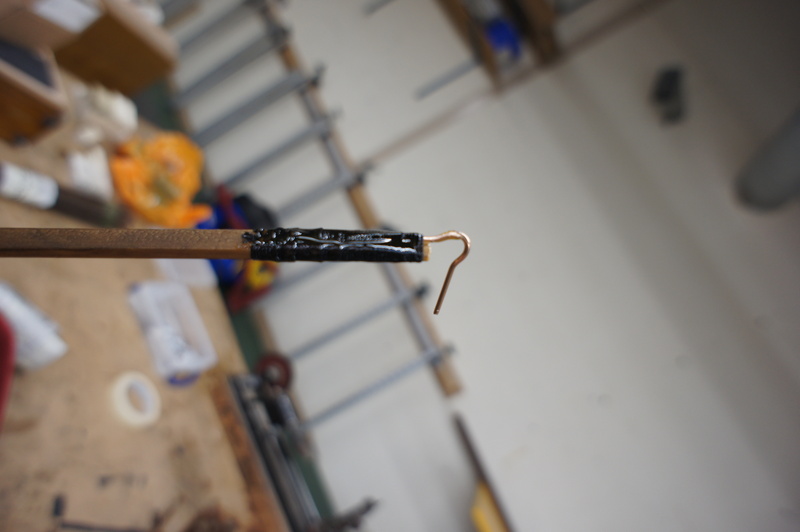 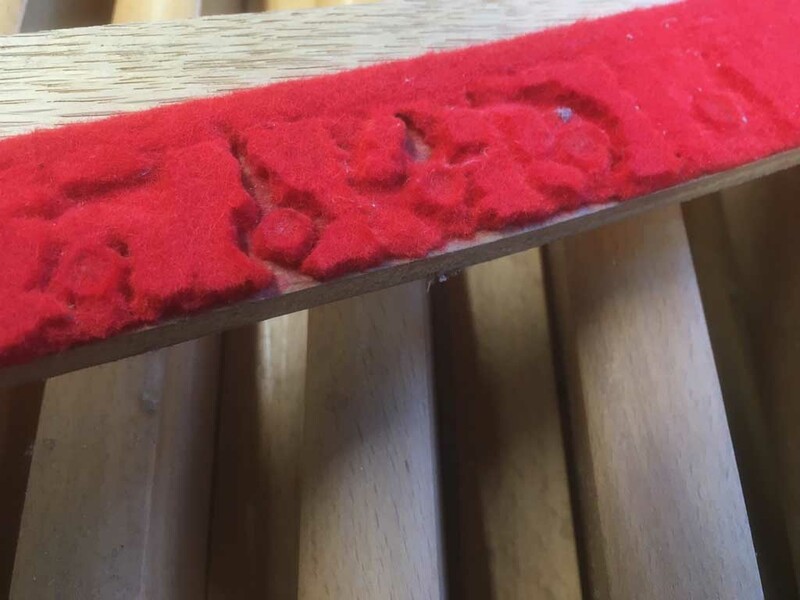 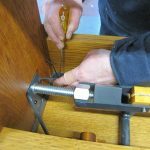 The reed stops cleaned and repaired where necessary. 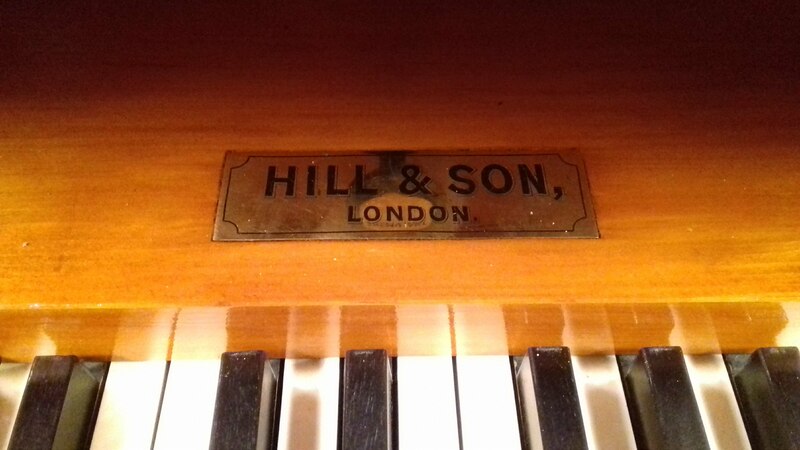 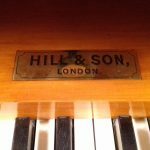 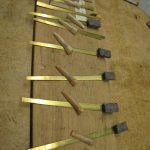 Review of Swell Mixture to establish a composition more in keeping with the Victorian origins of the instrument. 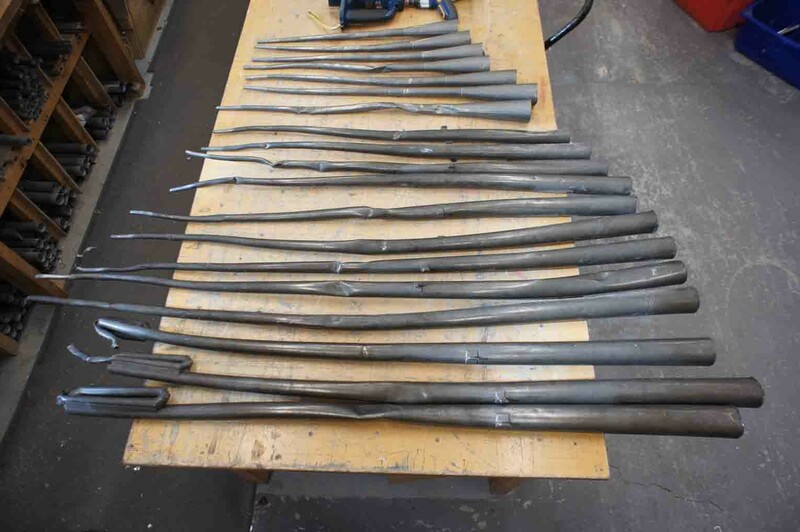 Front pipes resprayed in agreed colour. 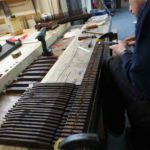 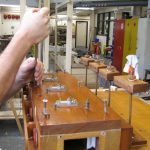 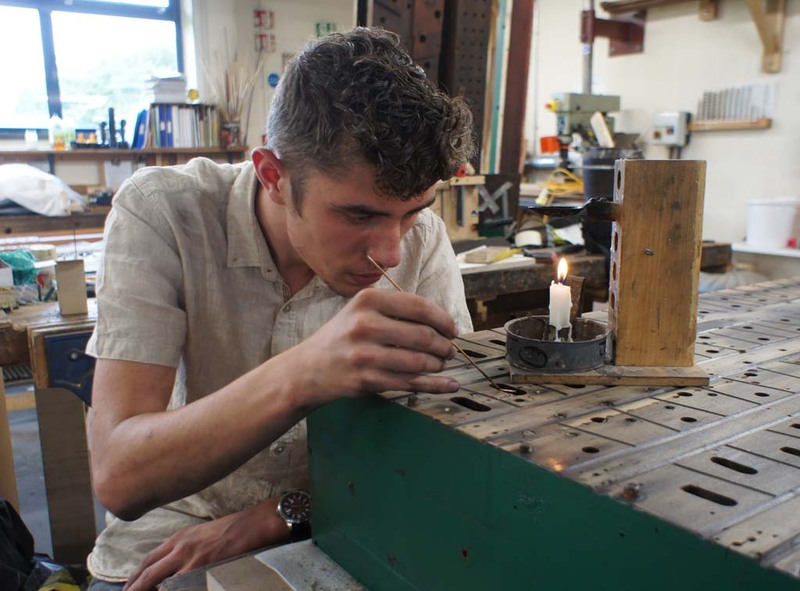 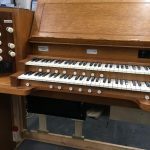 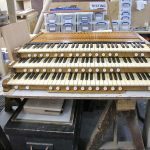 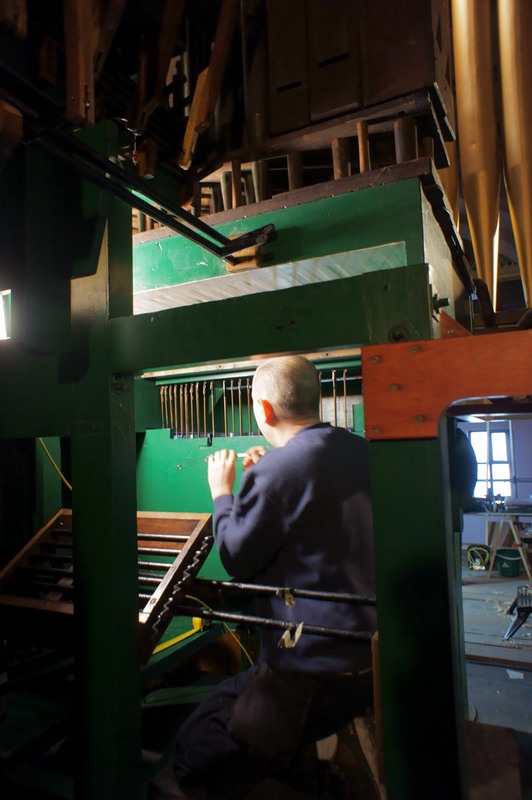 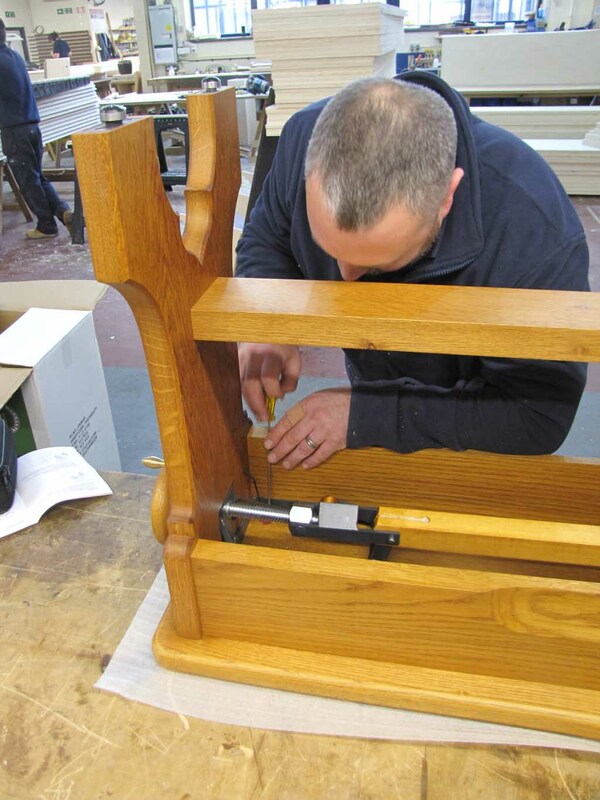 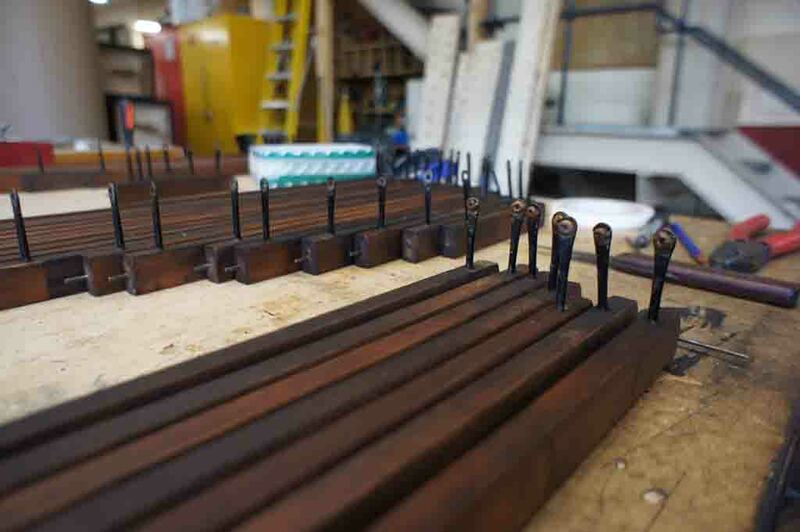 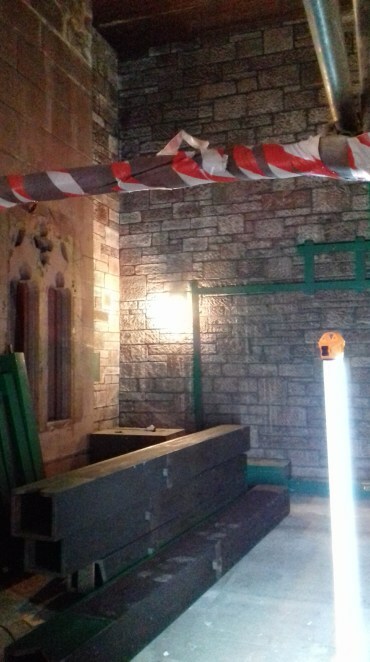 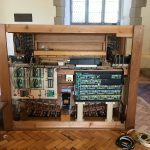 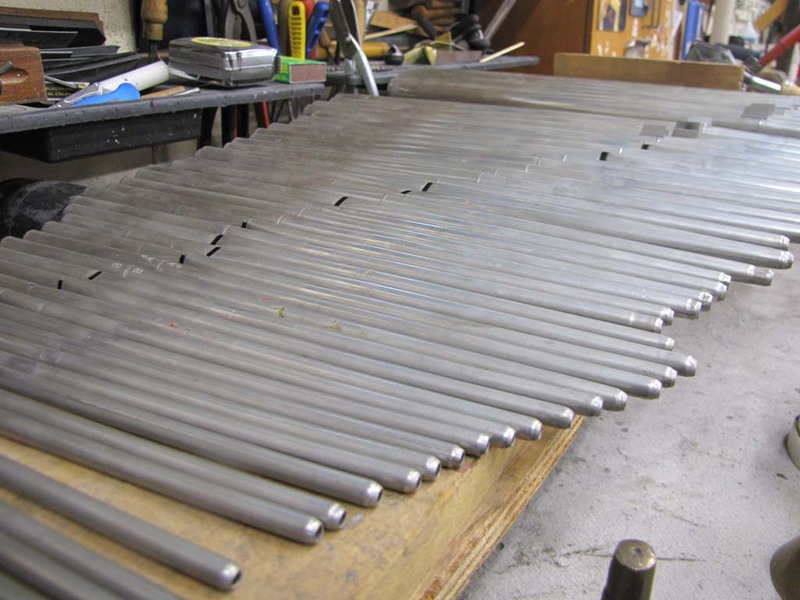 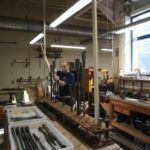 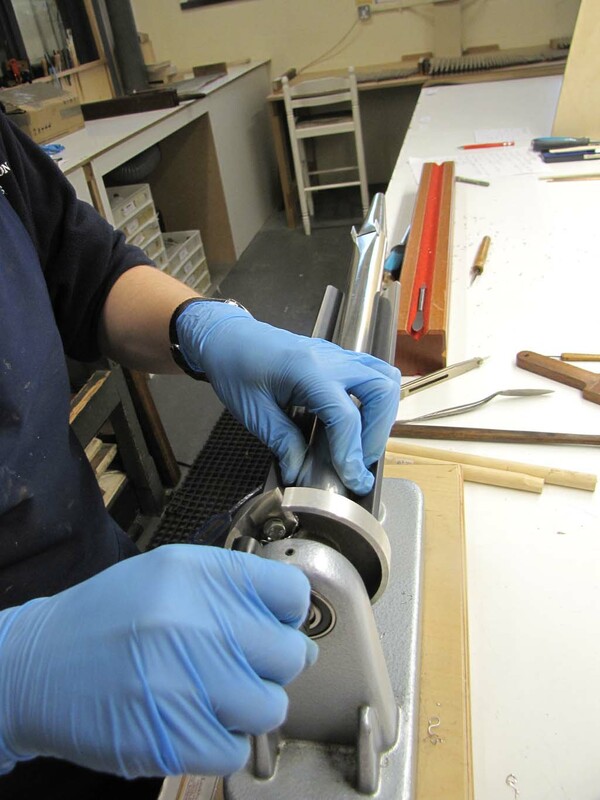 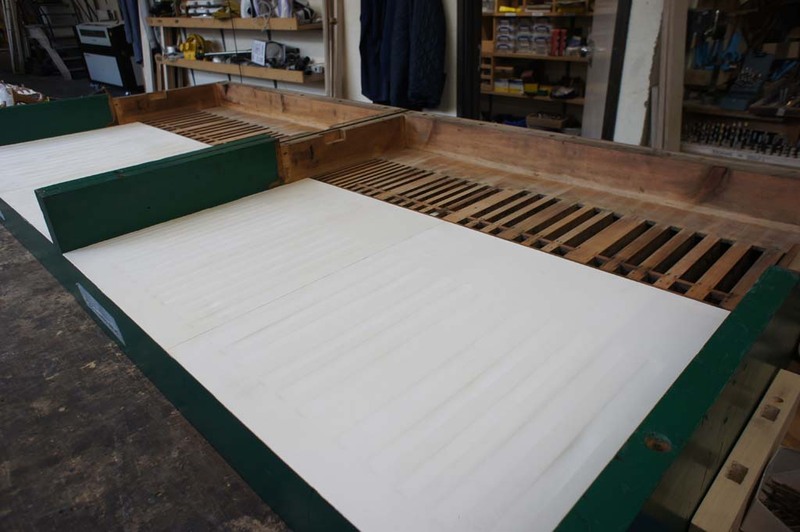 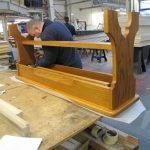 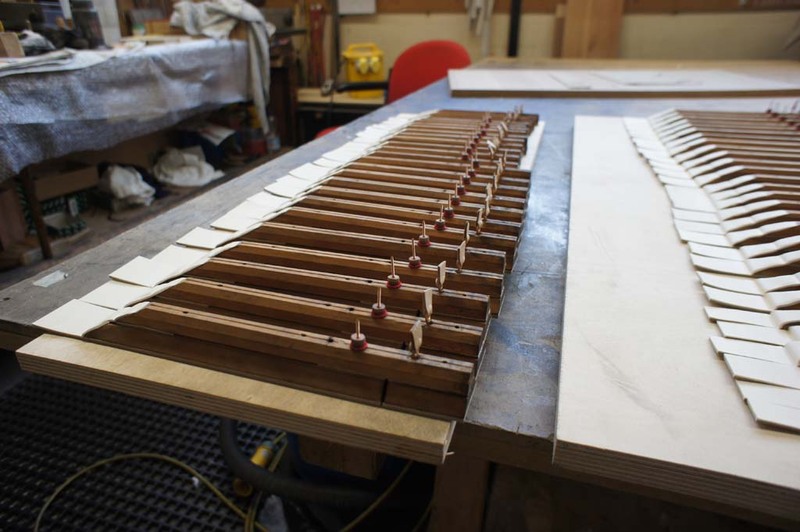 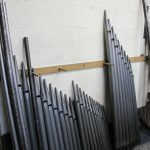 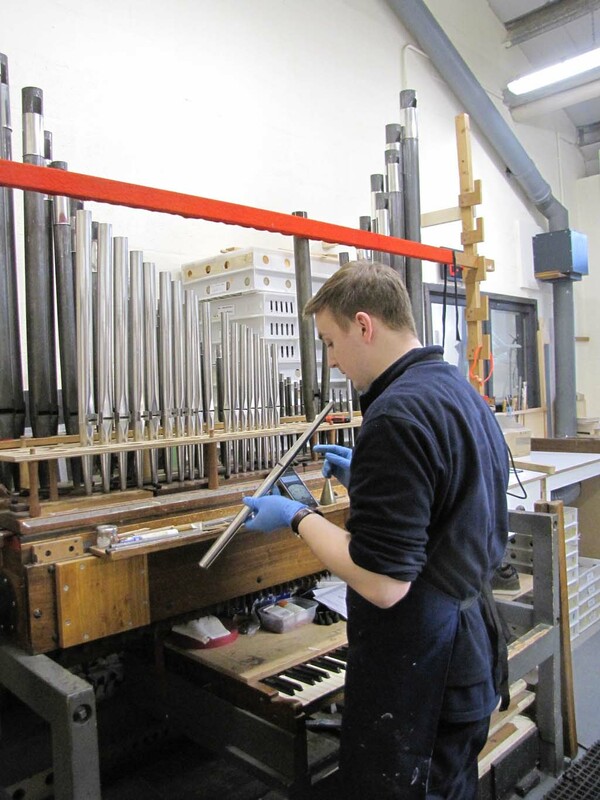 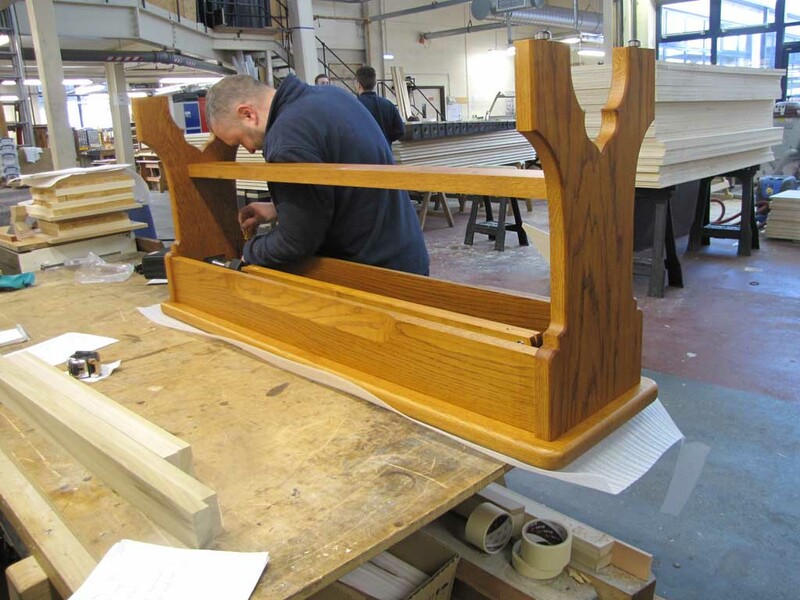 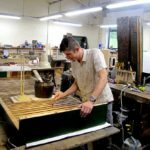 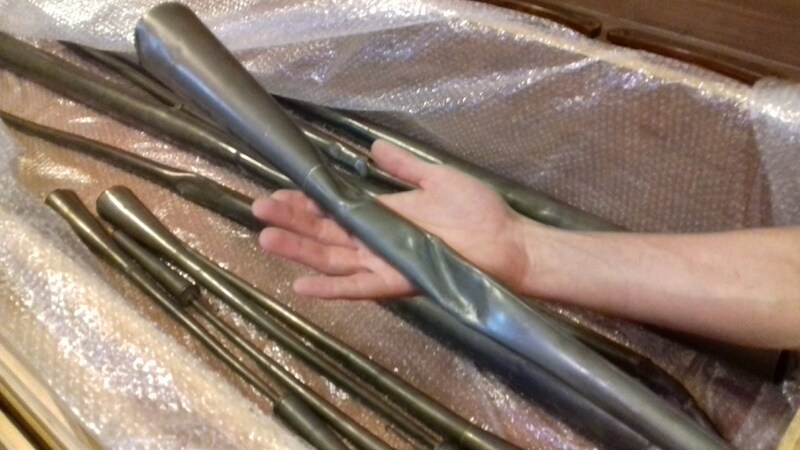 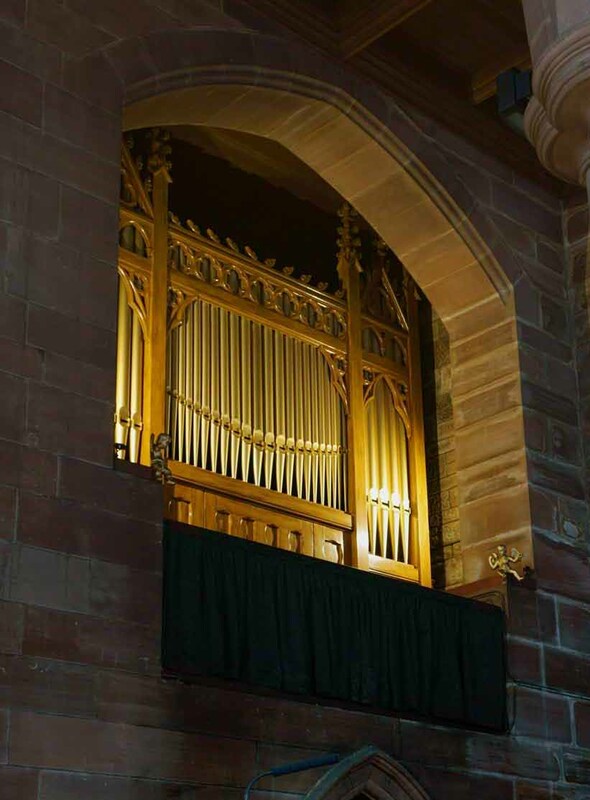 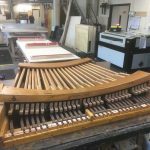 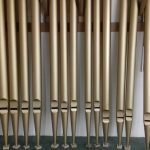 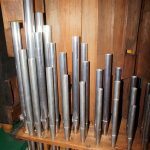 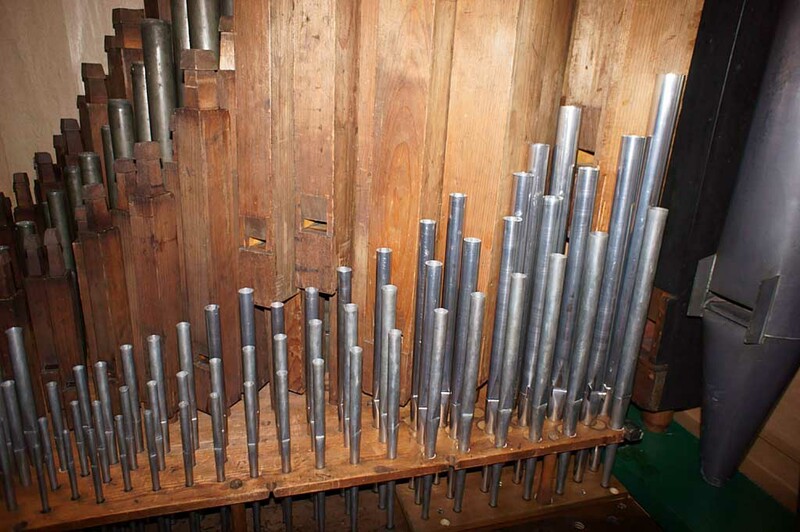 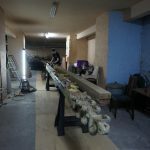 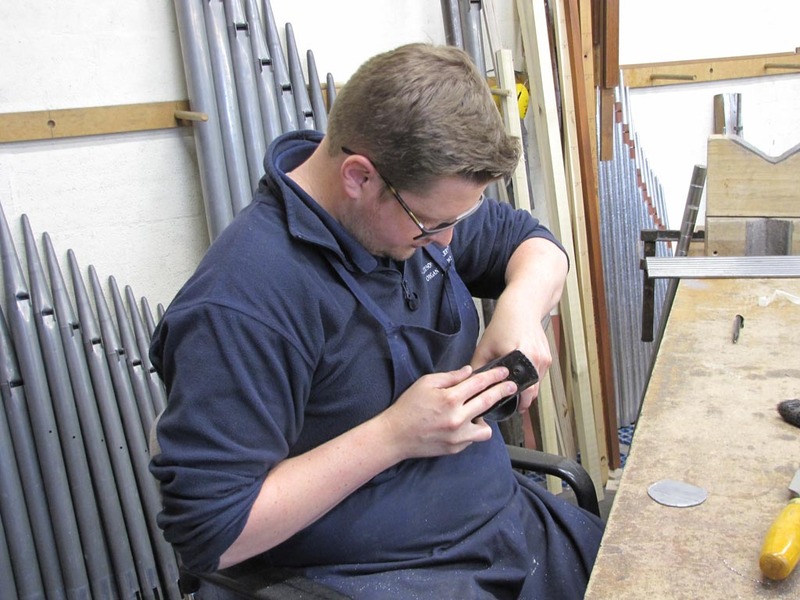 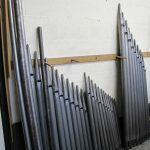 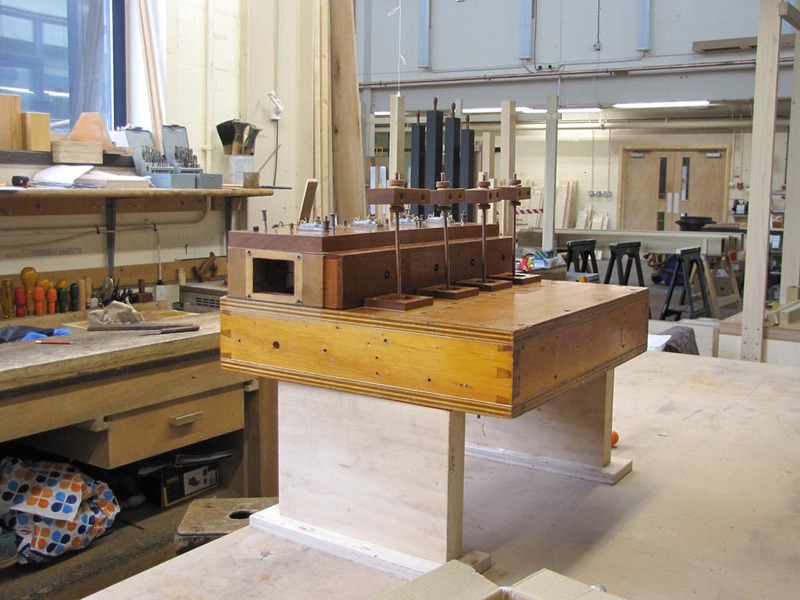 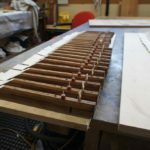 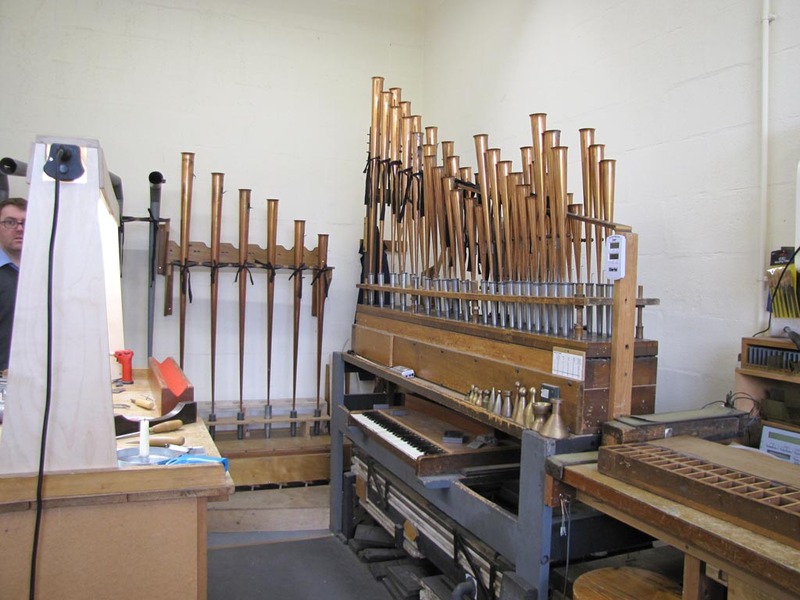 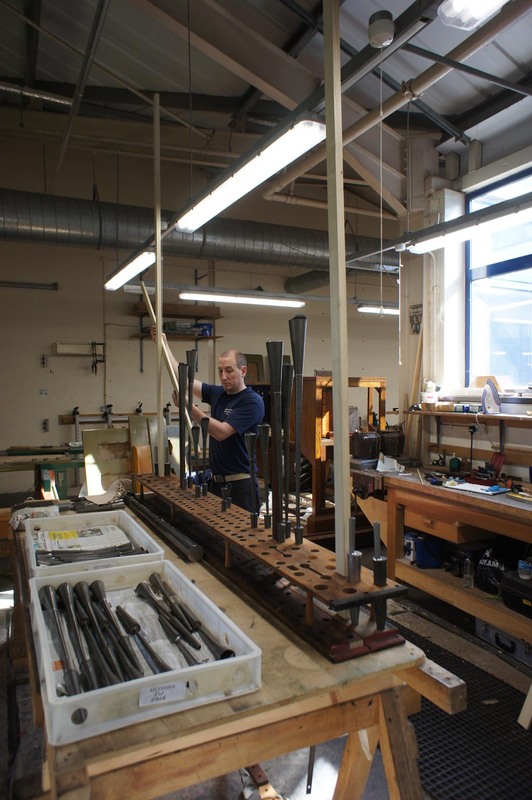 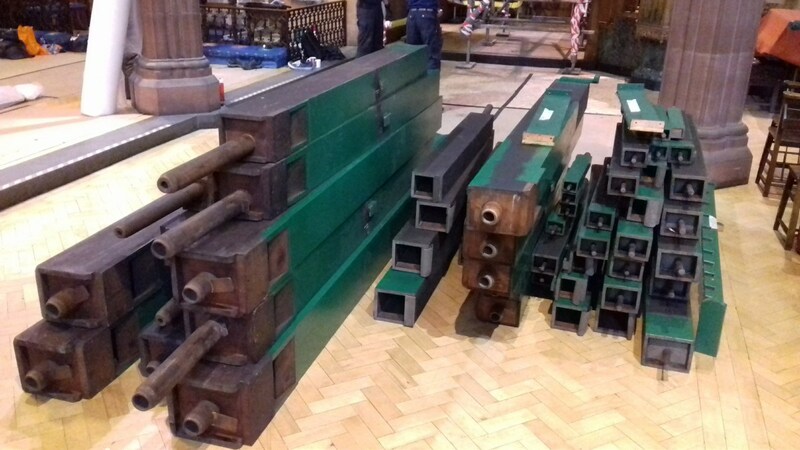 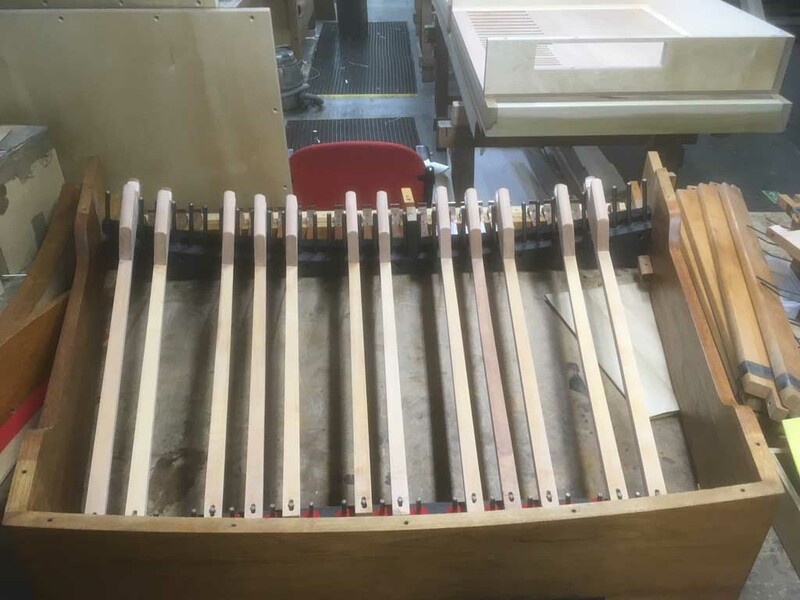 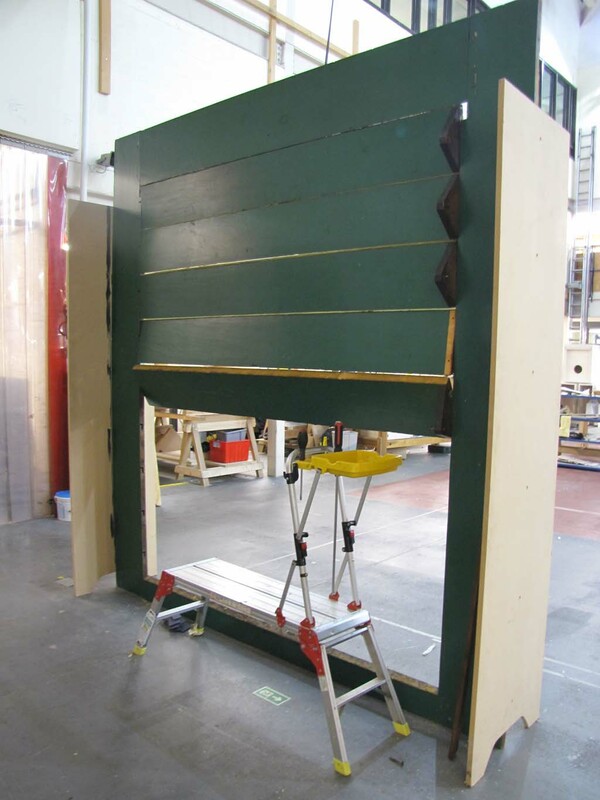 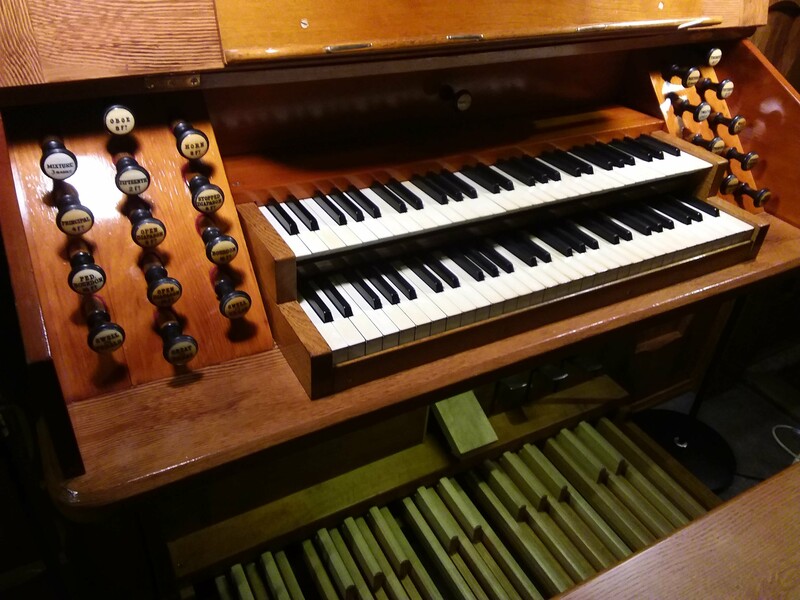 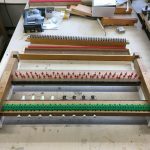 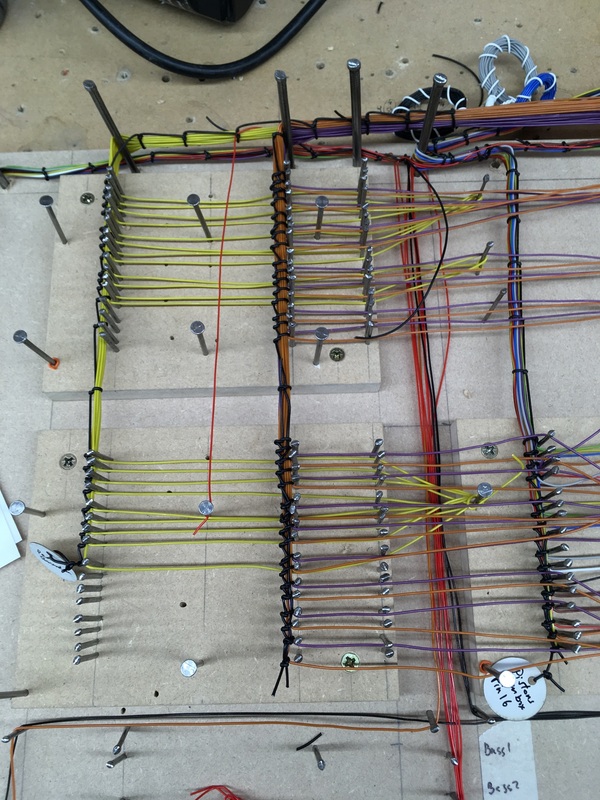 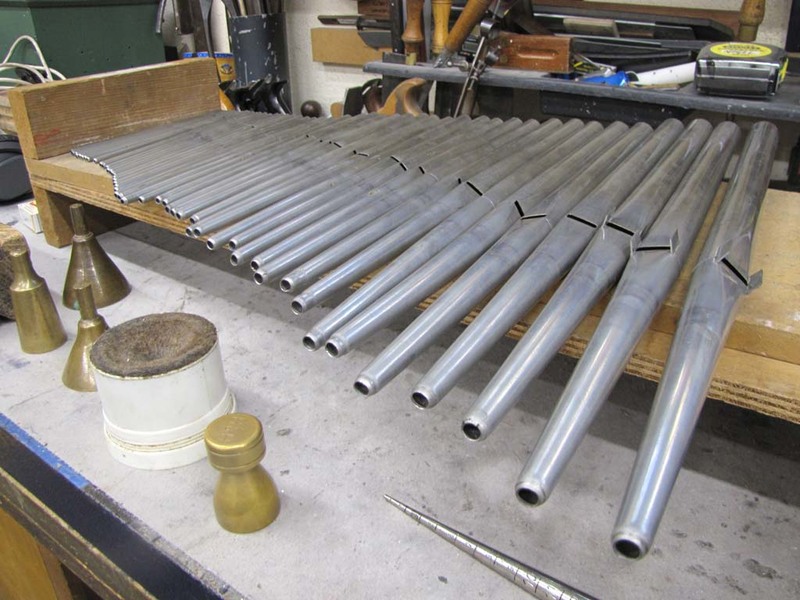 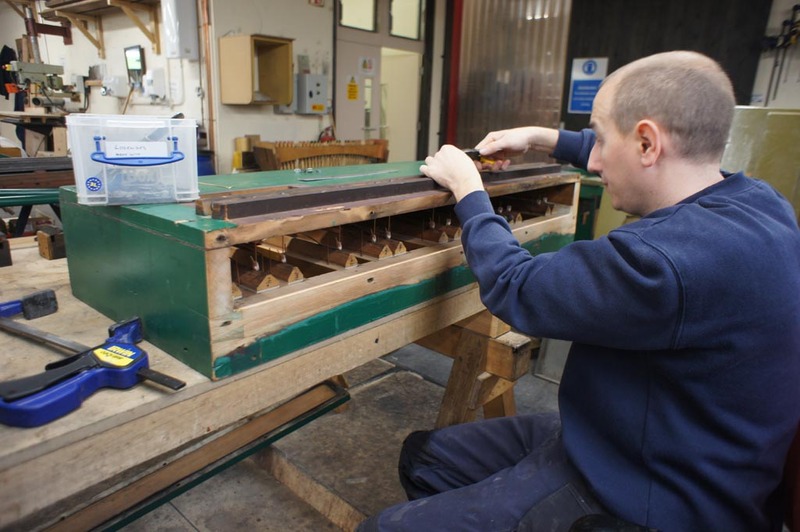 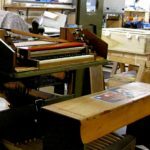 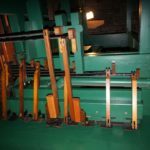 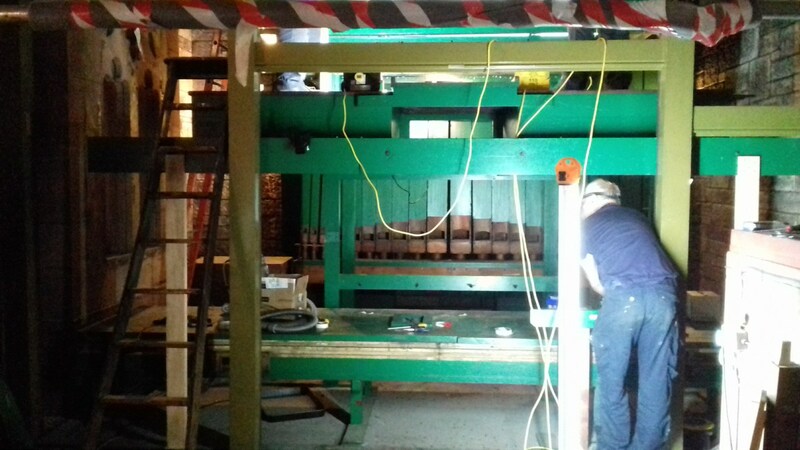 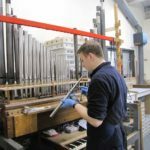 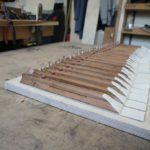 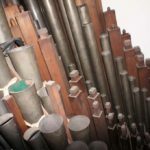 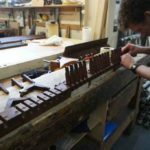 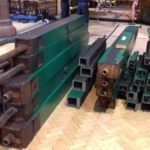 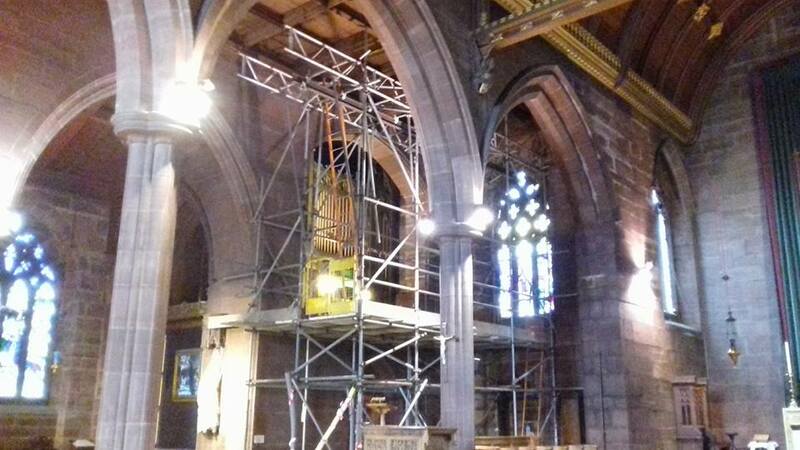 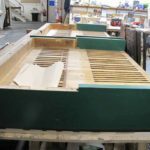 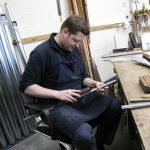 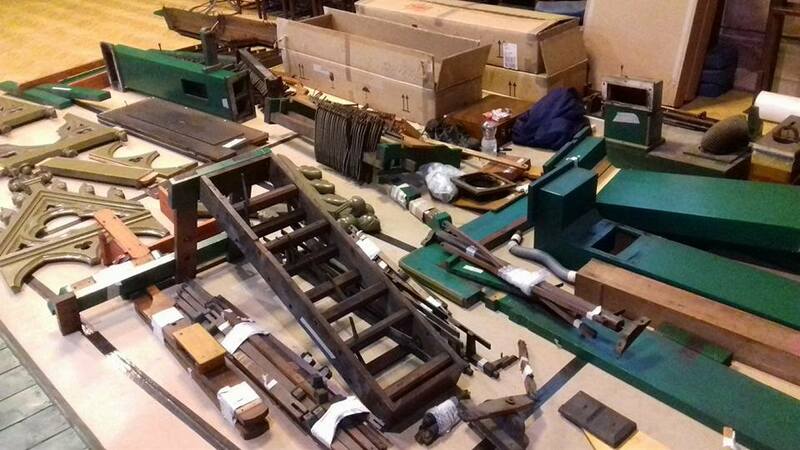 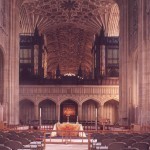 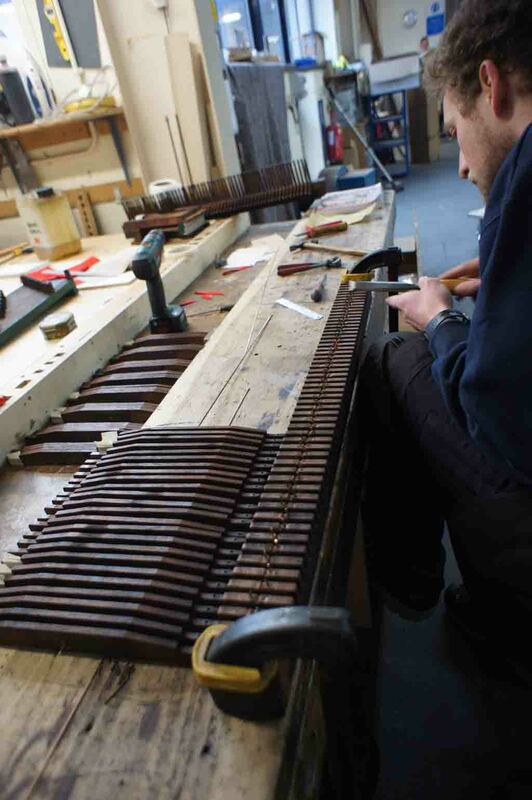 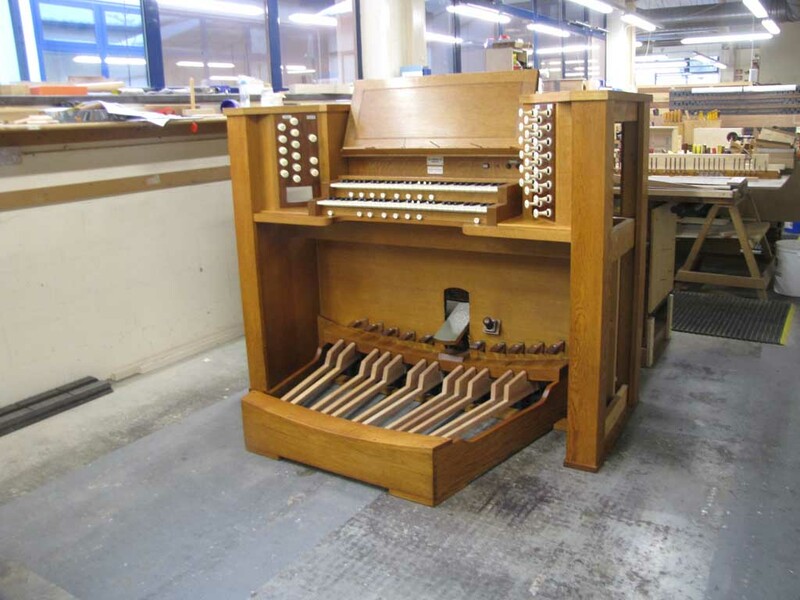 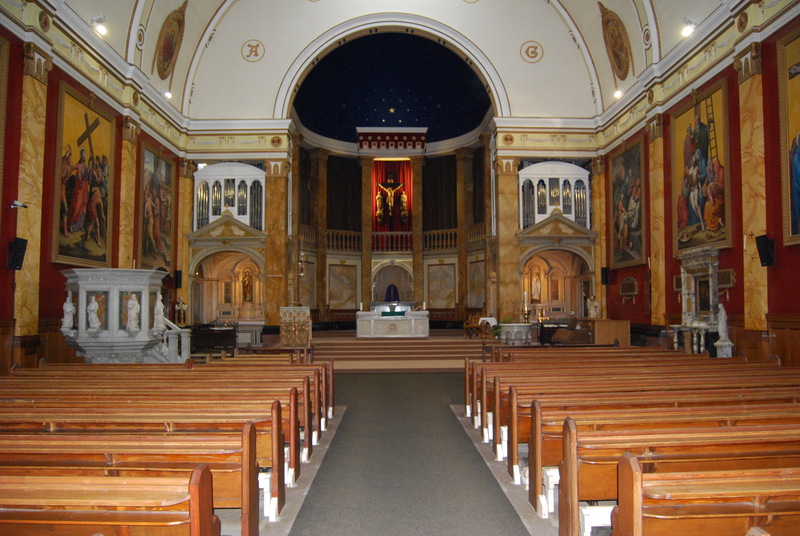 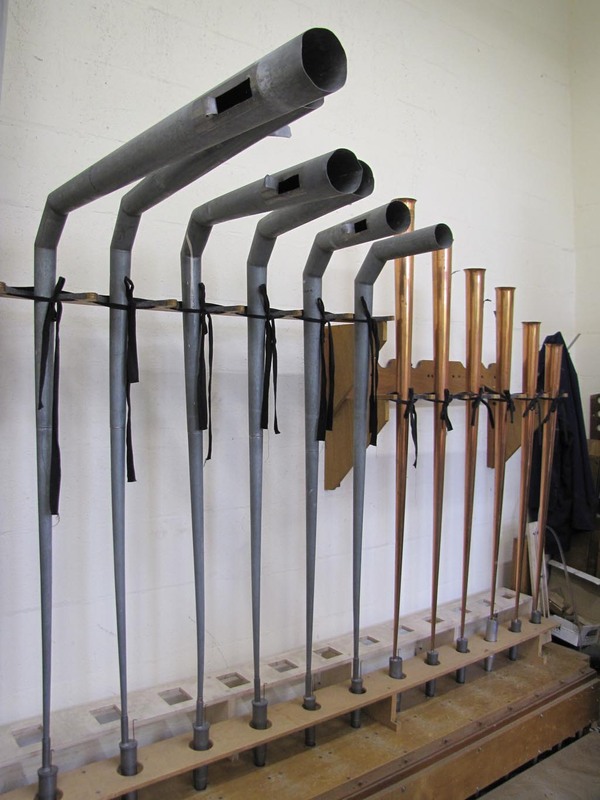 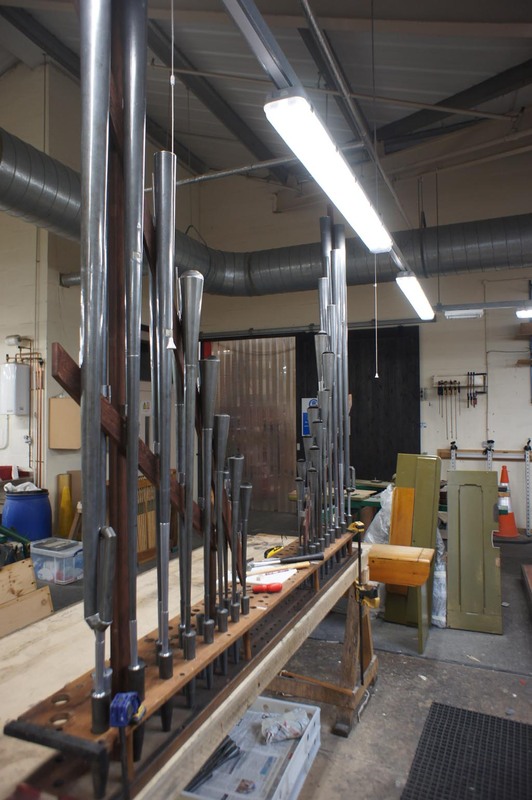 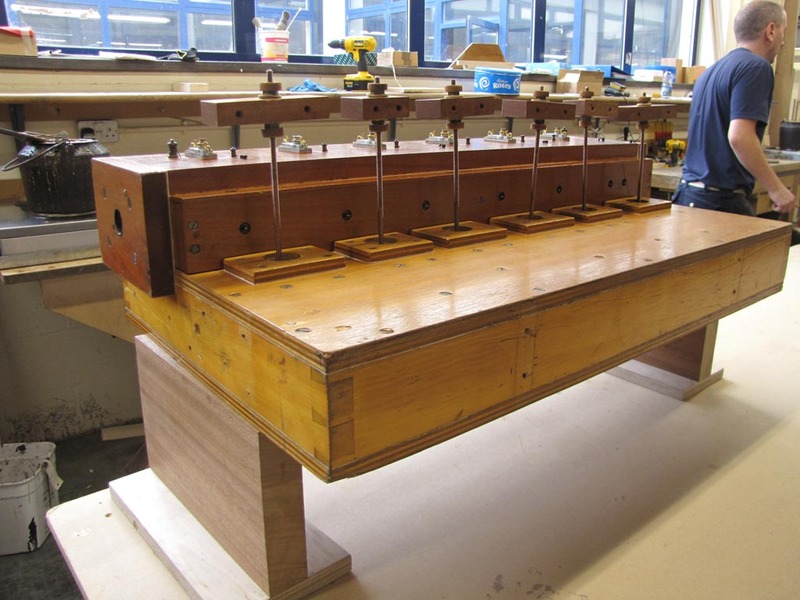 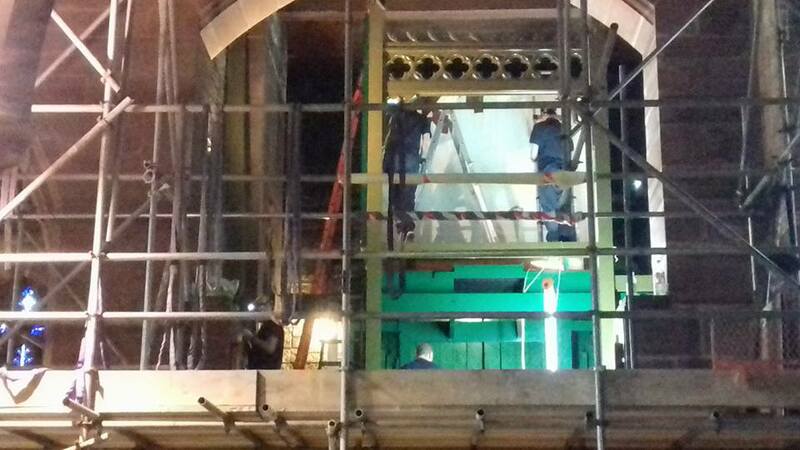 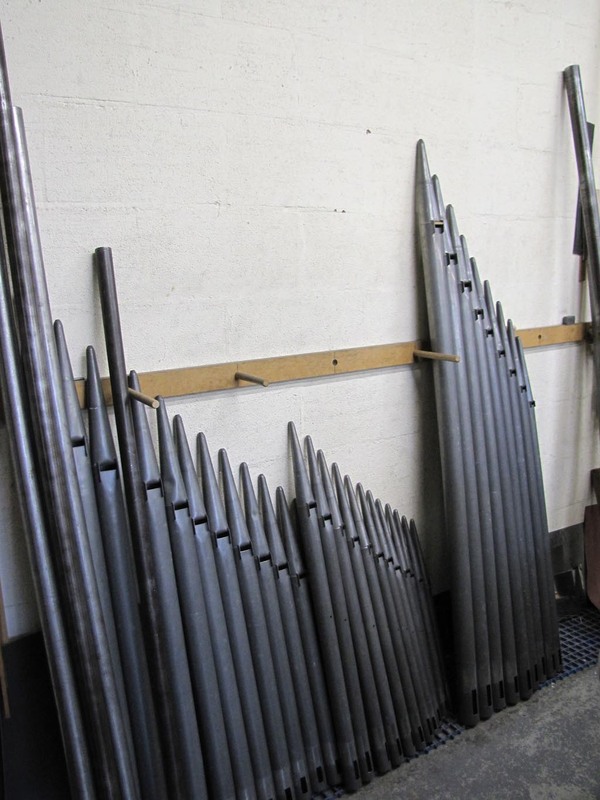 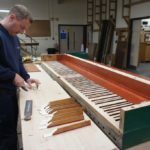 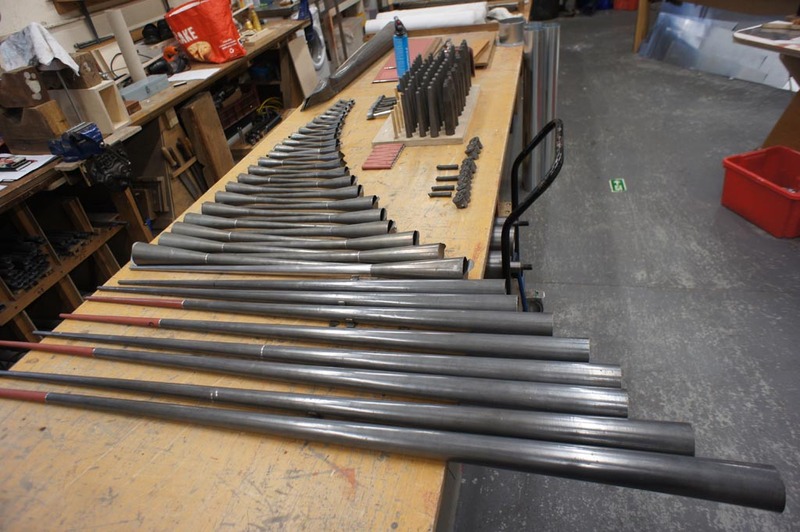 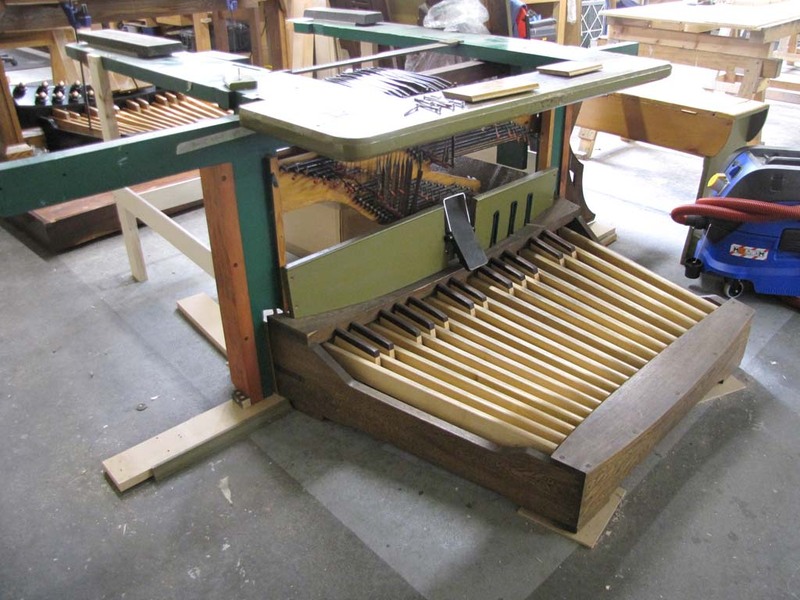 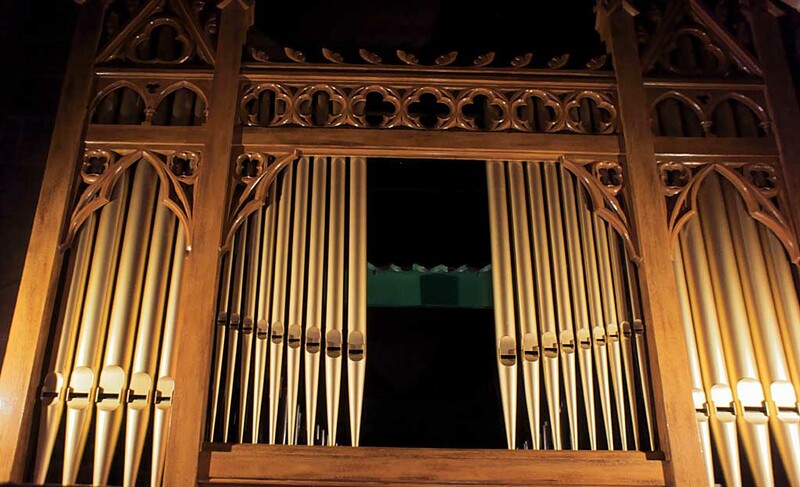 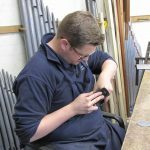 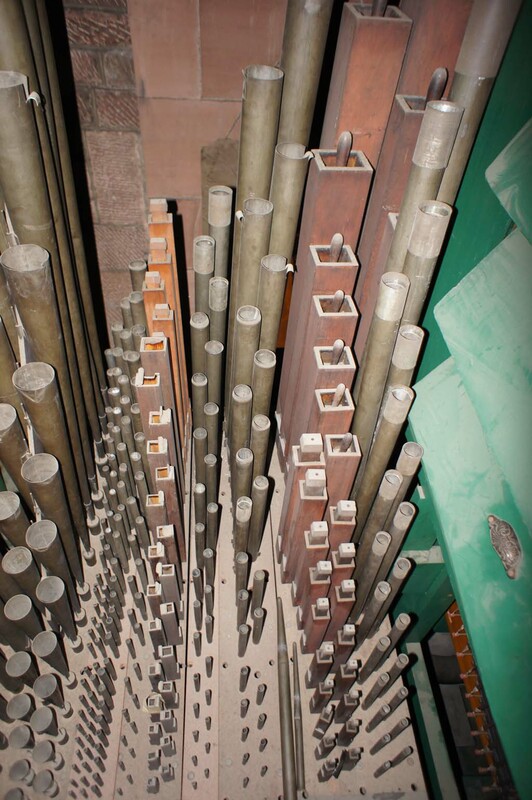 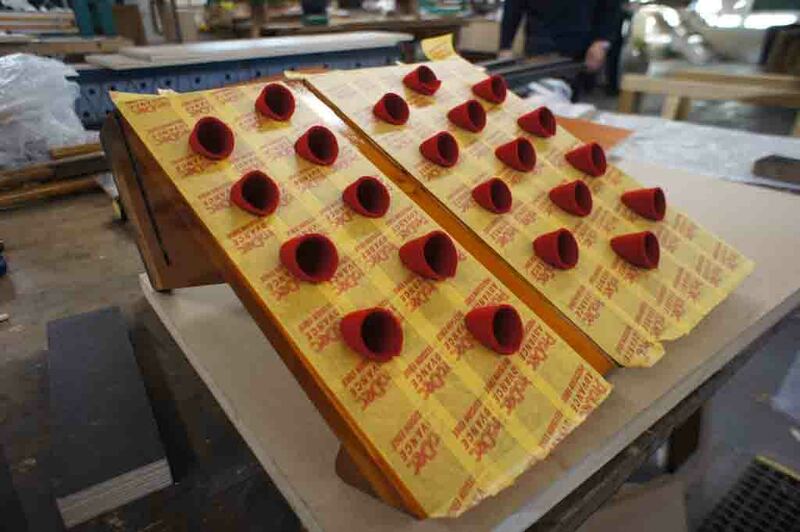 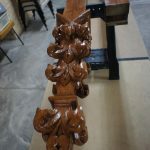 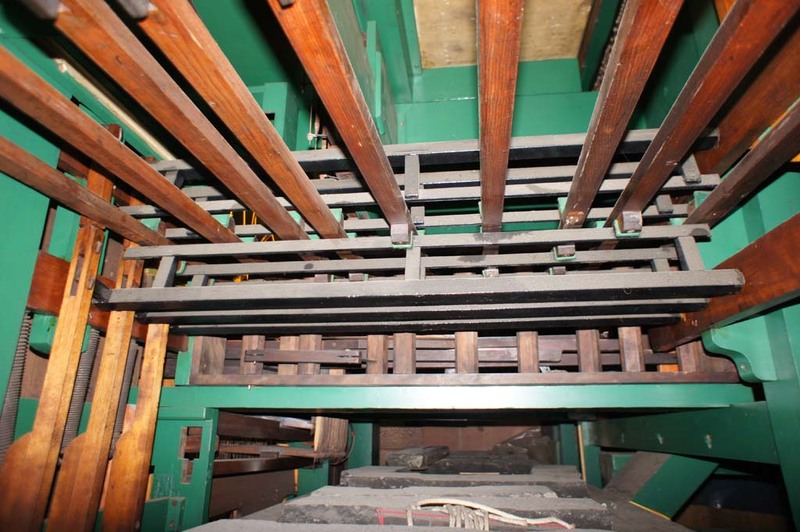 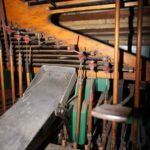 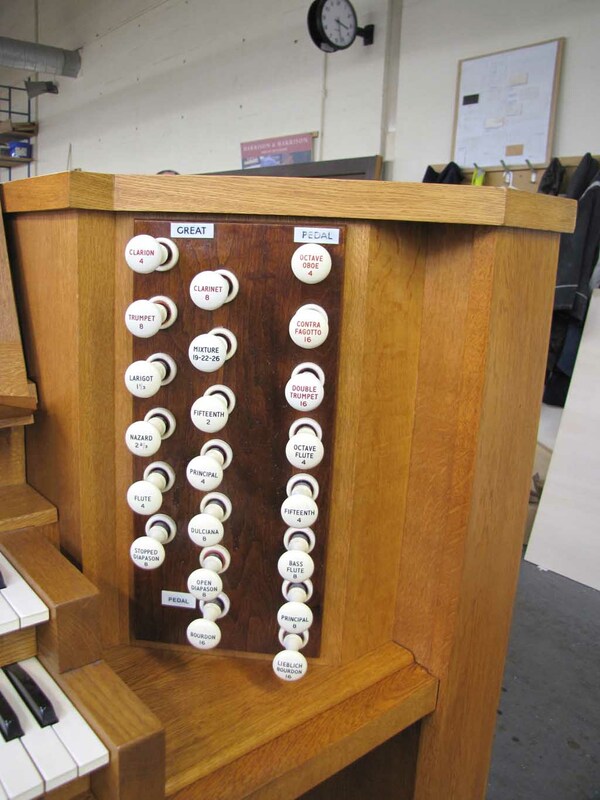 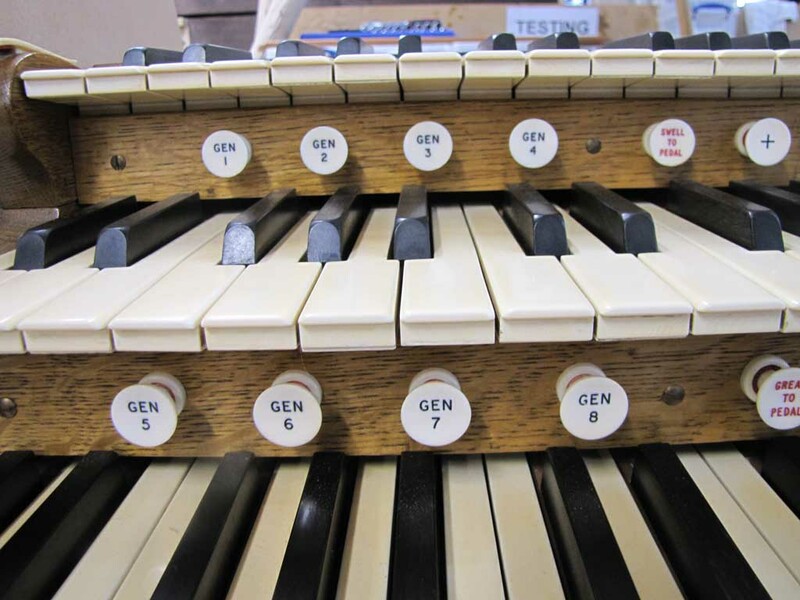 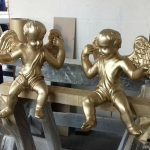 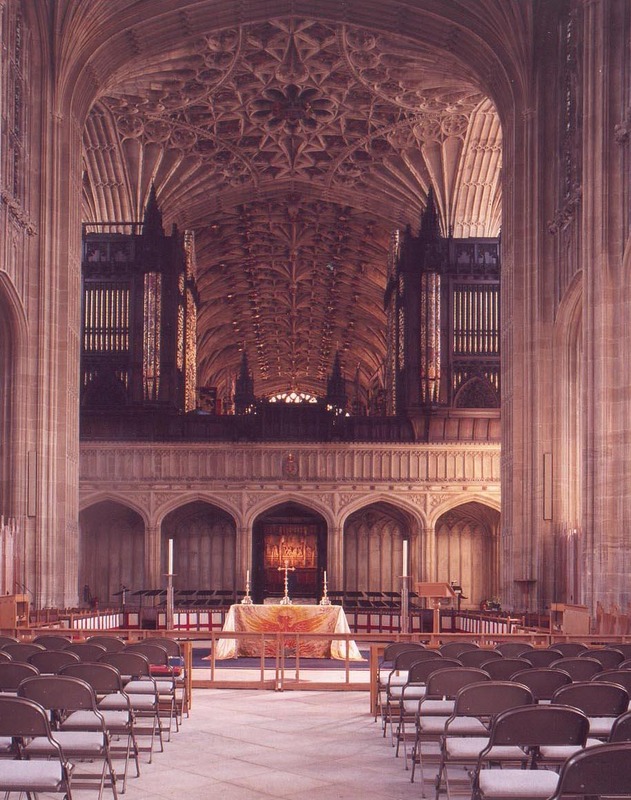 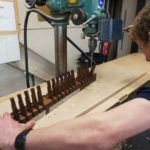 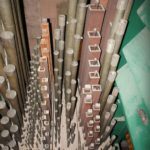 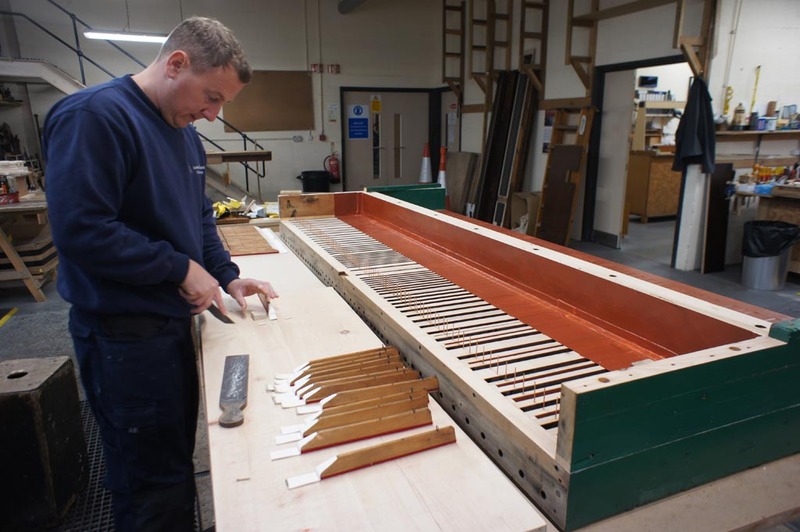 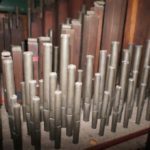 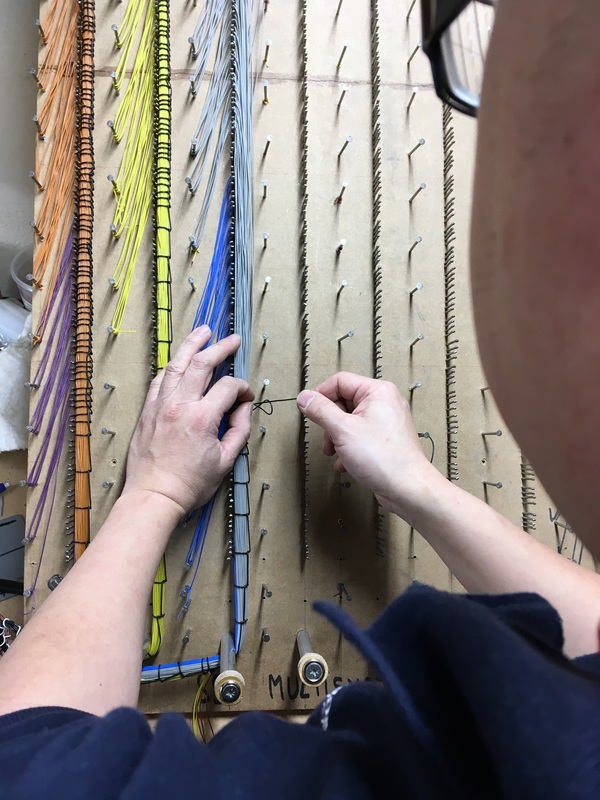 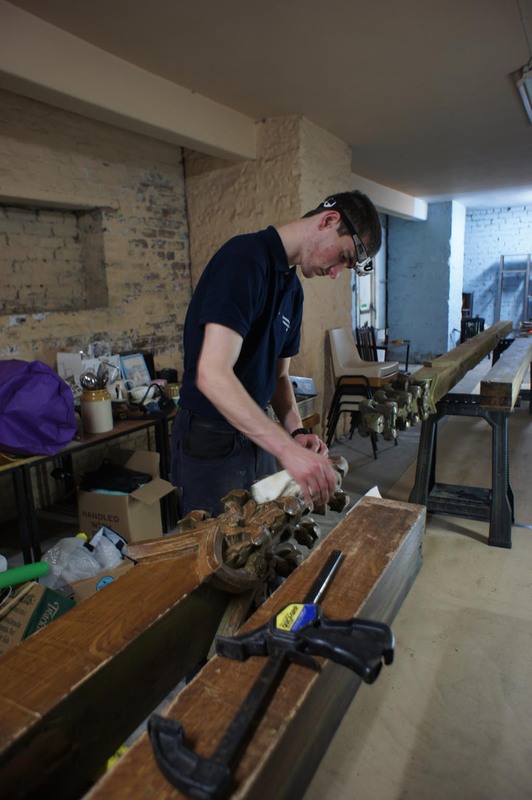 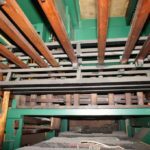 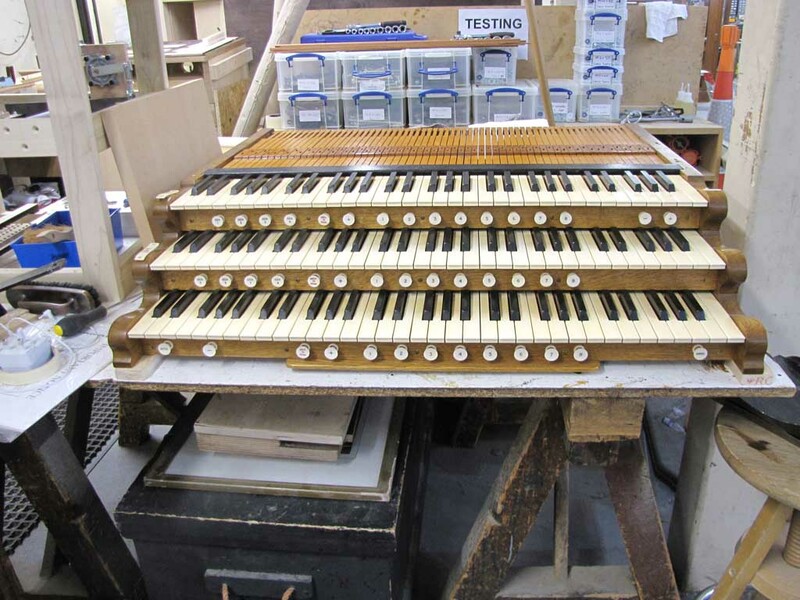 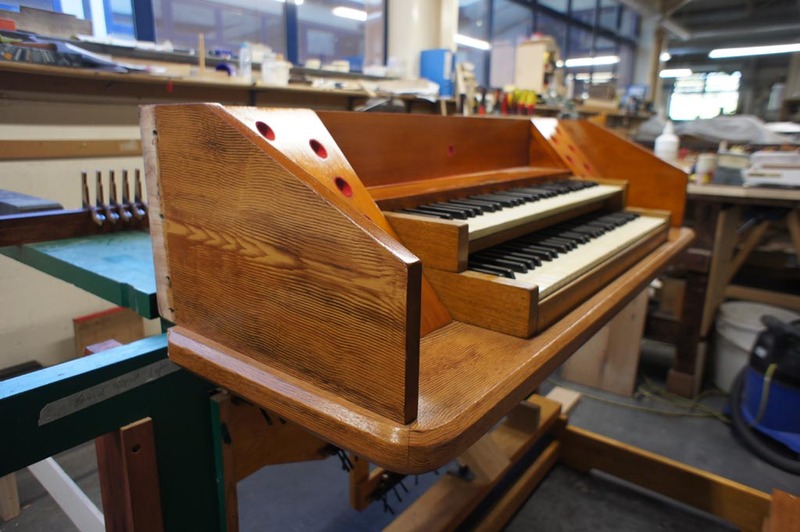 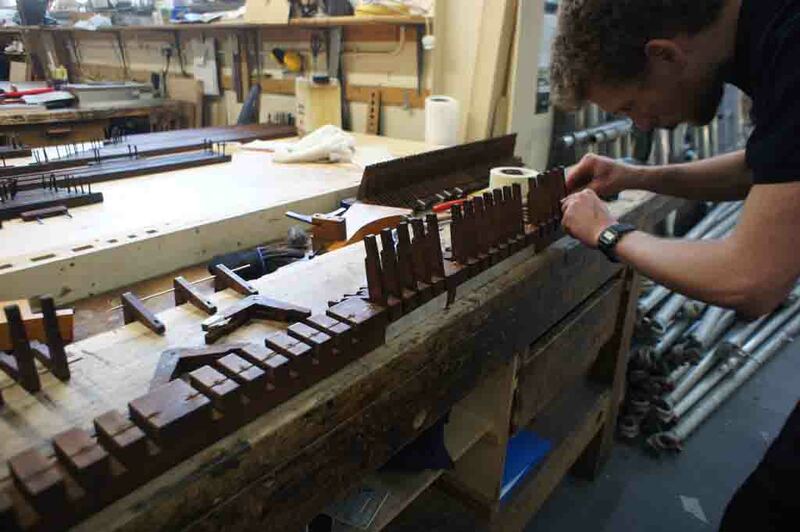 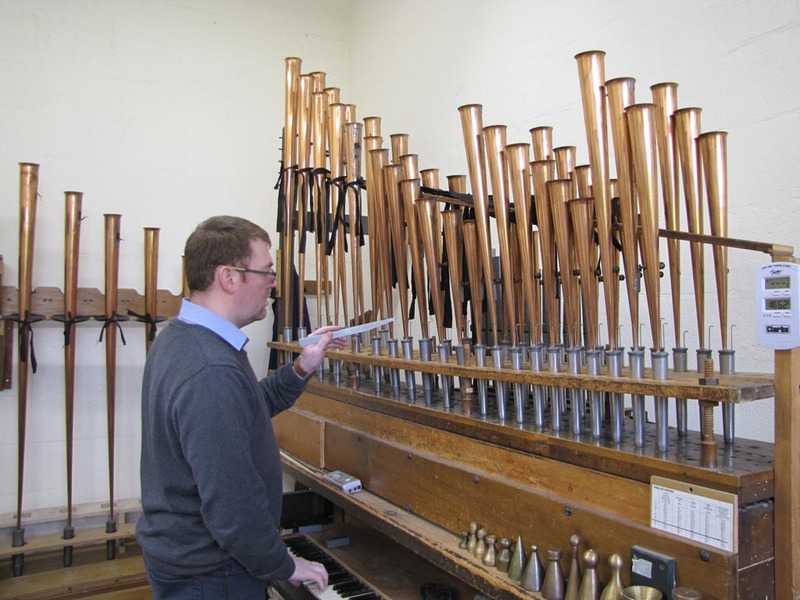 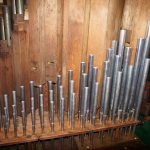 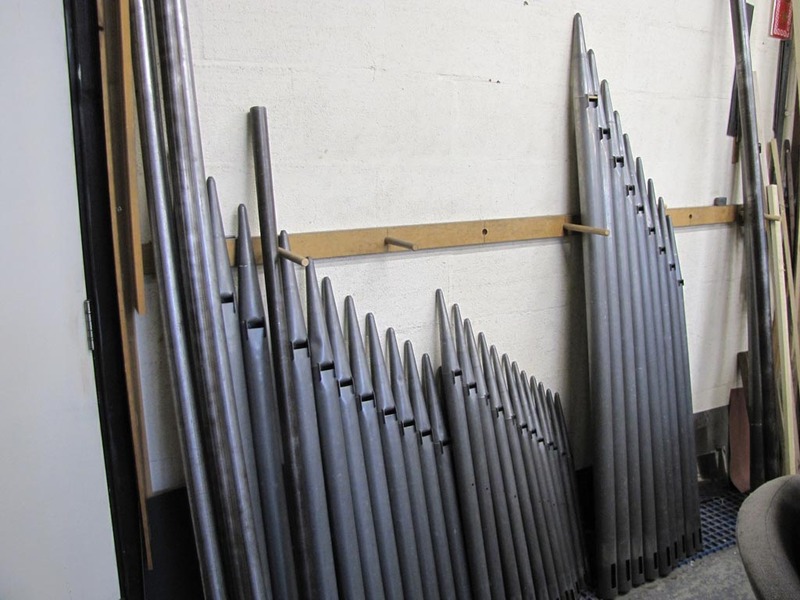 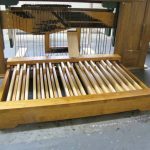 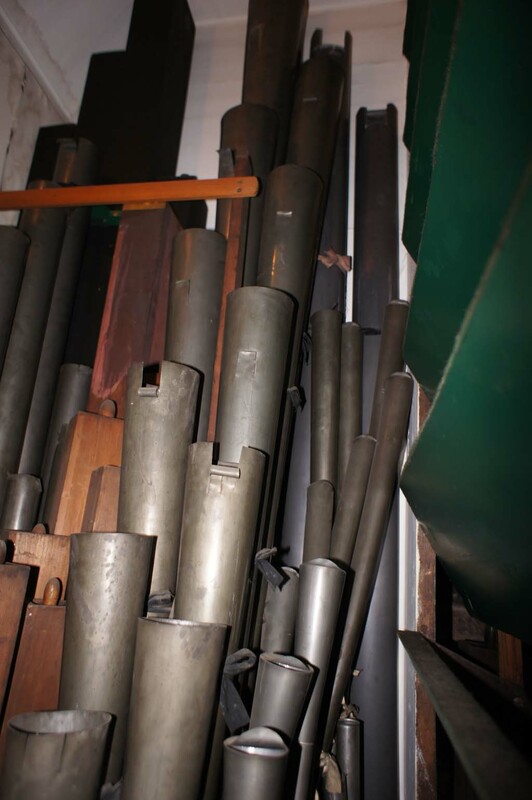 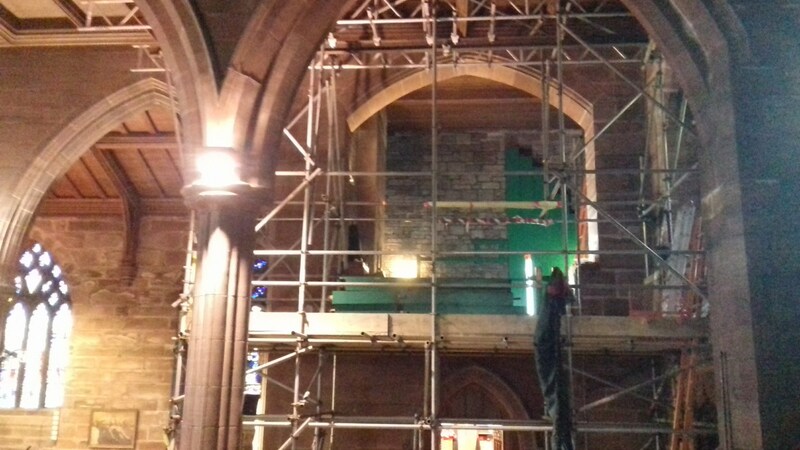 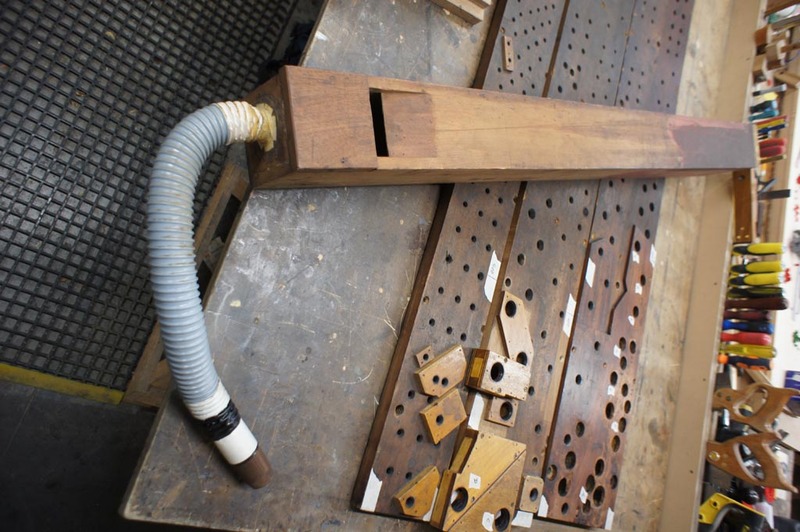 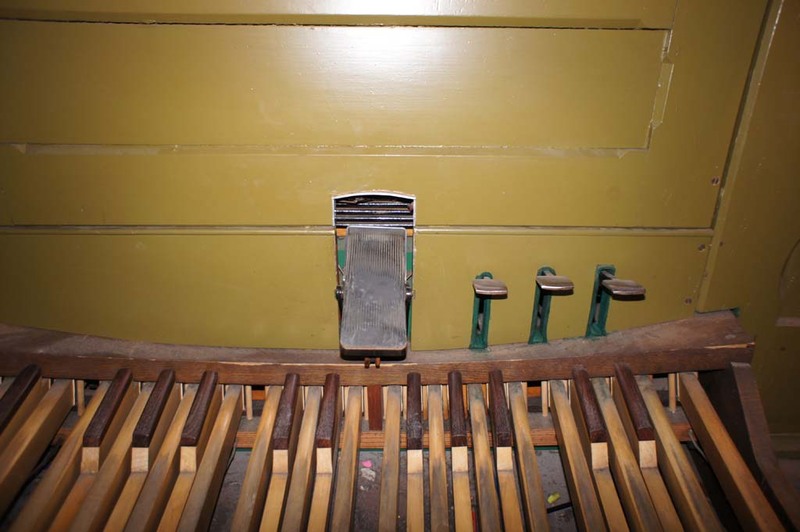 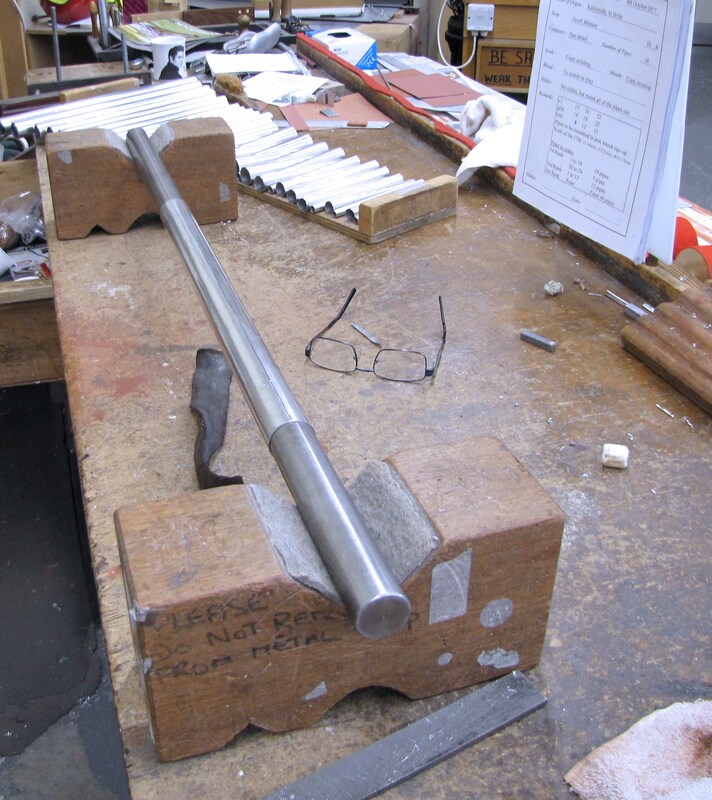 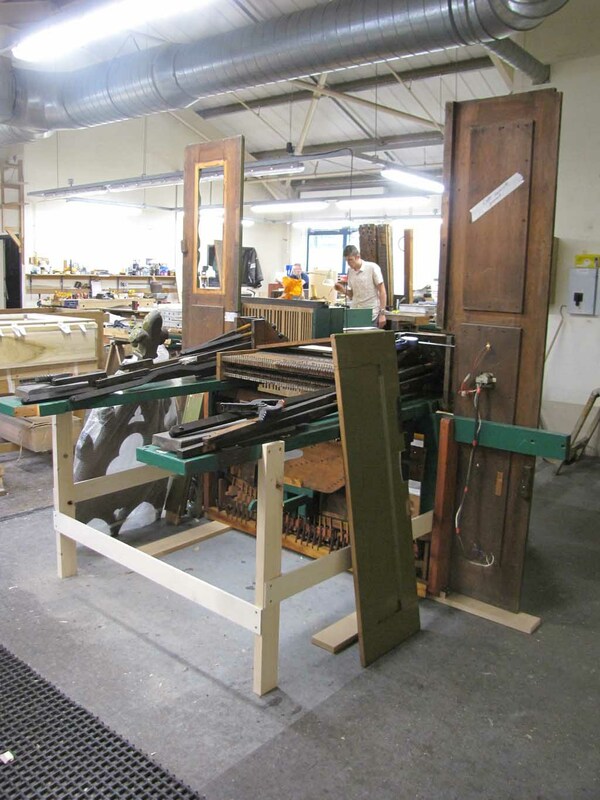 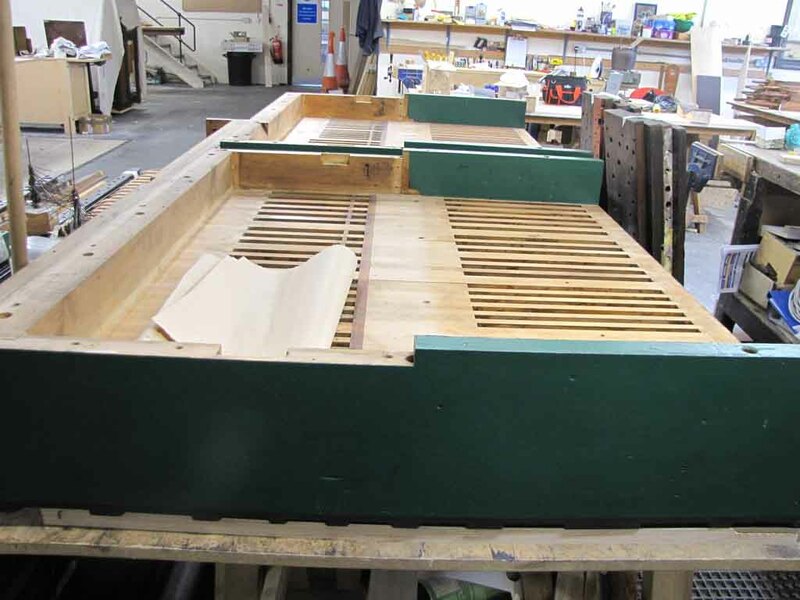 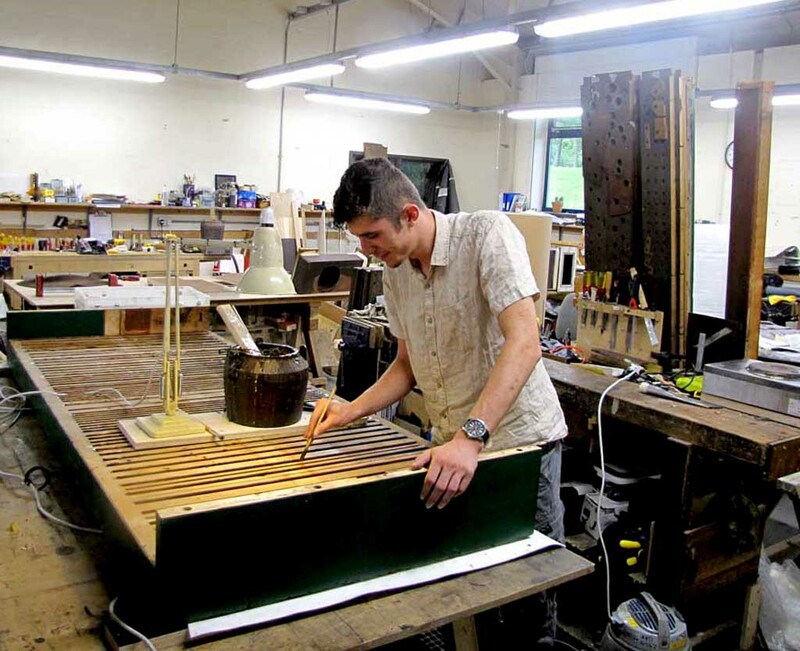 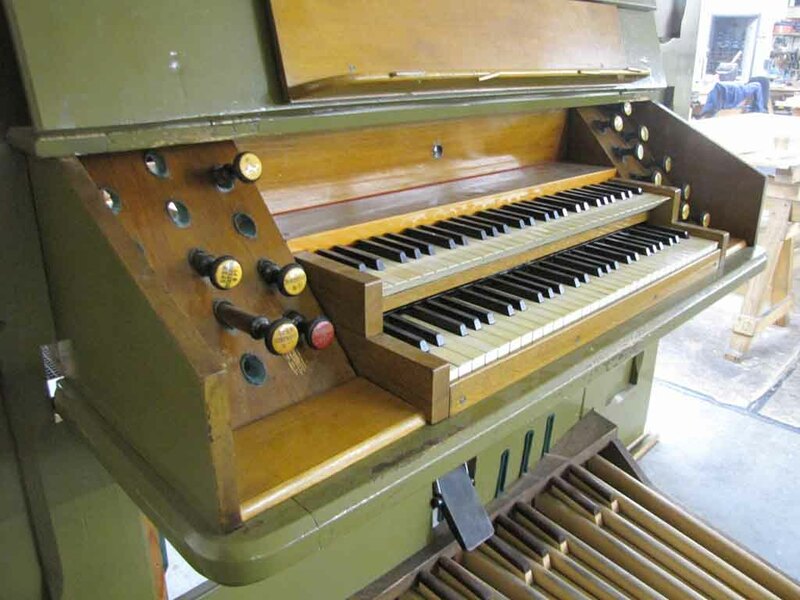 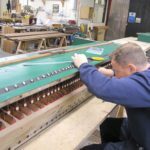 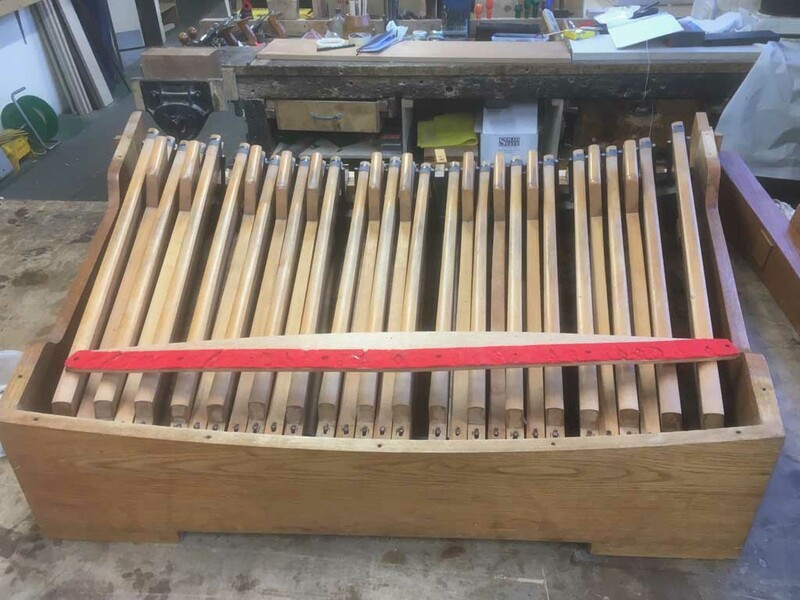 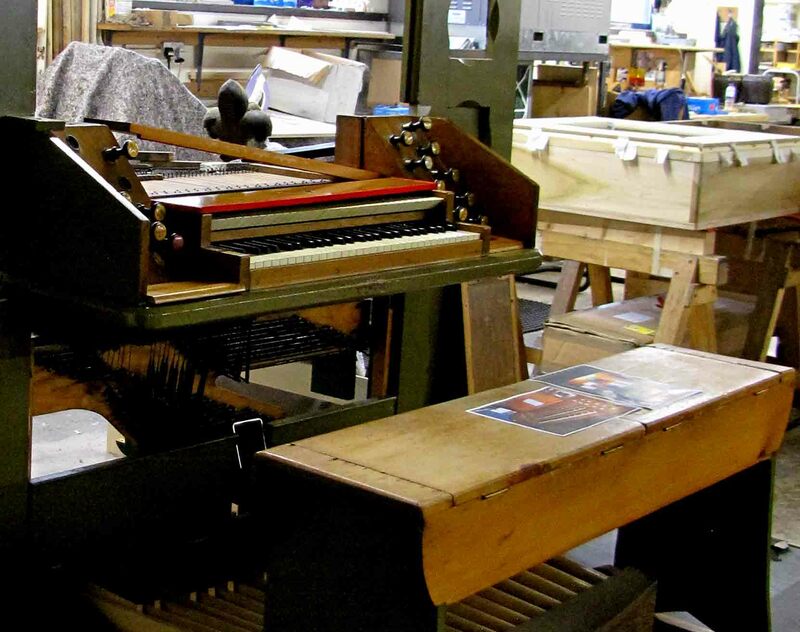 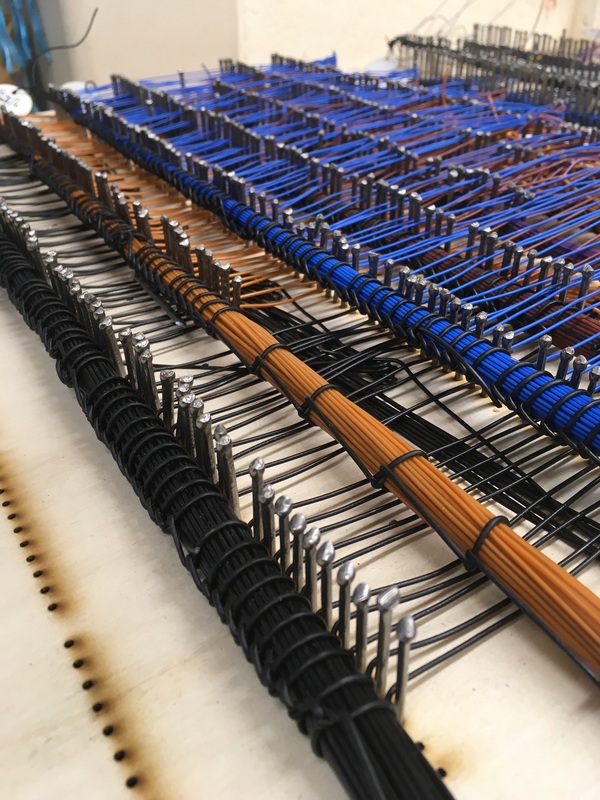 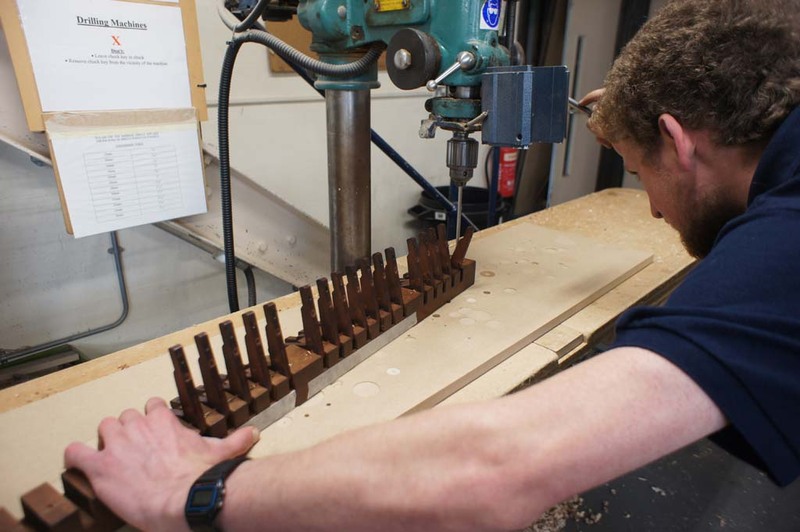 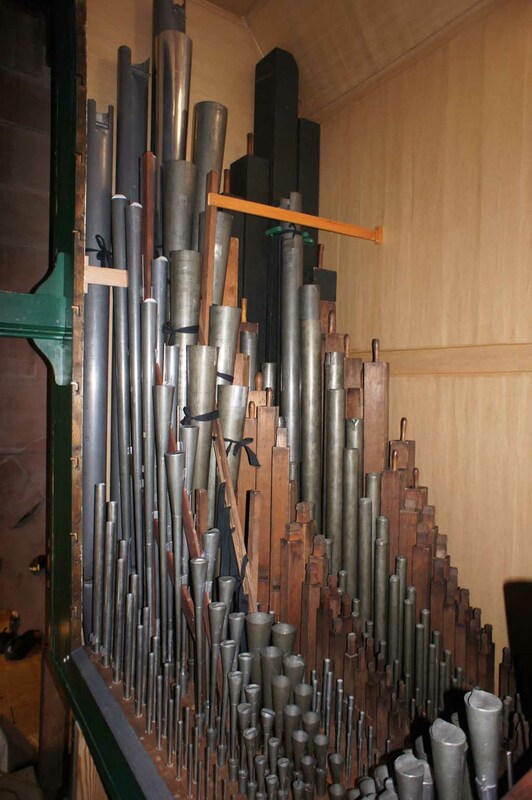 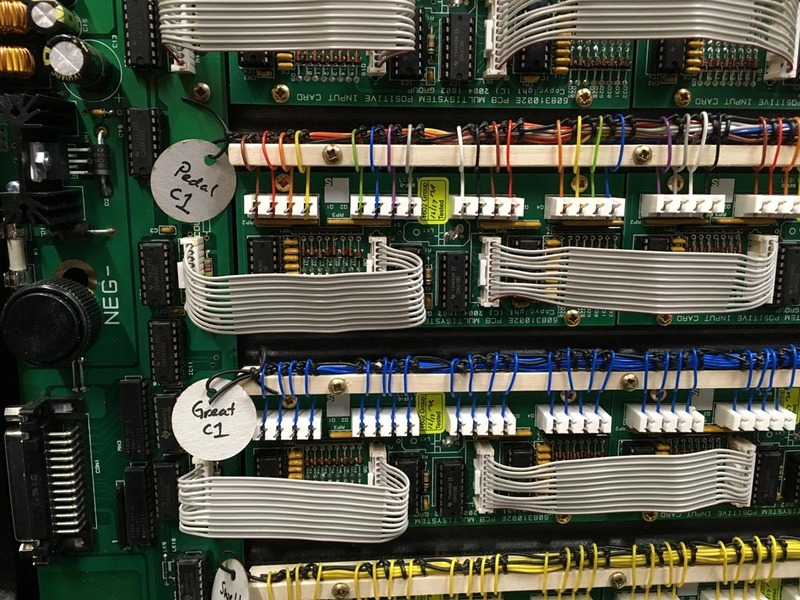 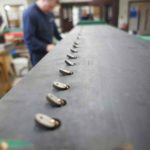 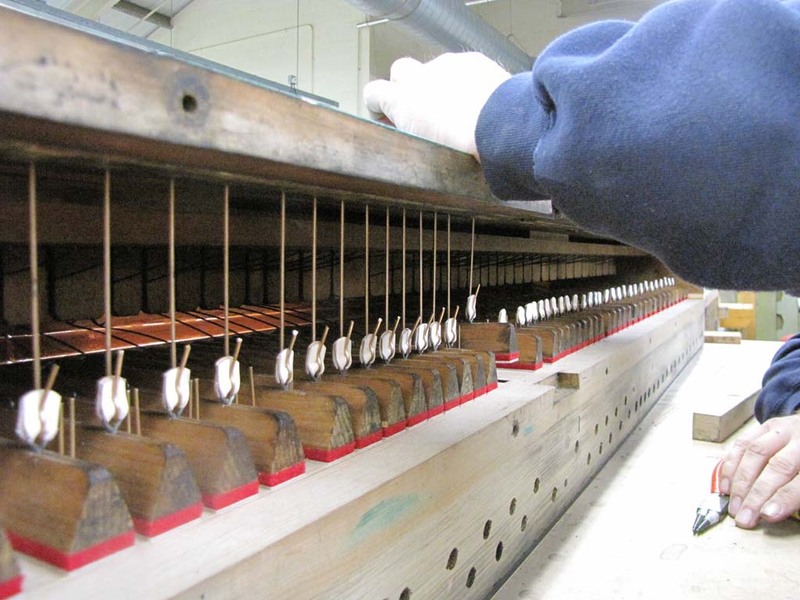 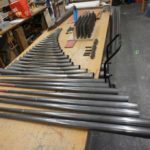 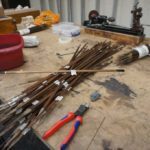 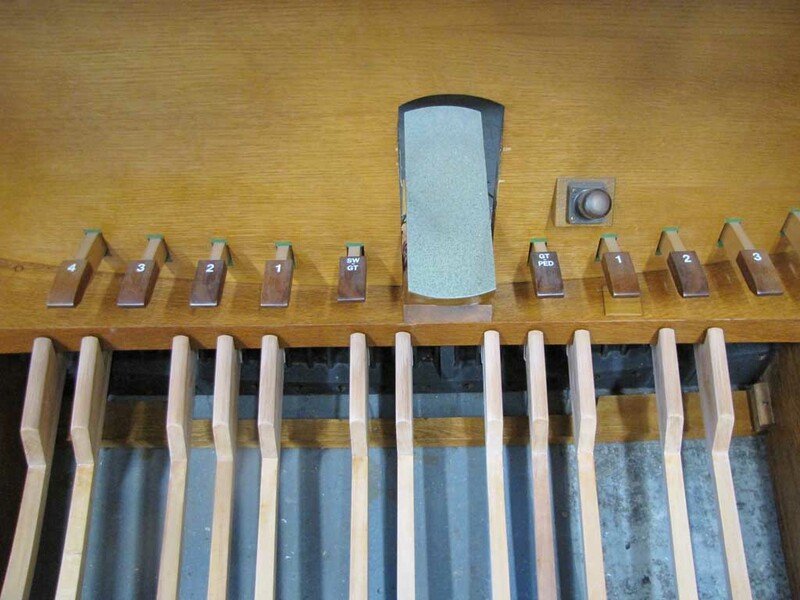 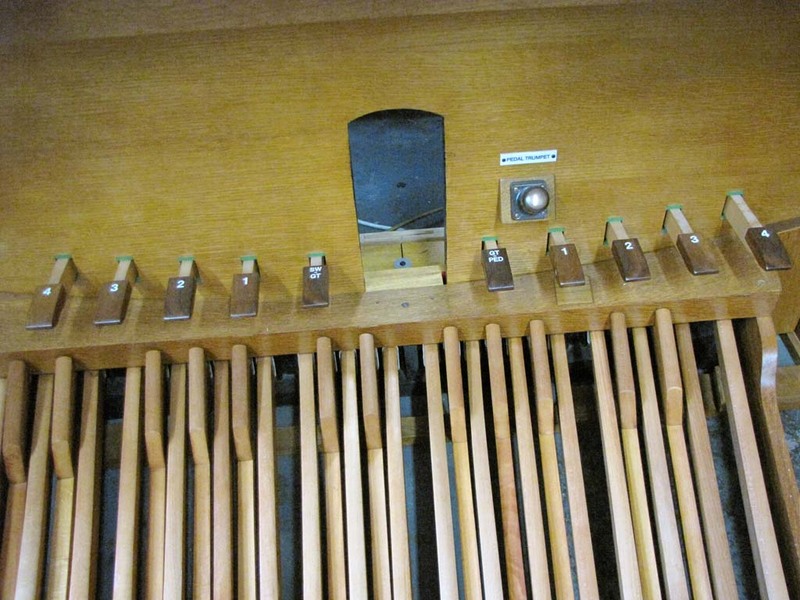 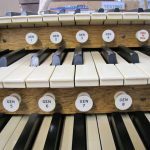 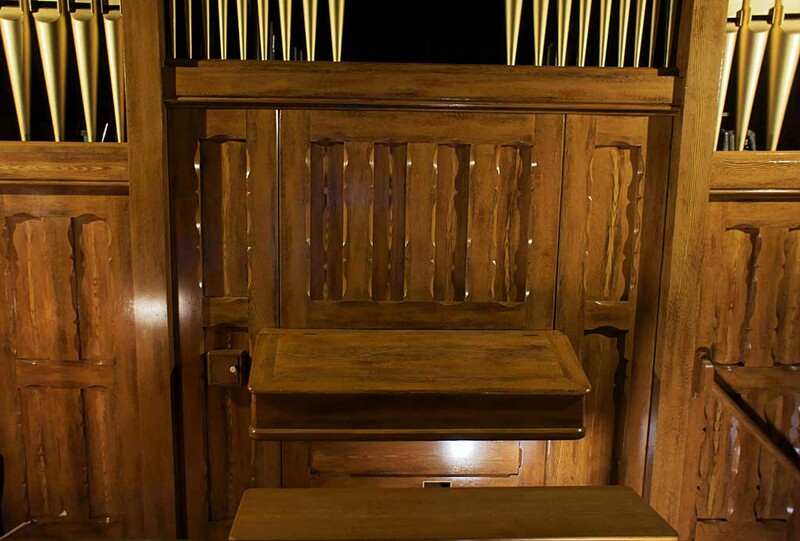 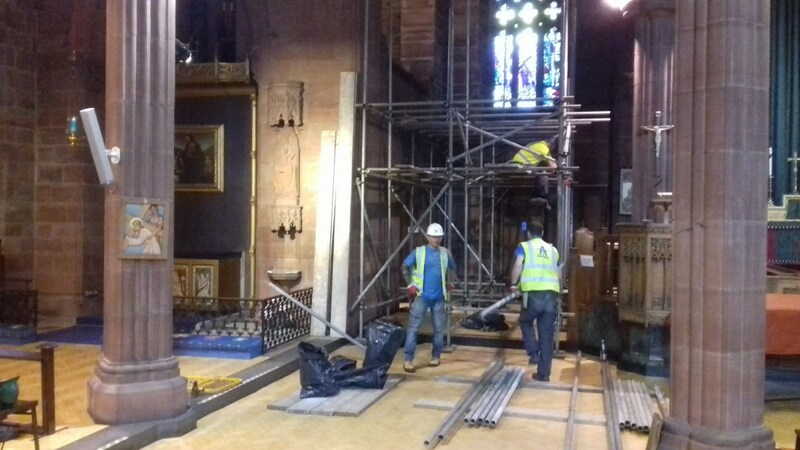 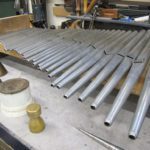 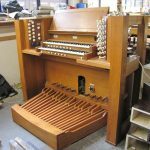 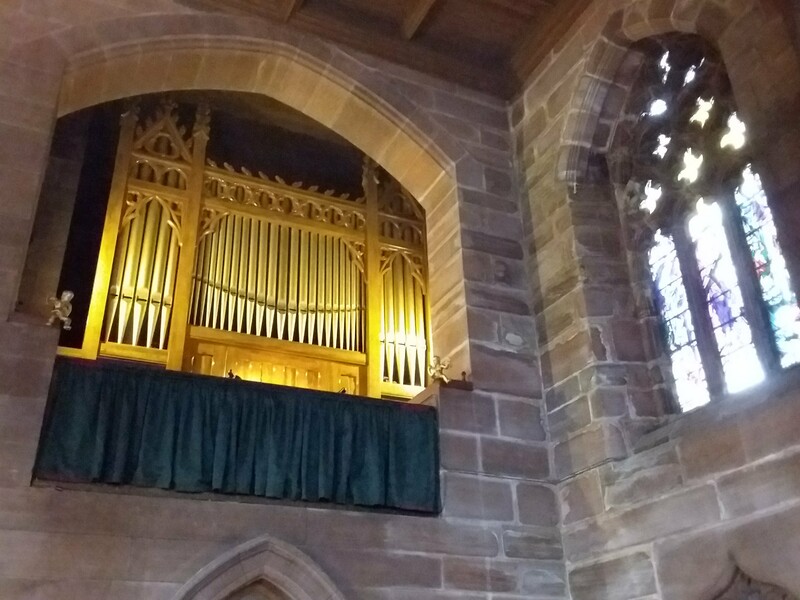 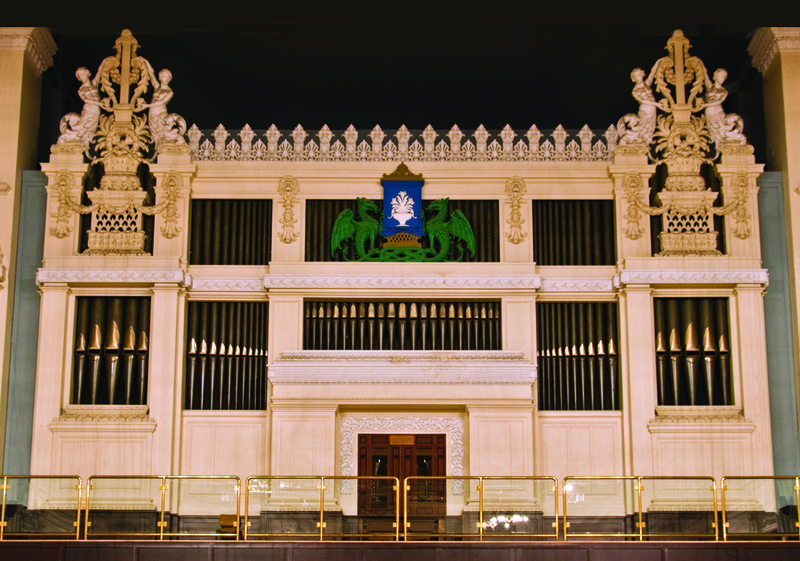 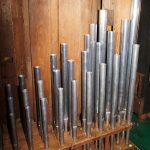 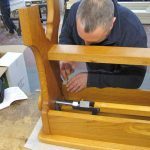 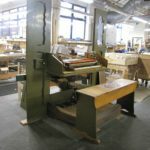 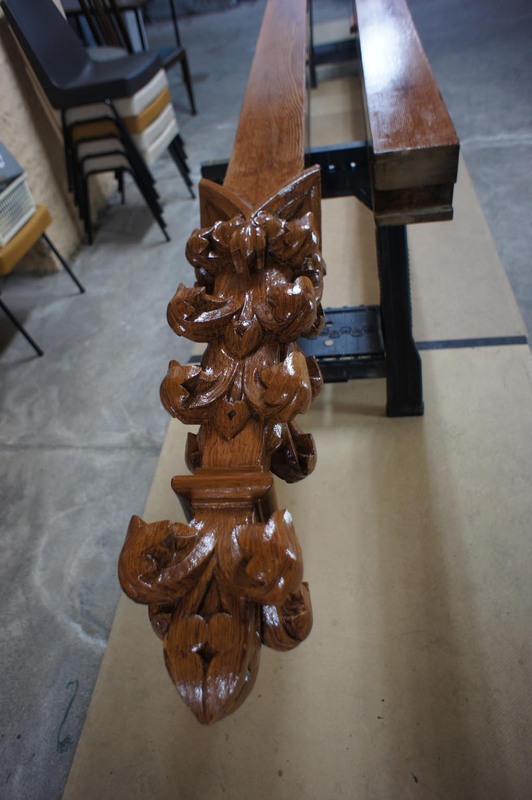 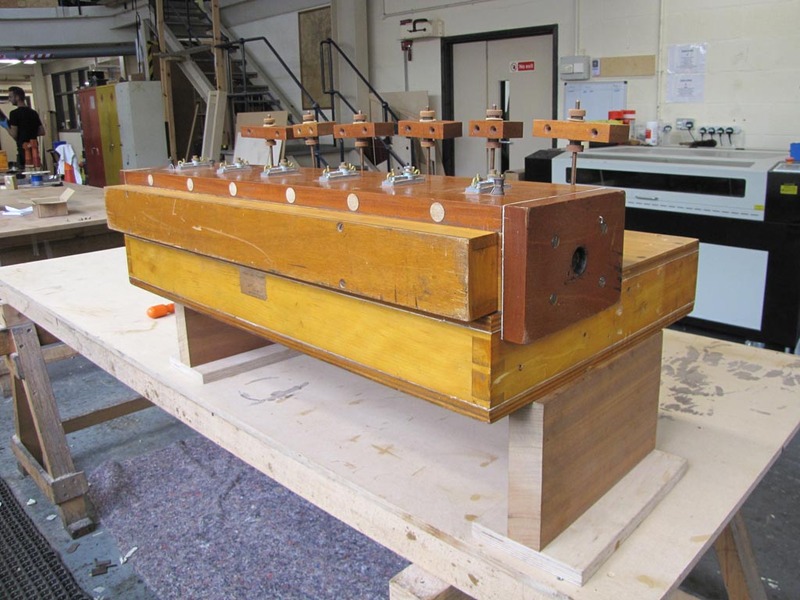 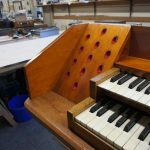 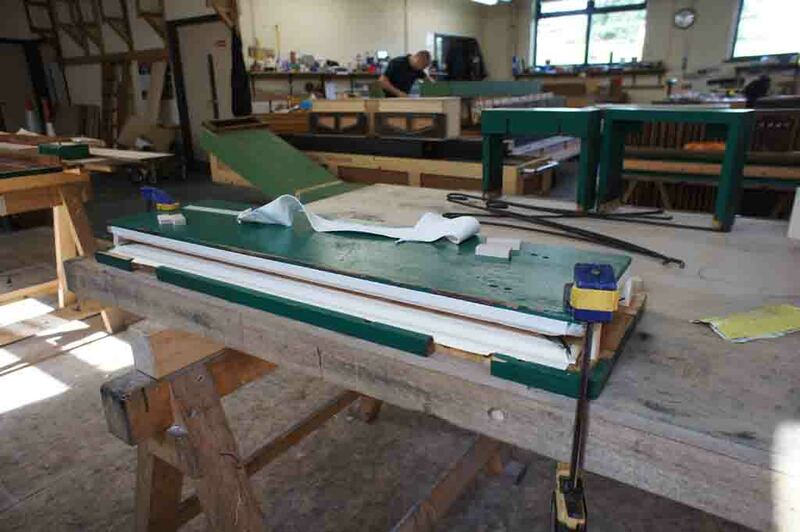 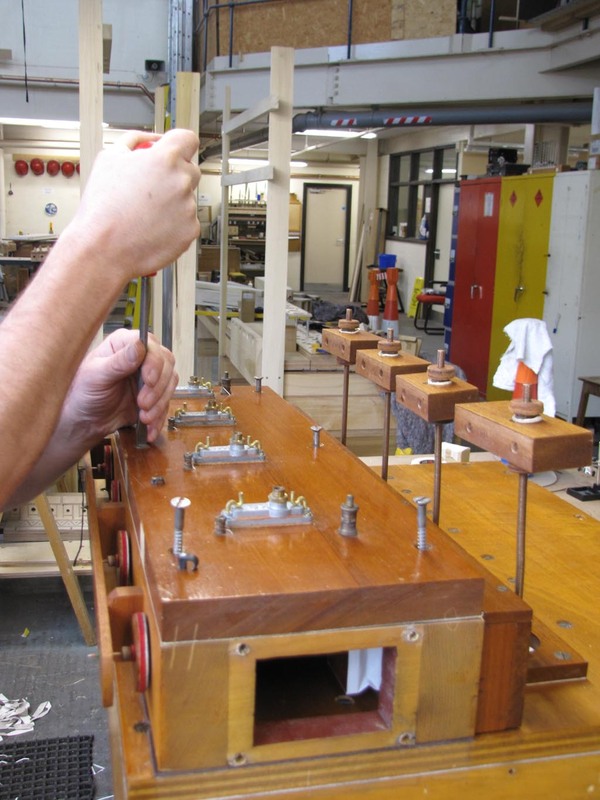 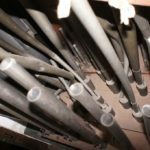 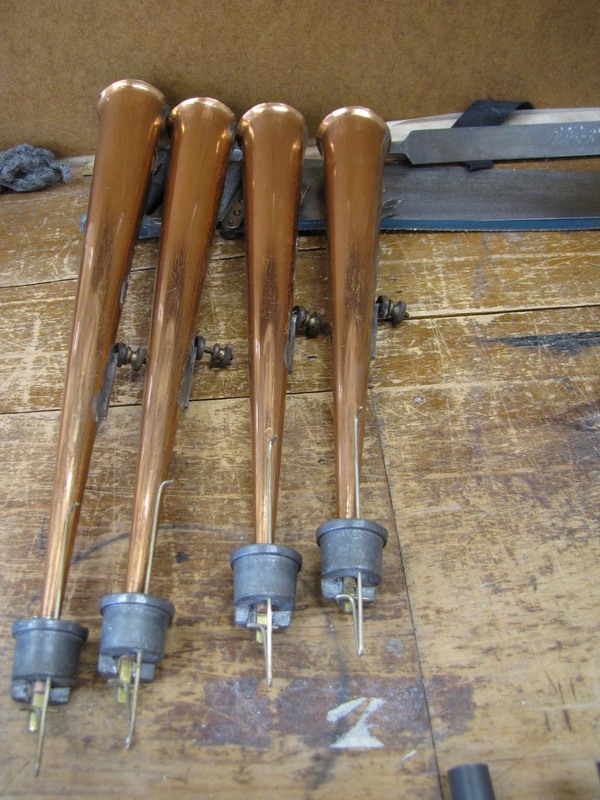 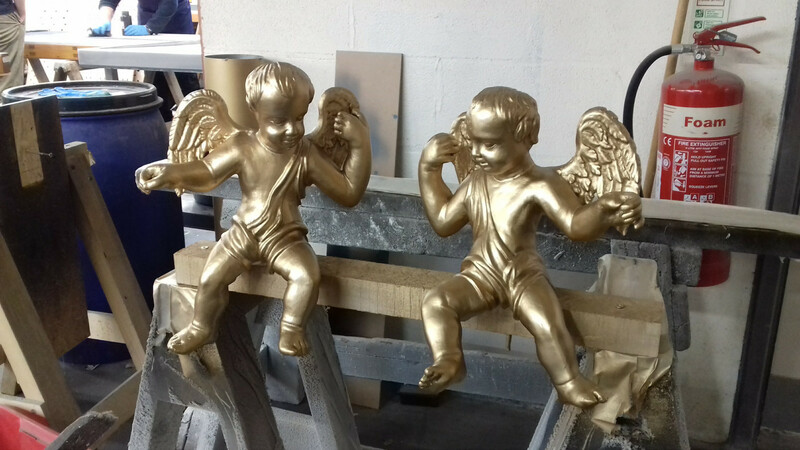 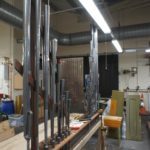 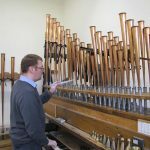 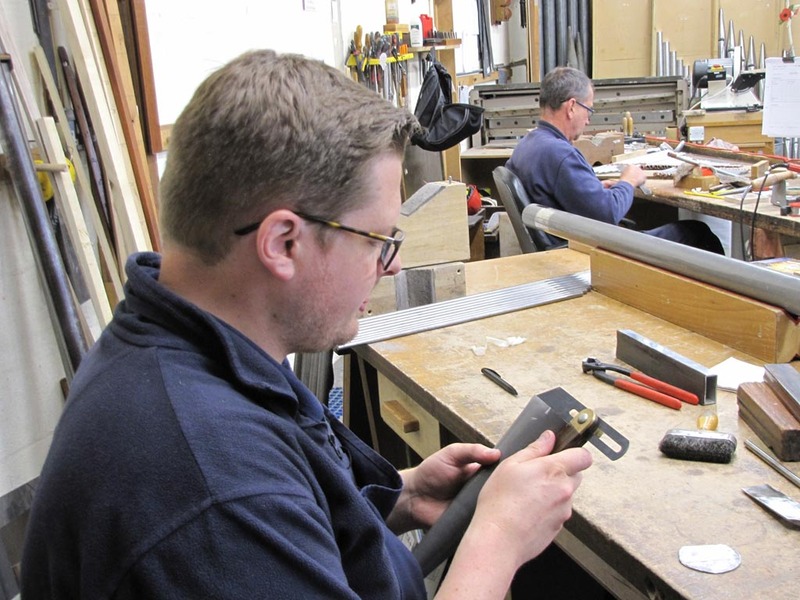 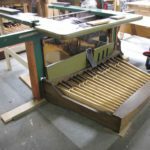 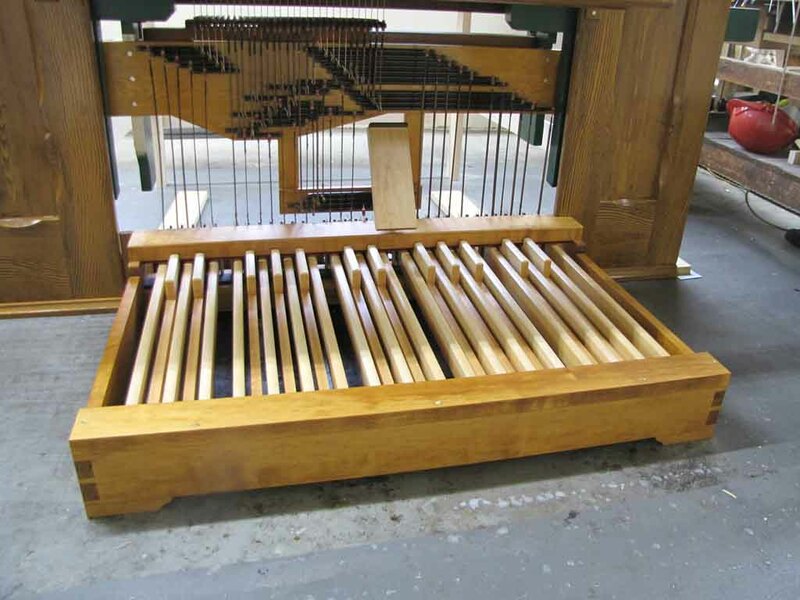 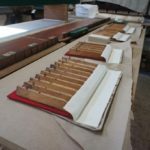 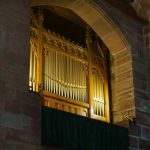 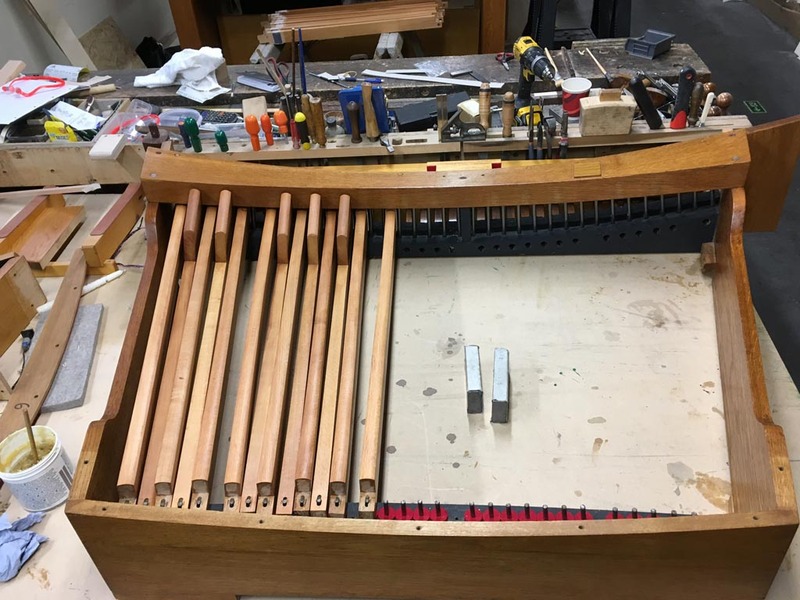 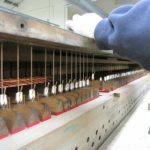 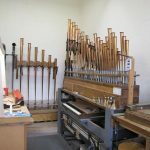 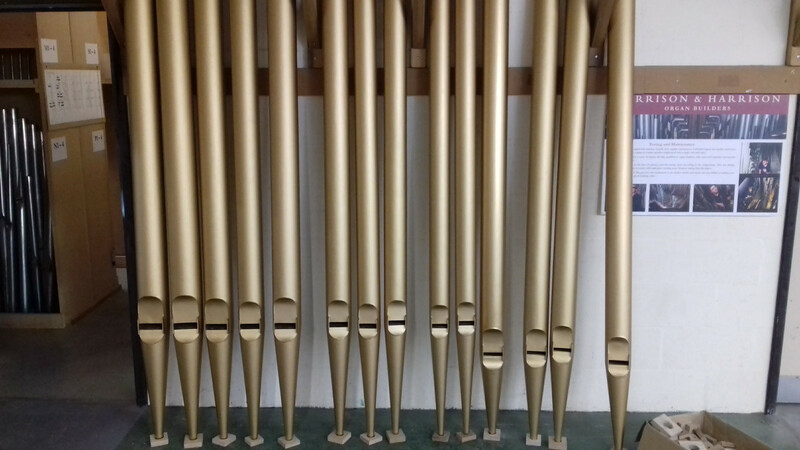 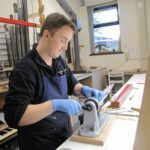 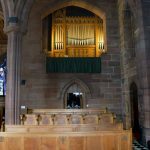 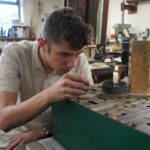 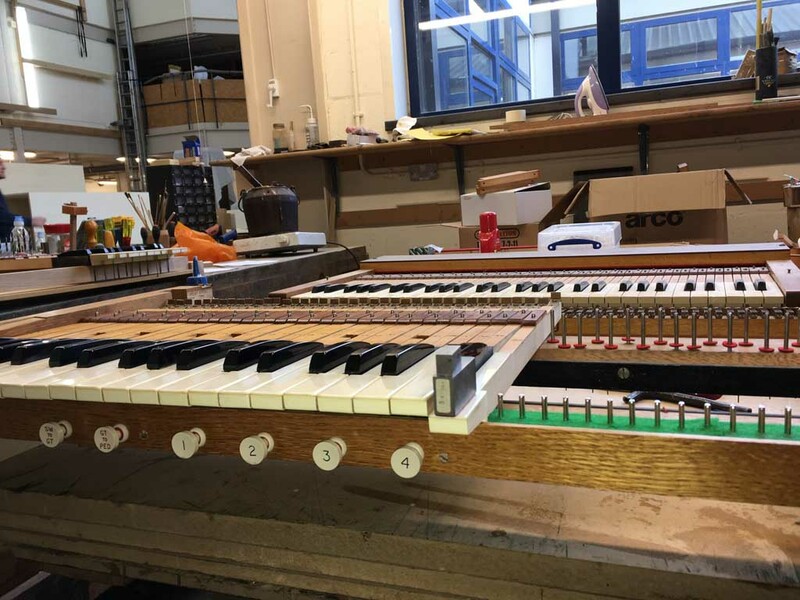 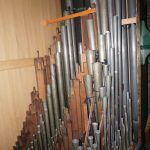 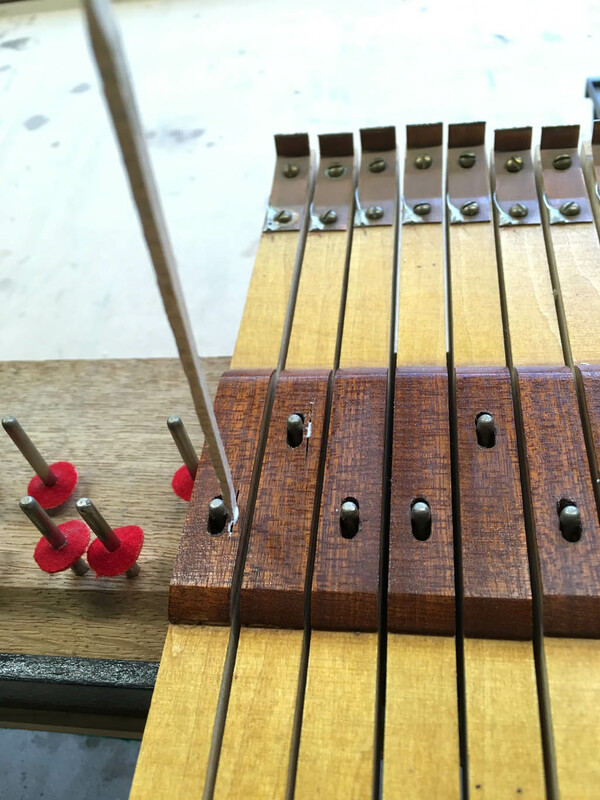 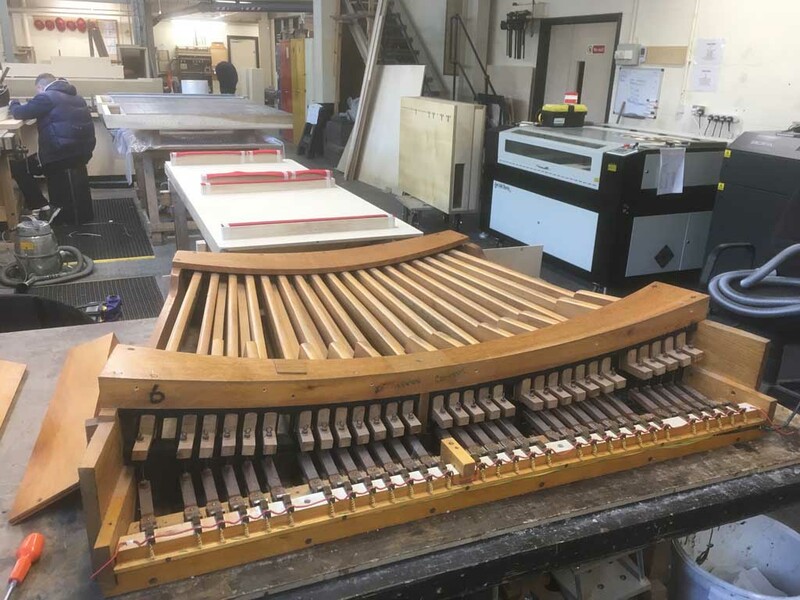 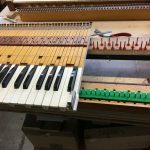 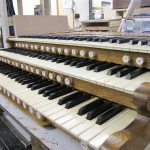 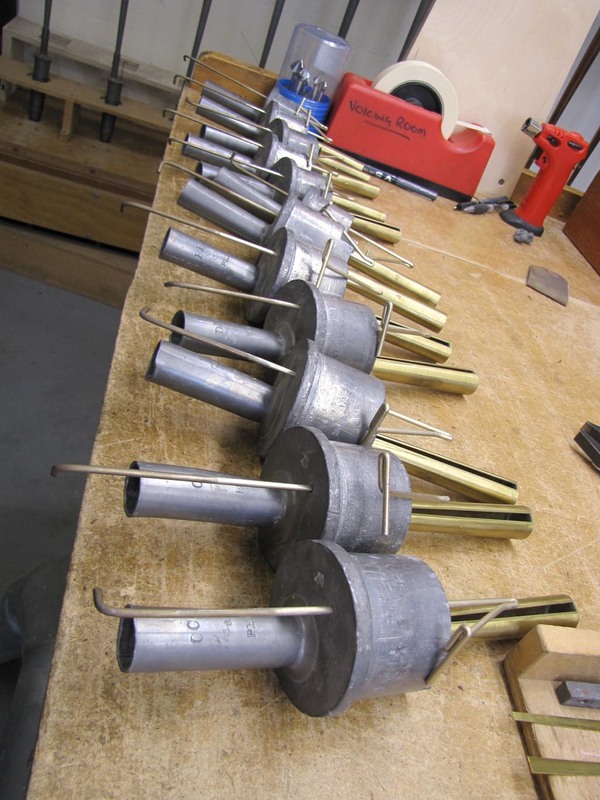 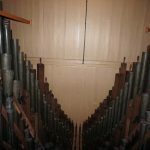 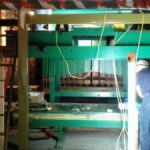 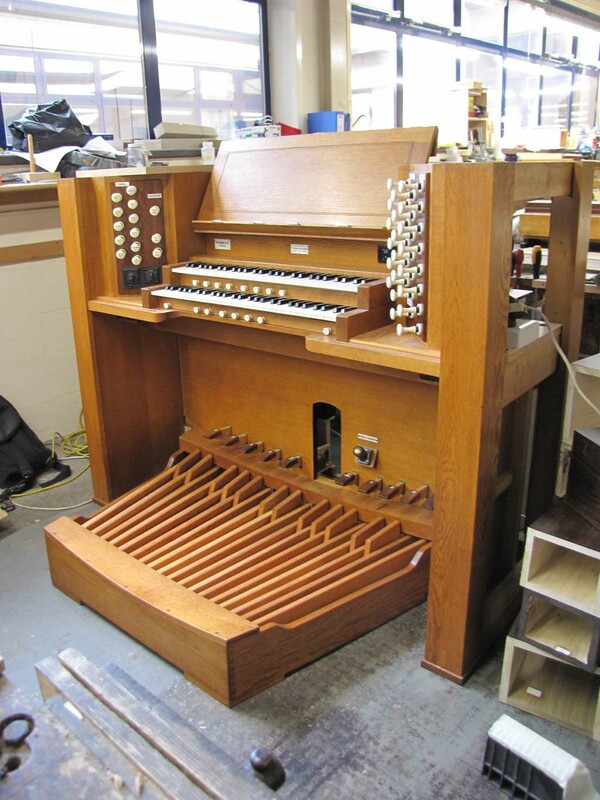 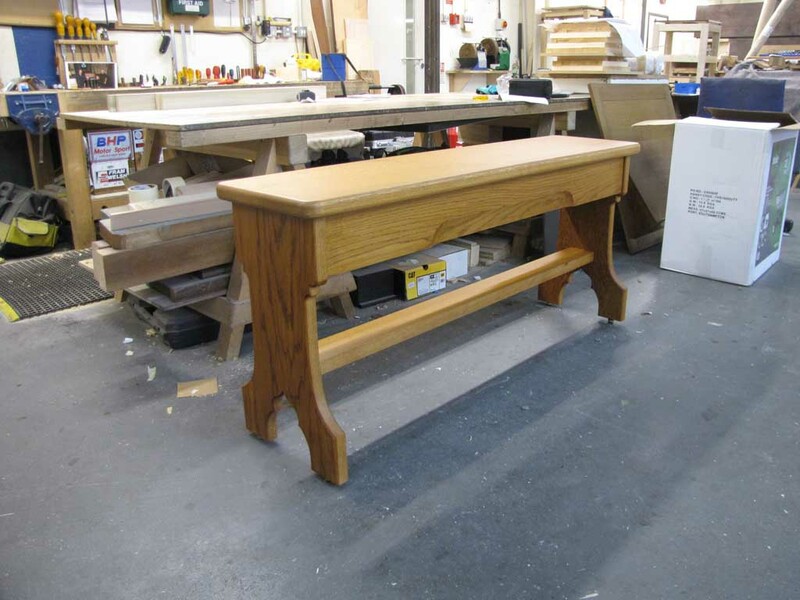 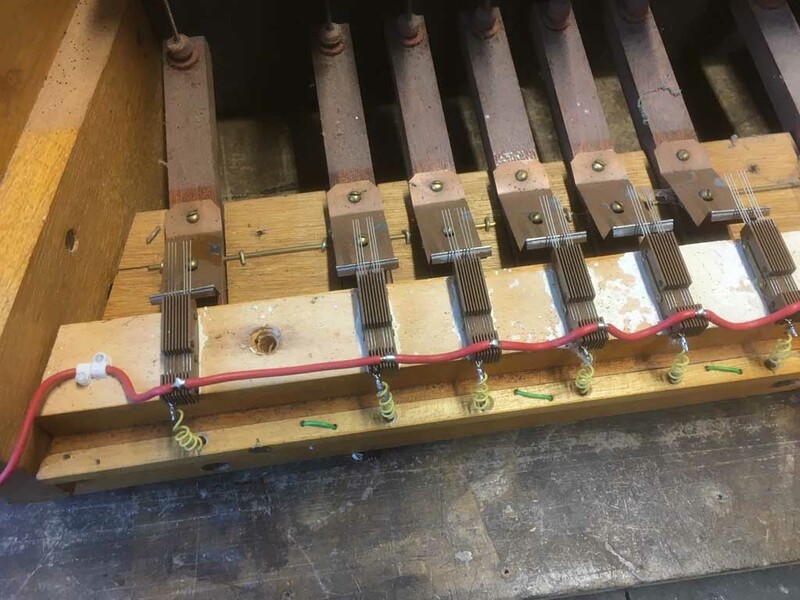 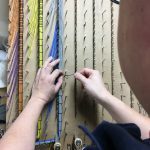 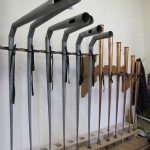 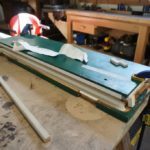 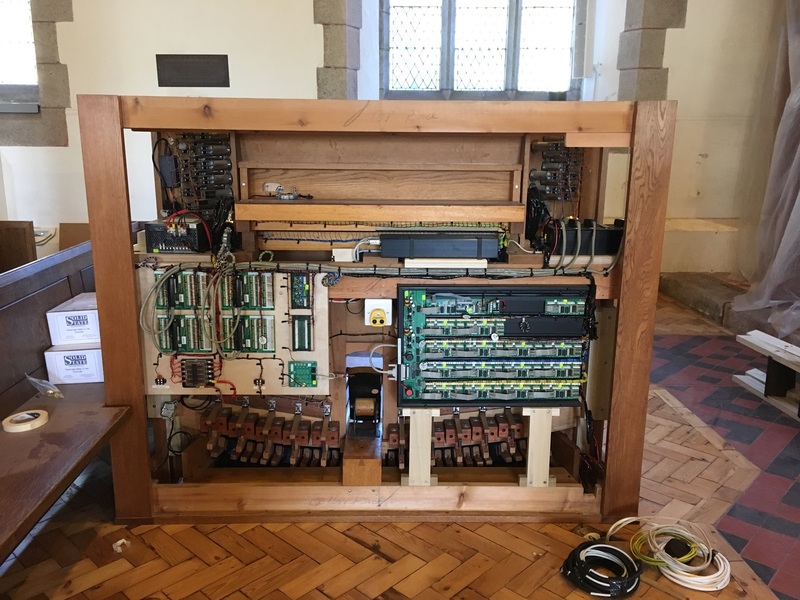 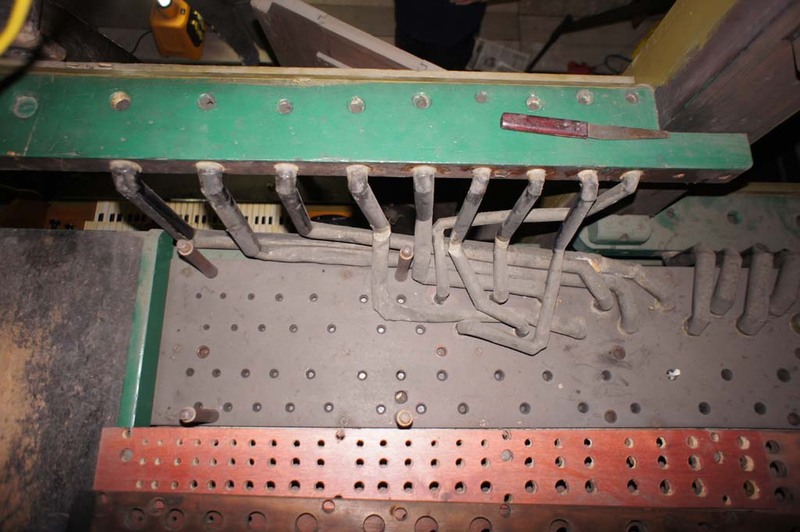 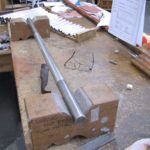 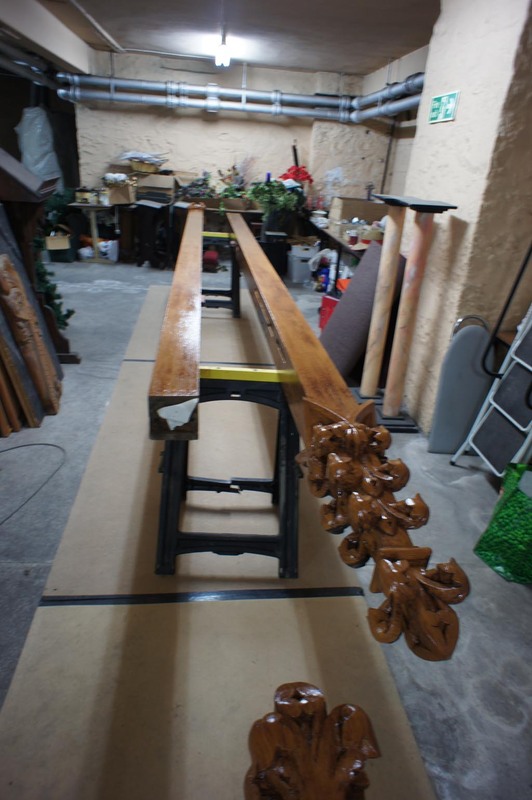 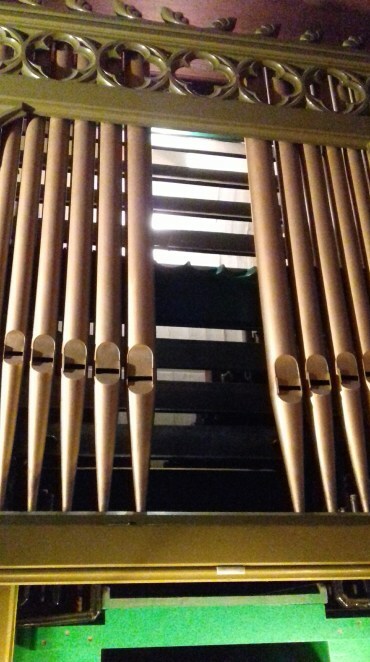 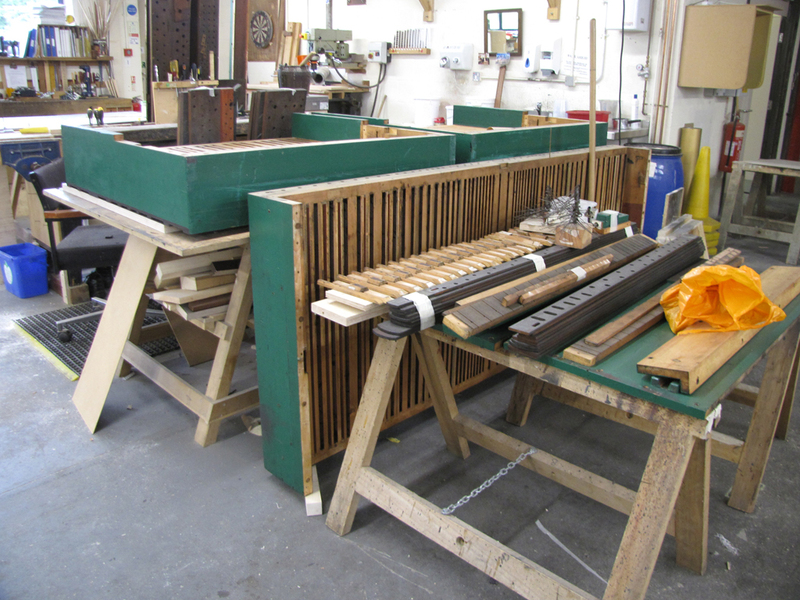 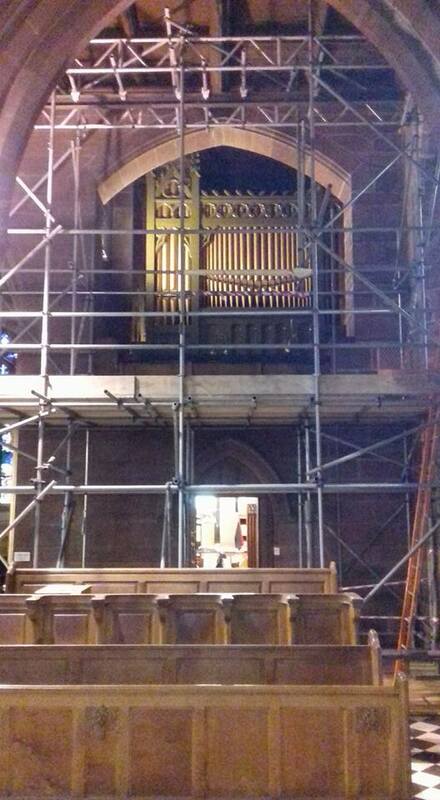 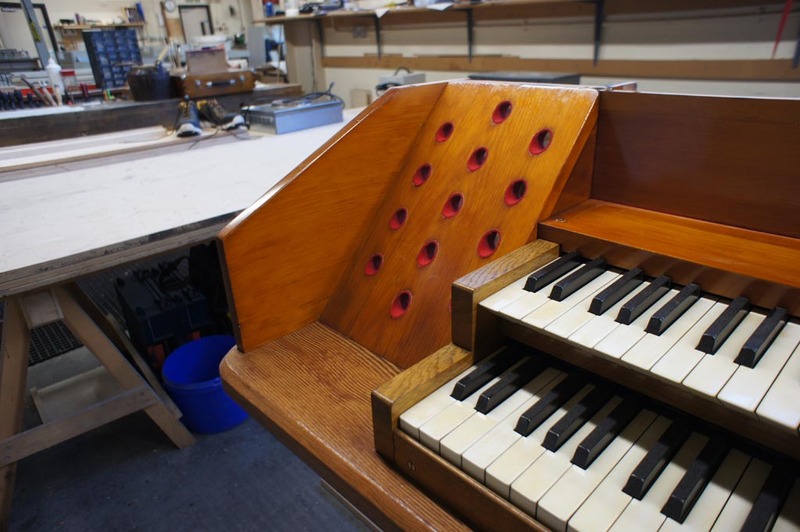 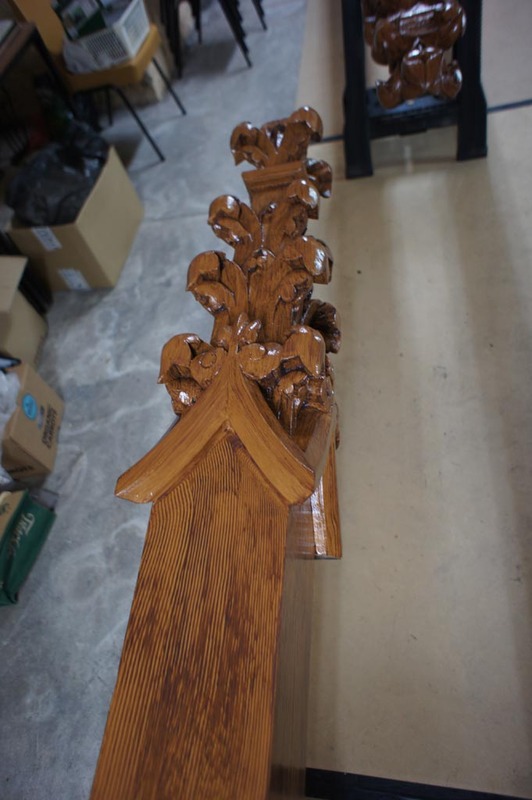 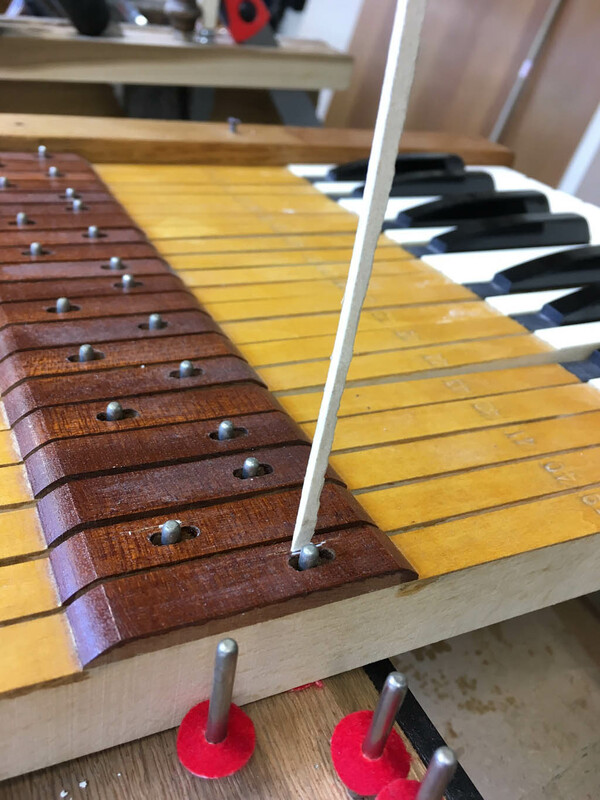 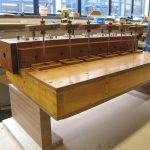 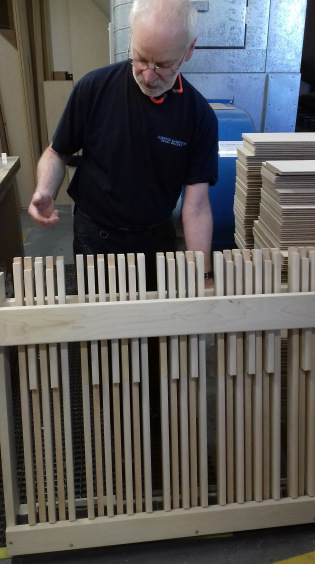 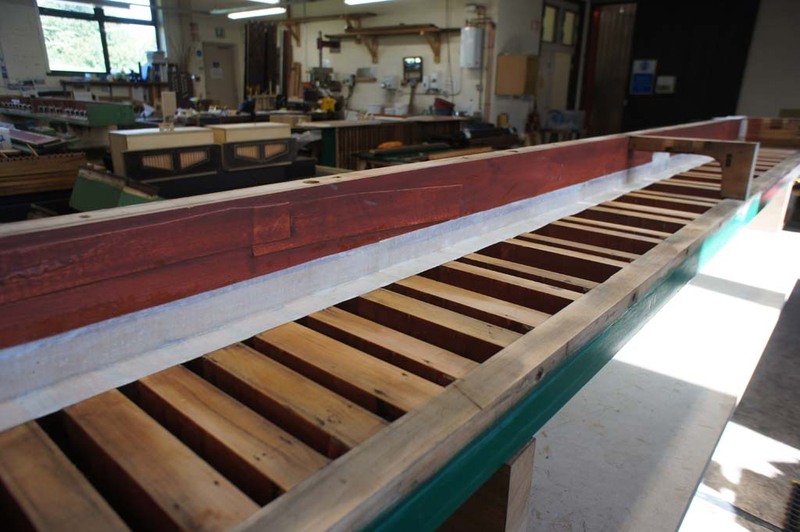 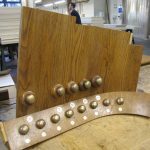 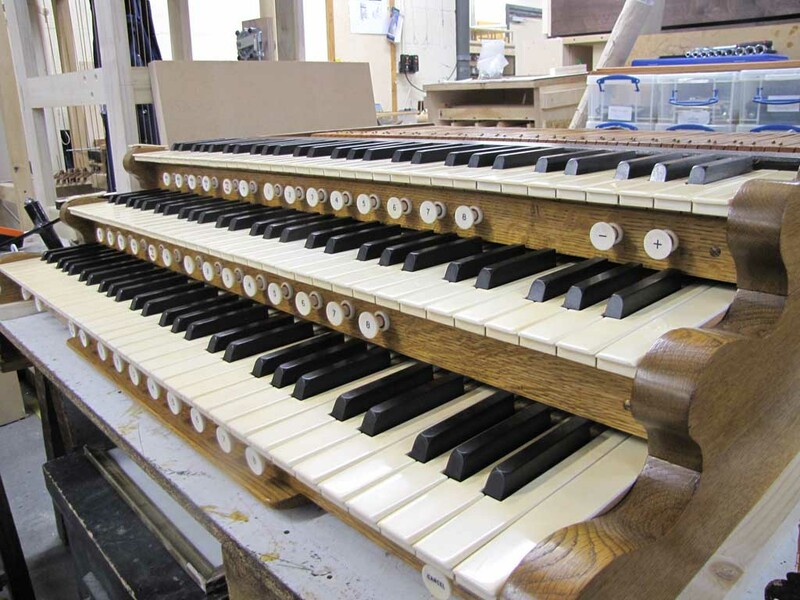 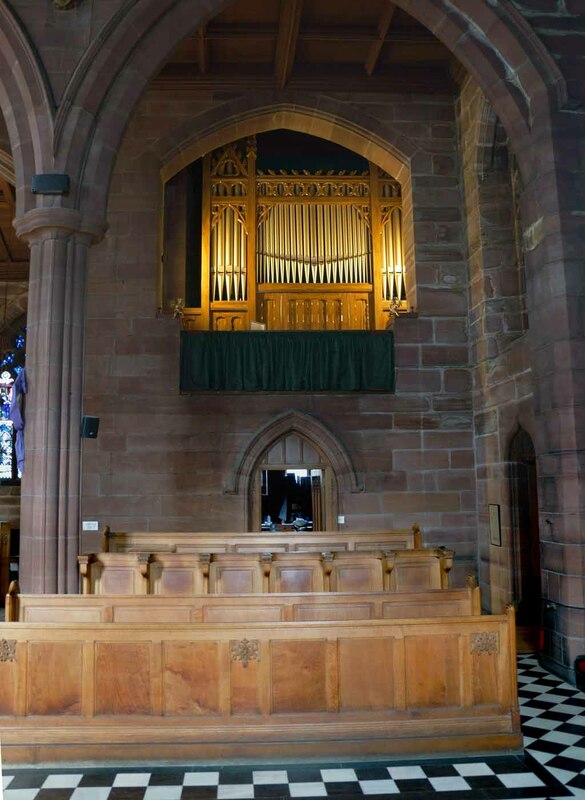 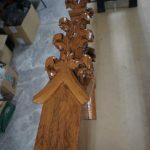 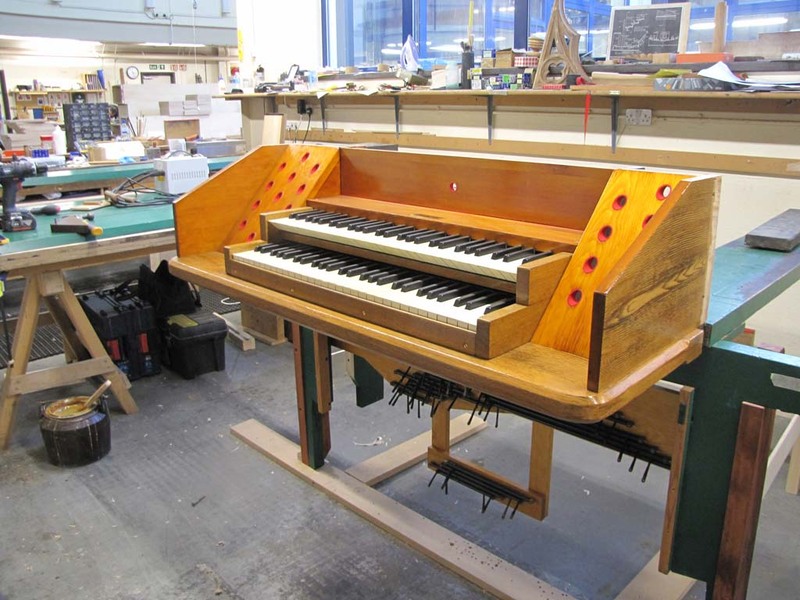 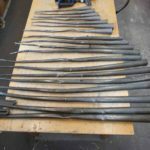 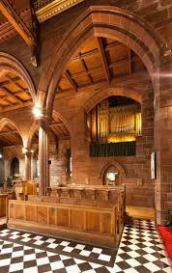 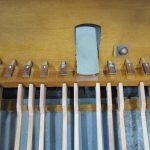 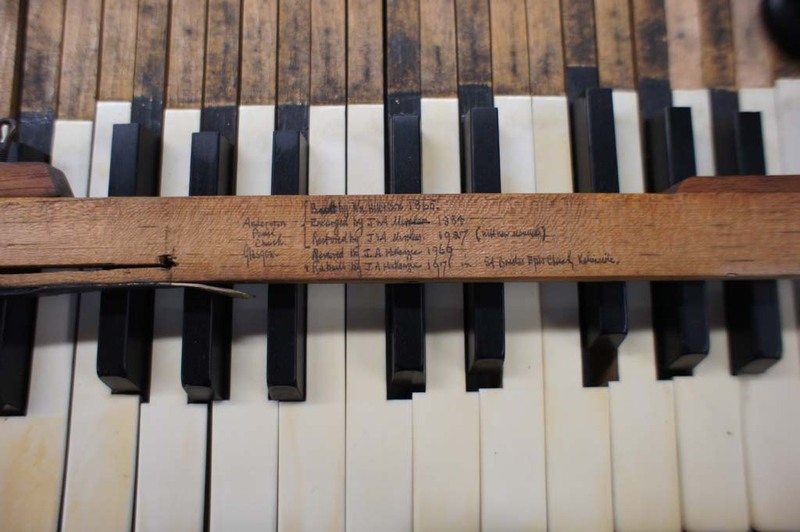 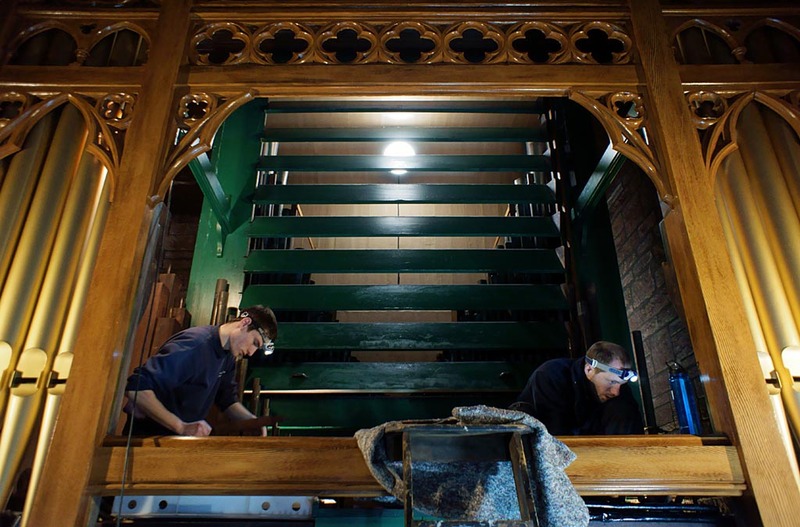 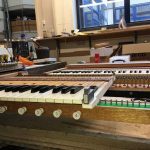 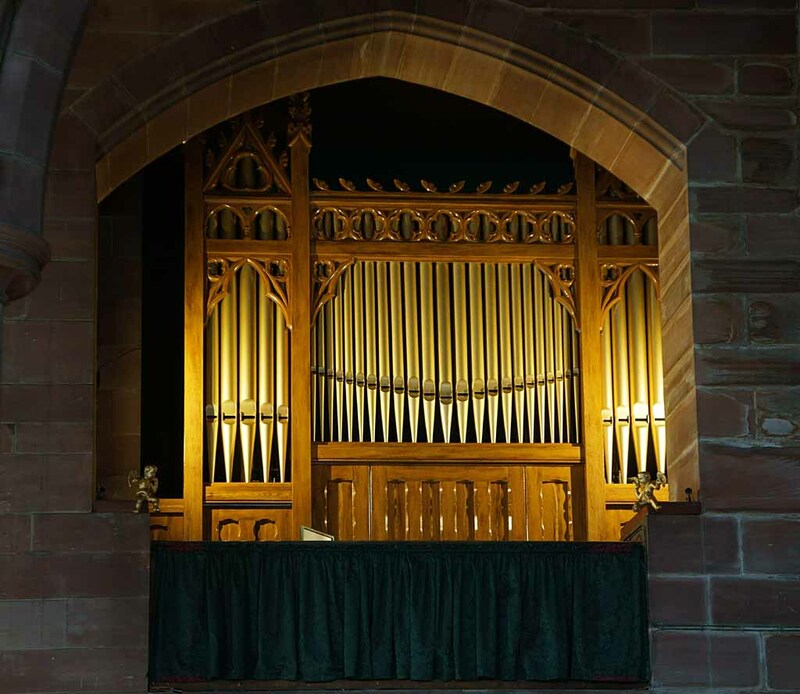 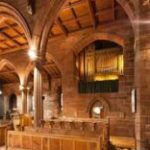 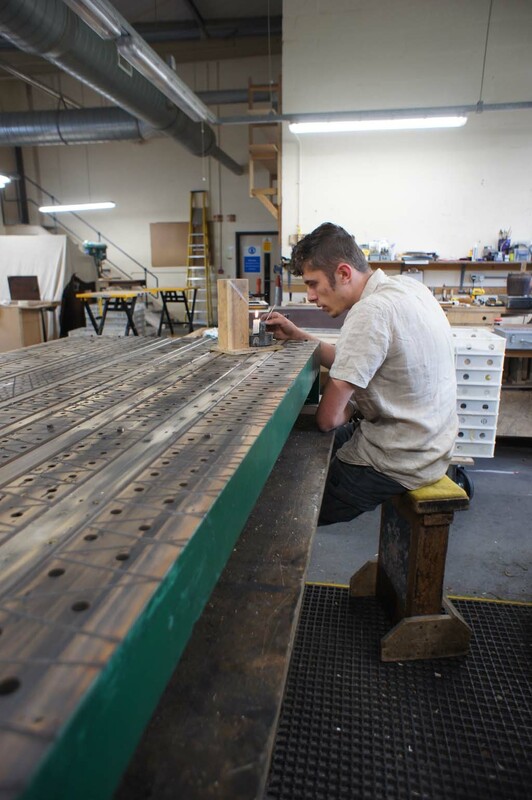 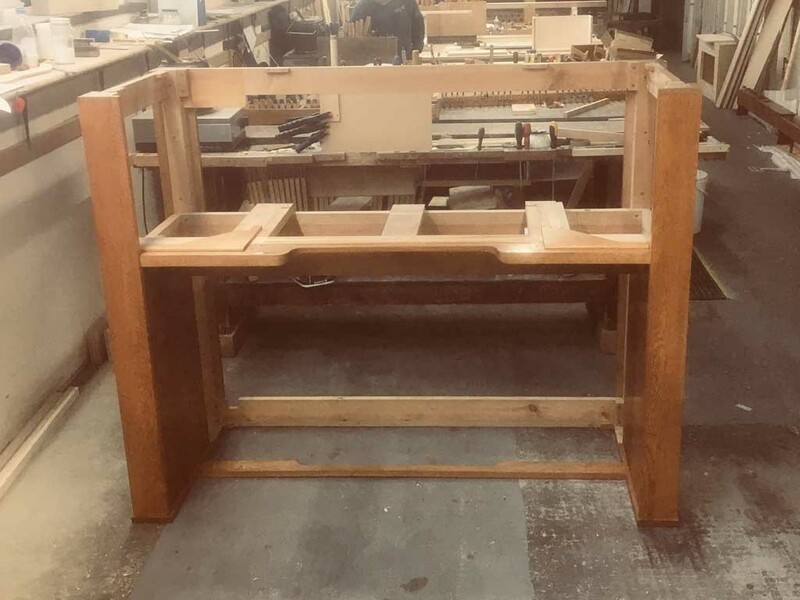 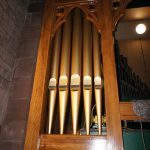 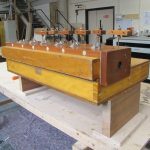 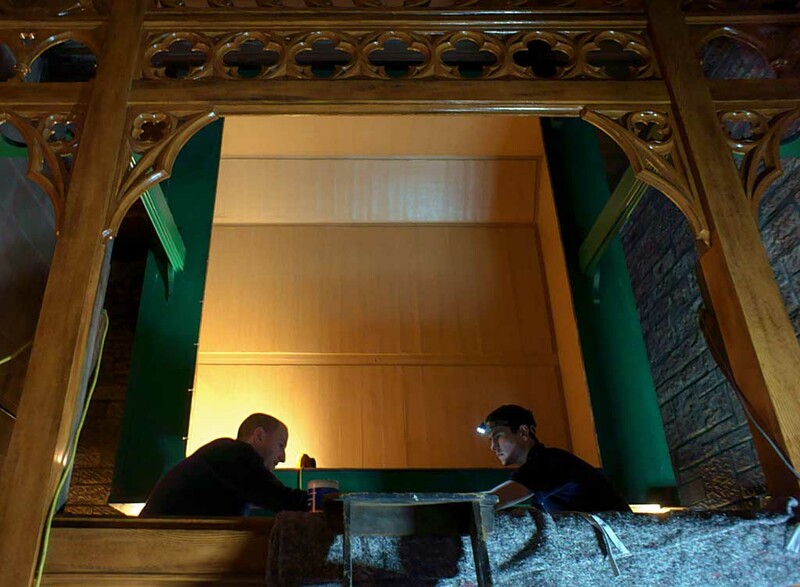 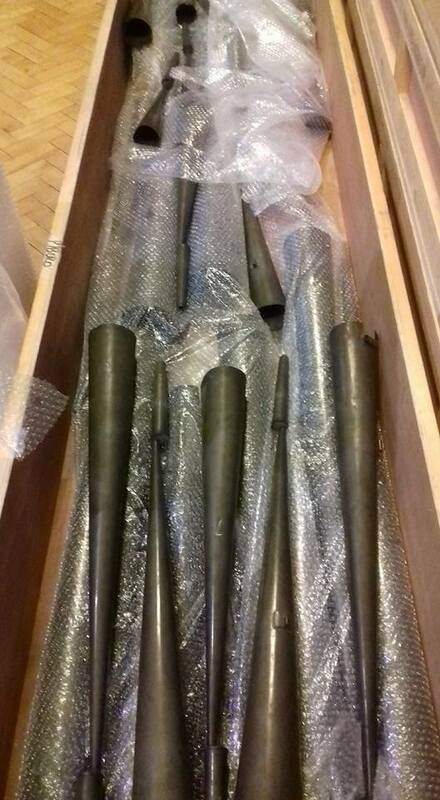 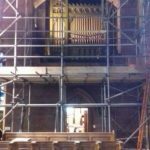 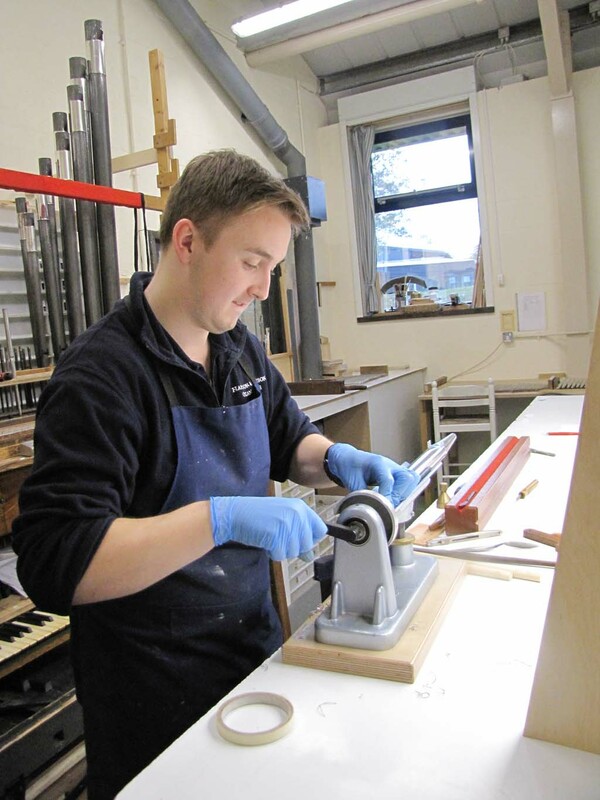 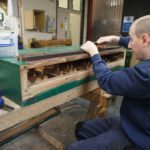 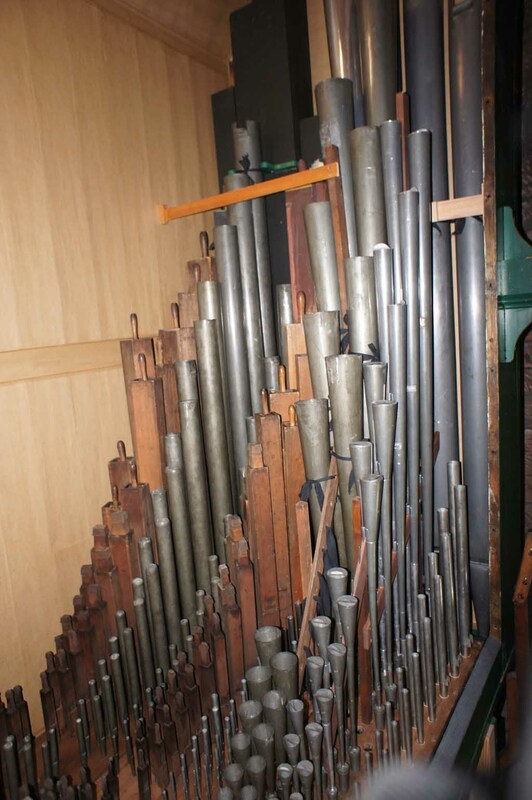 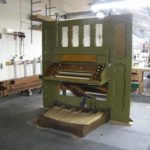 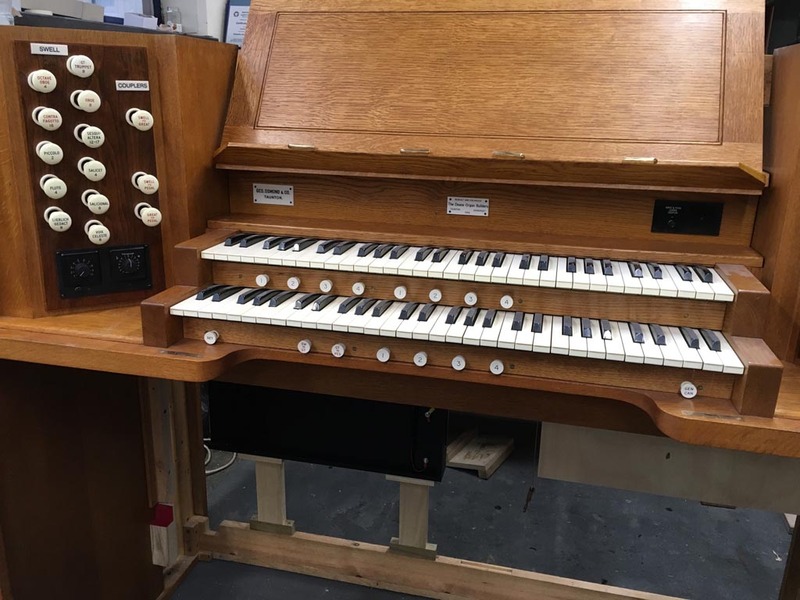 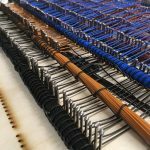 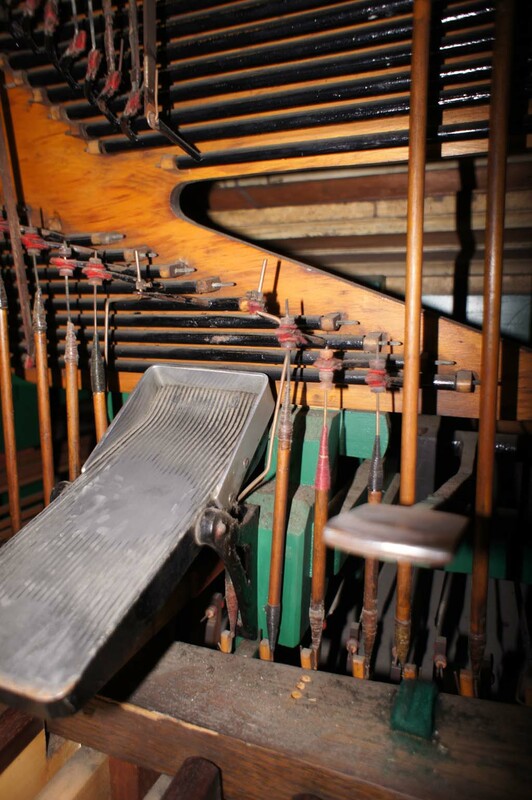 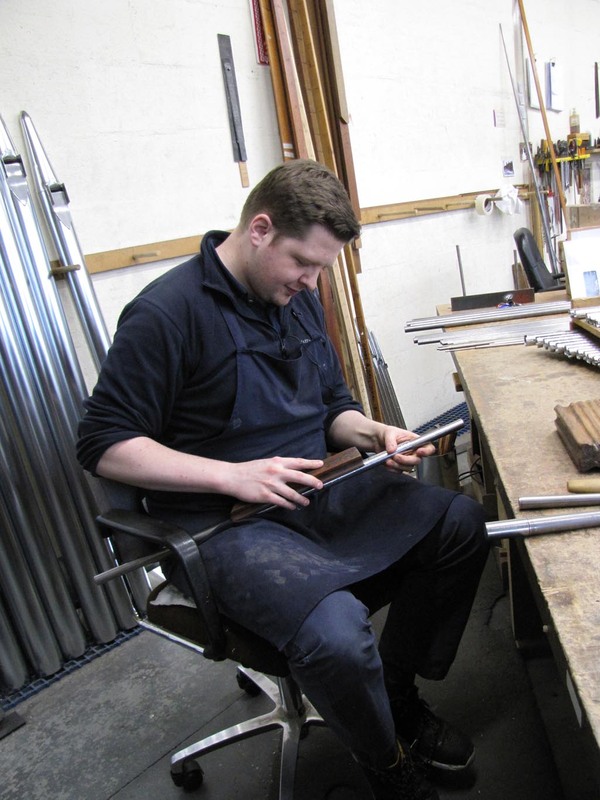 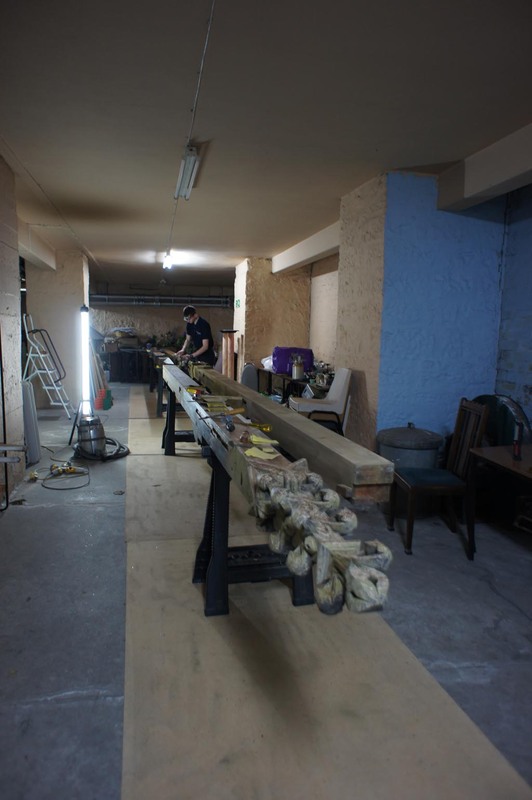 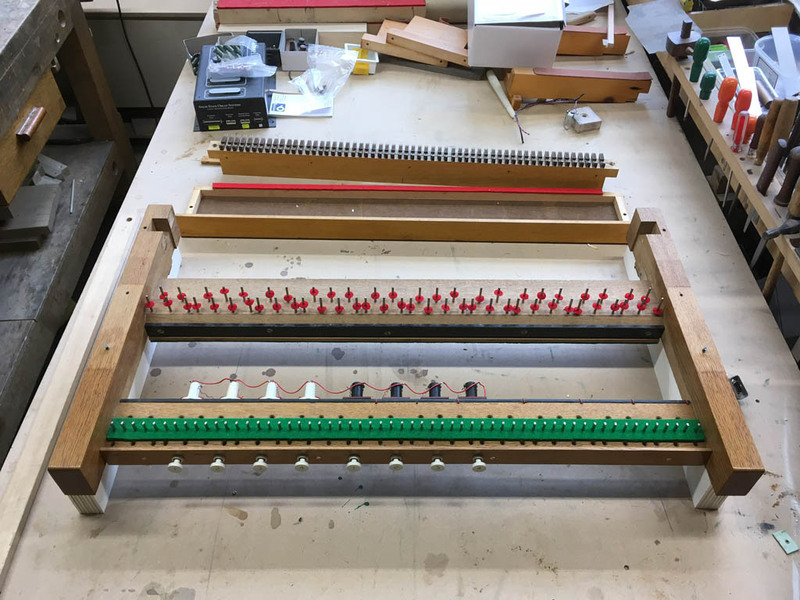 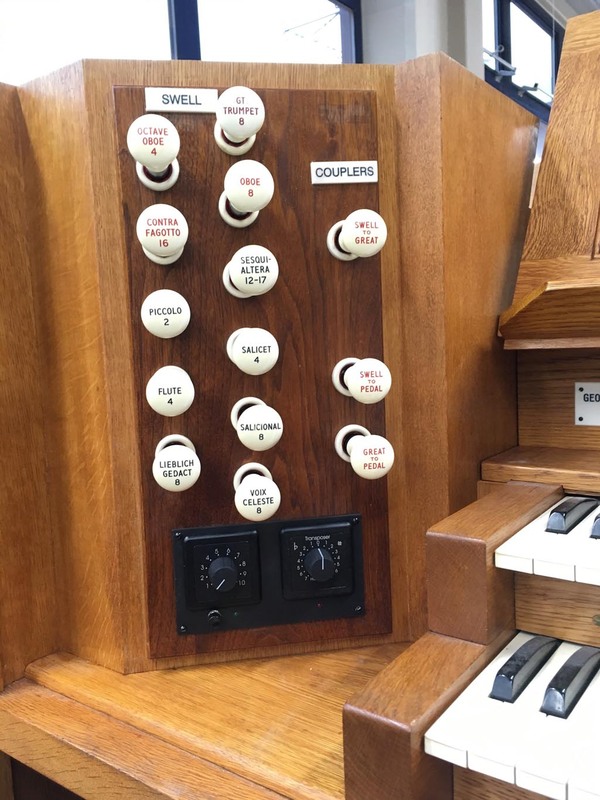 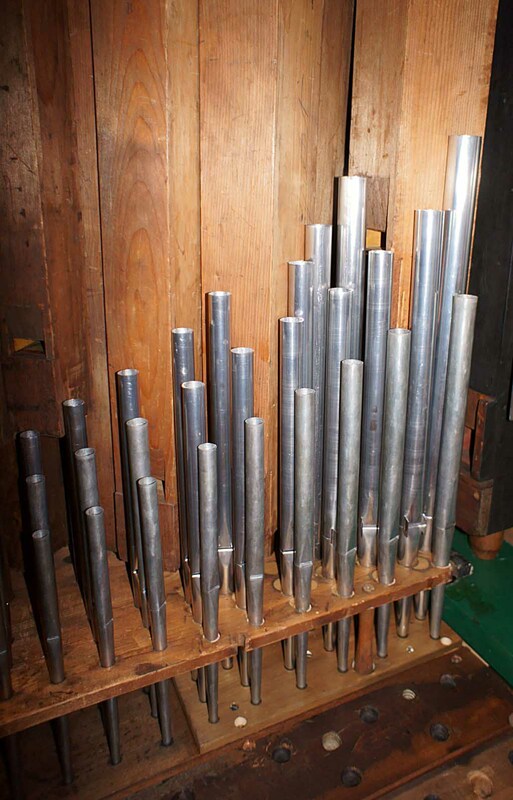 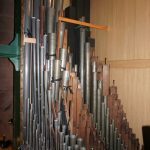 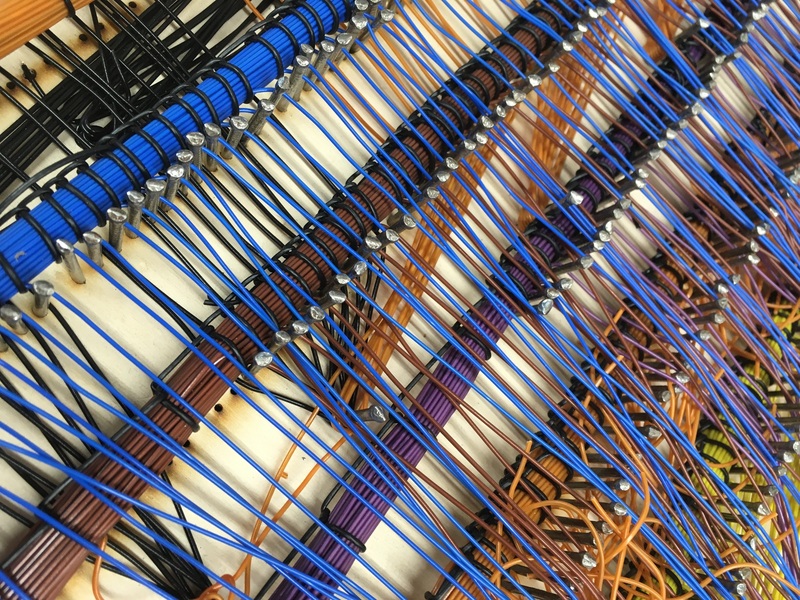 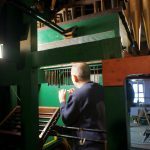 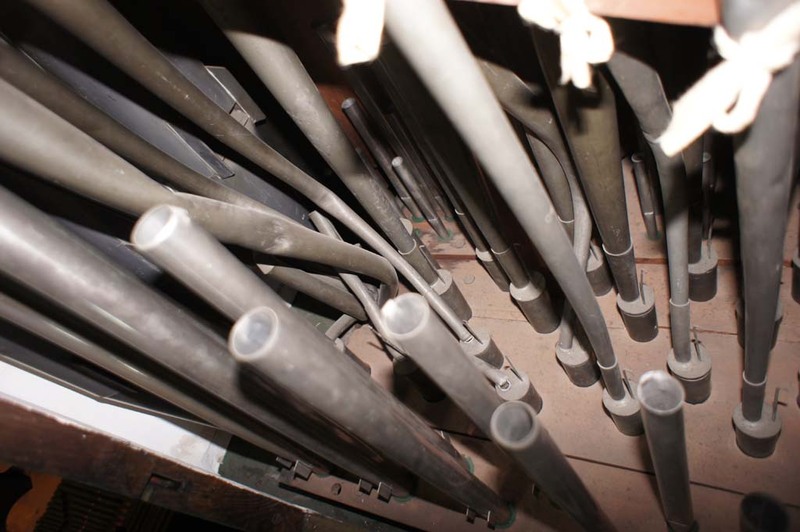 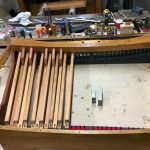 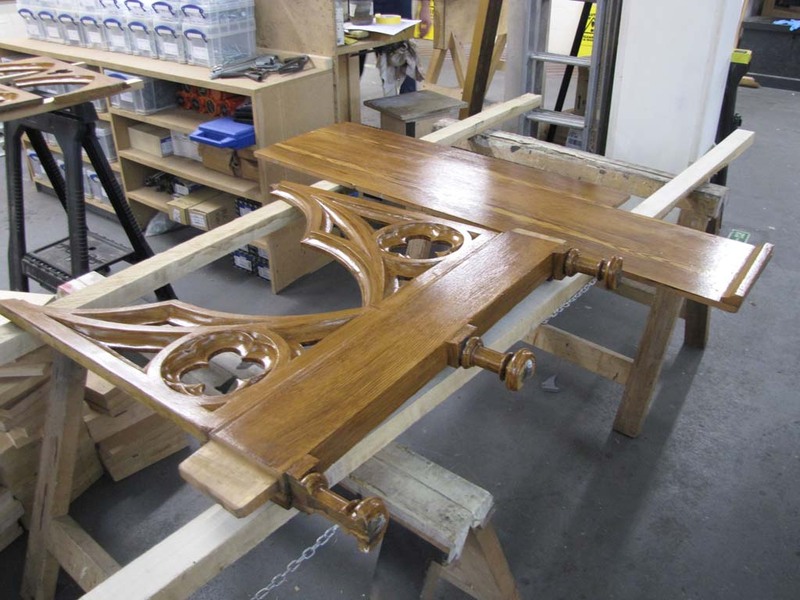 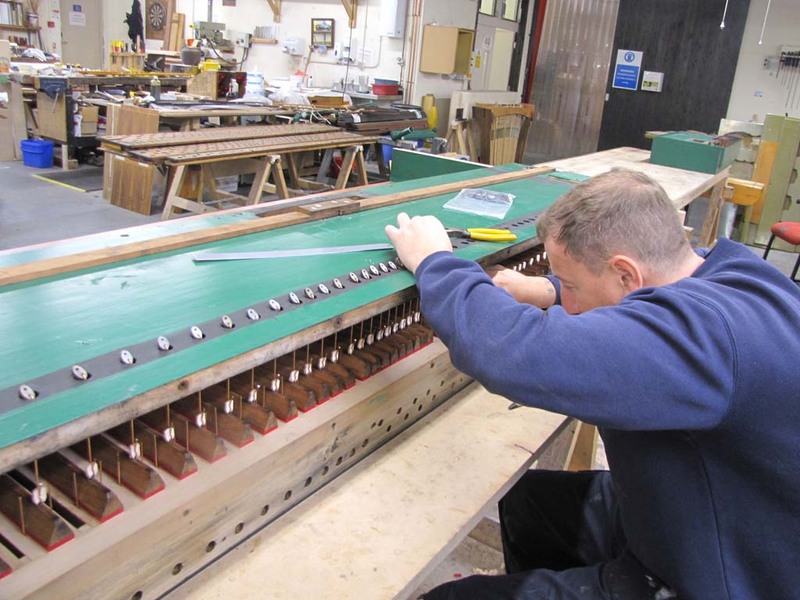 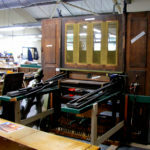 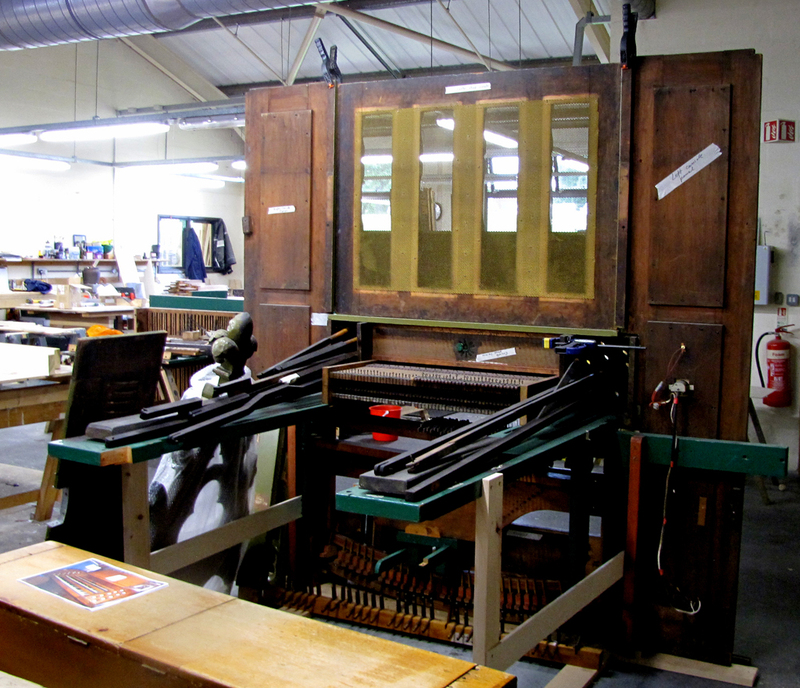 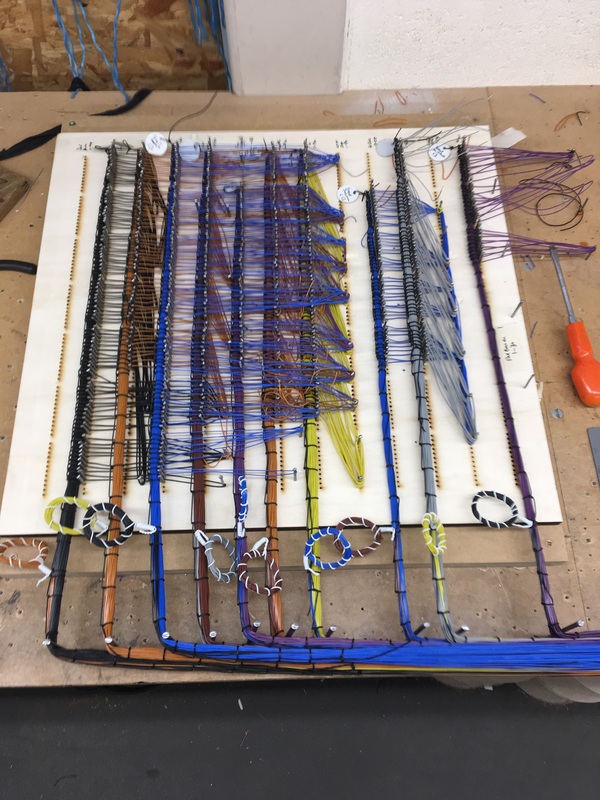 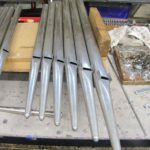 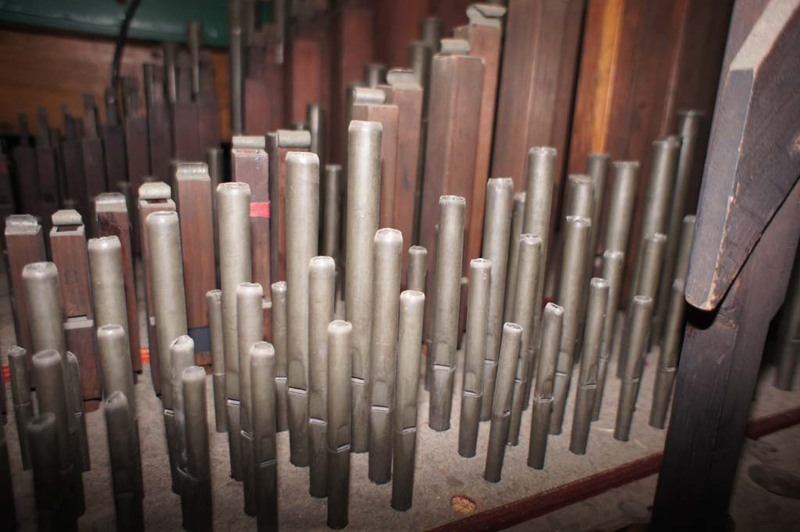 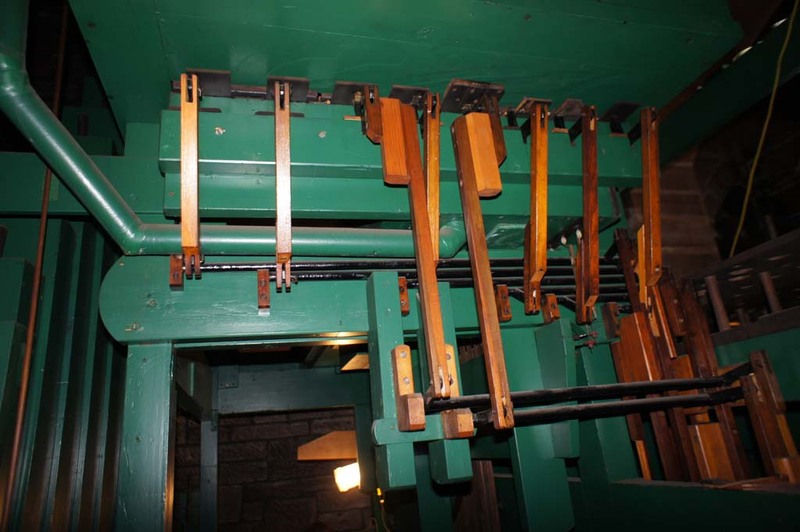 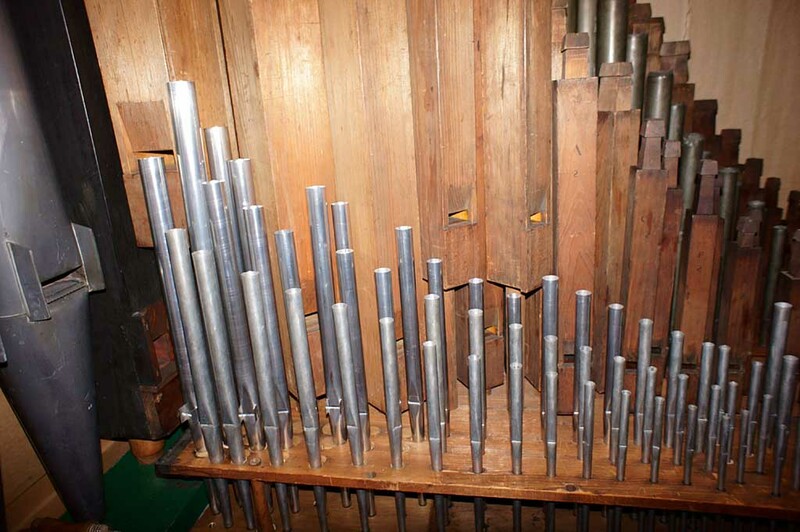 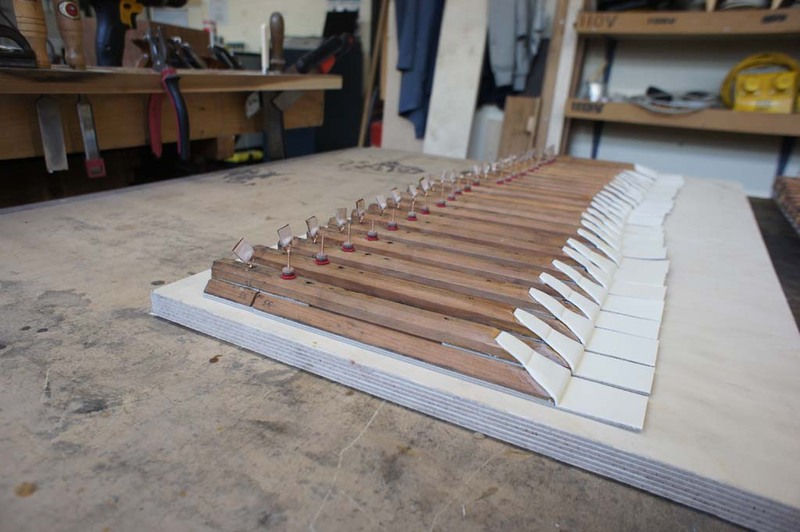 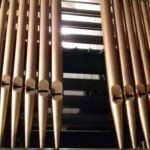 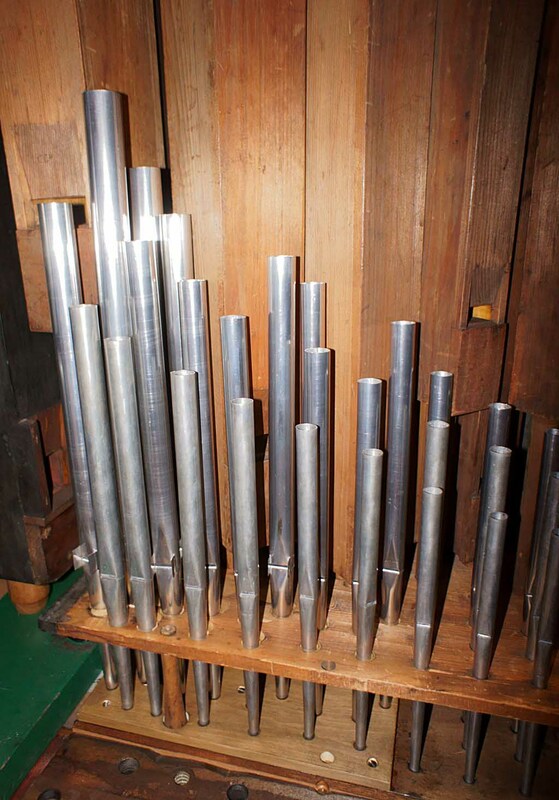 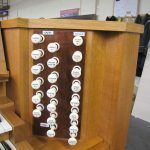 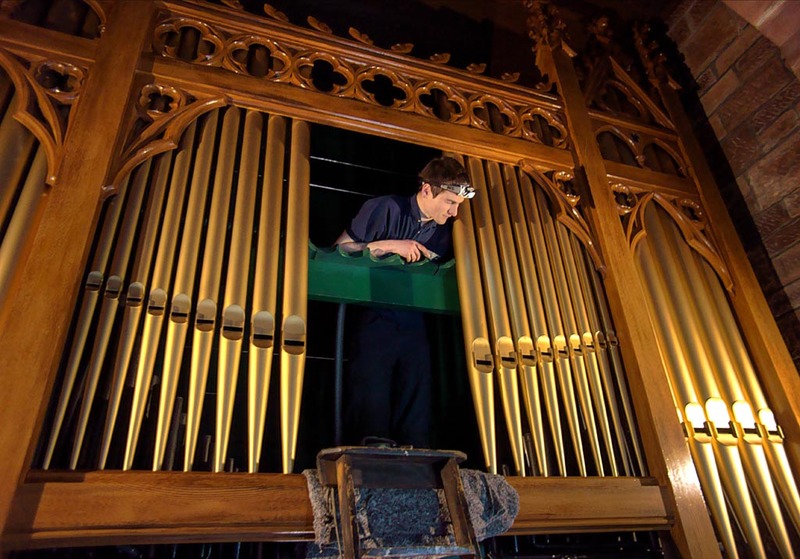 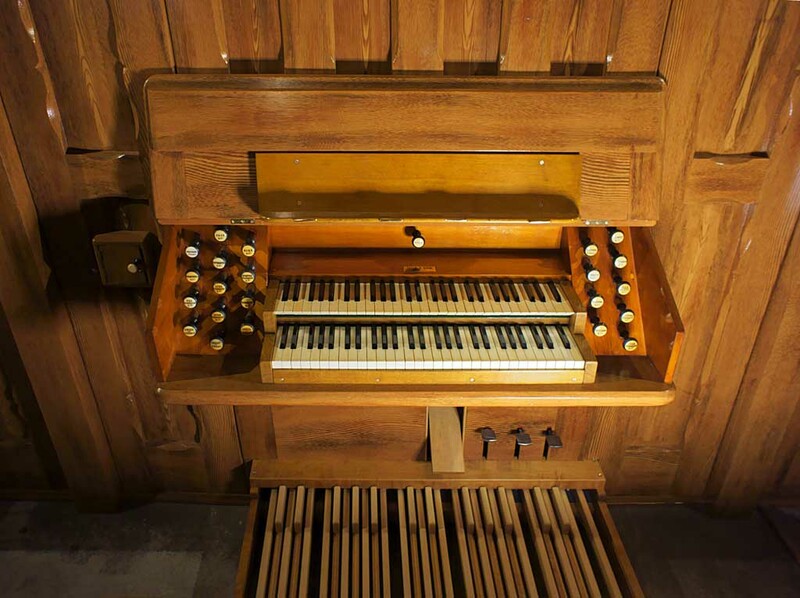 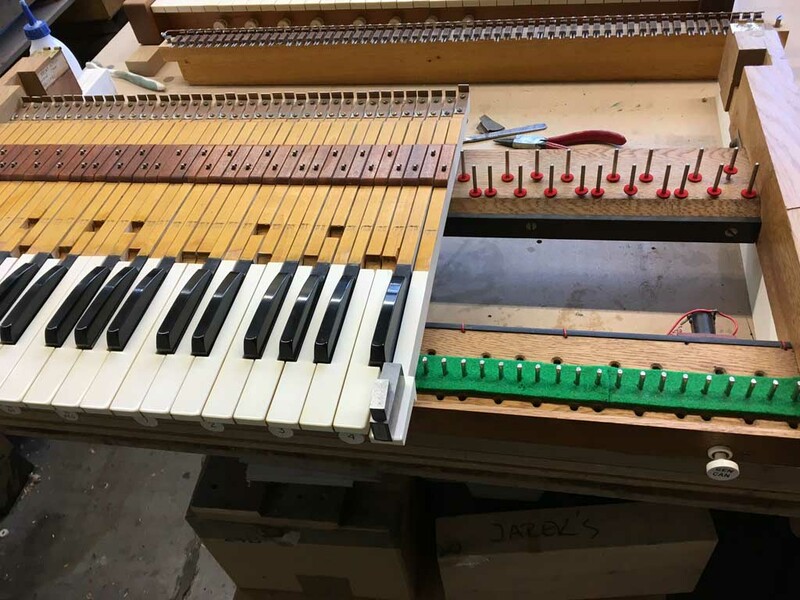 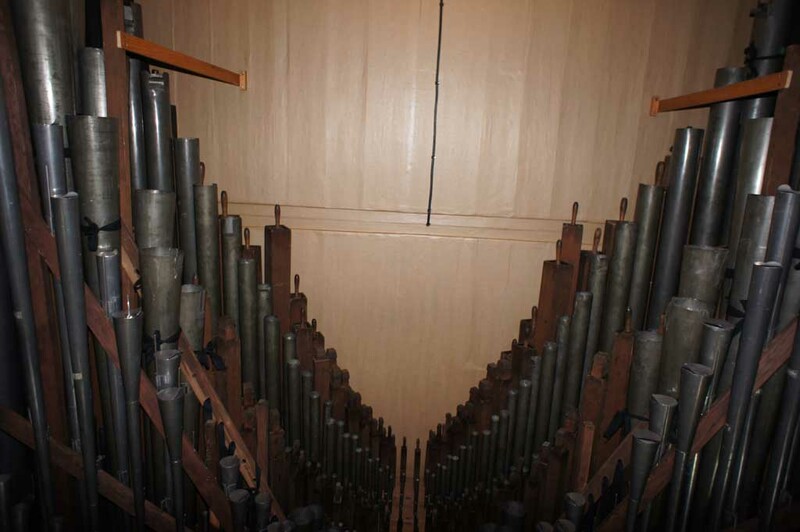 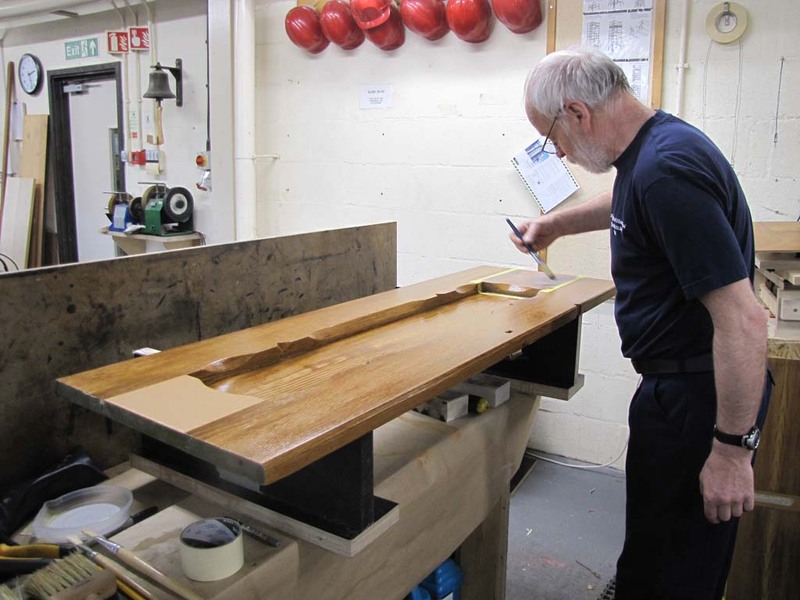 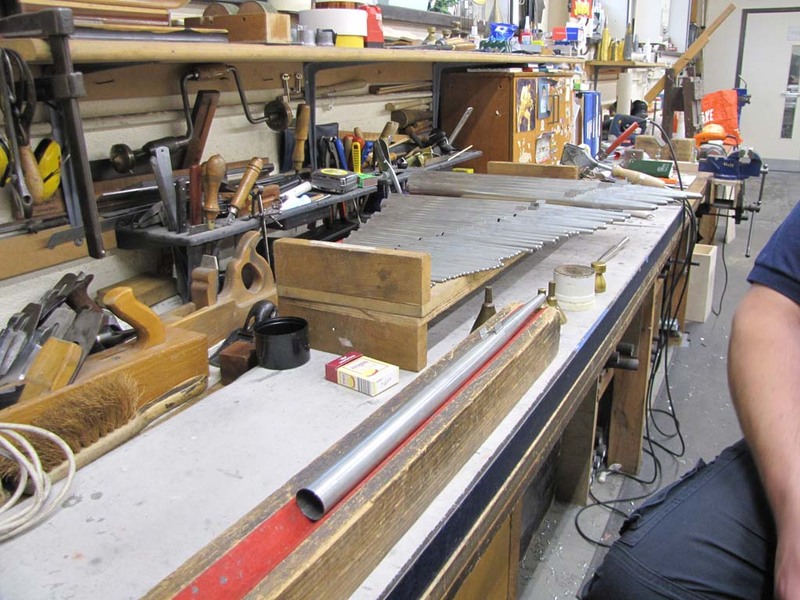 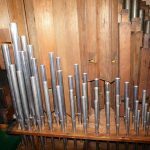 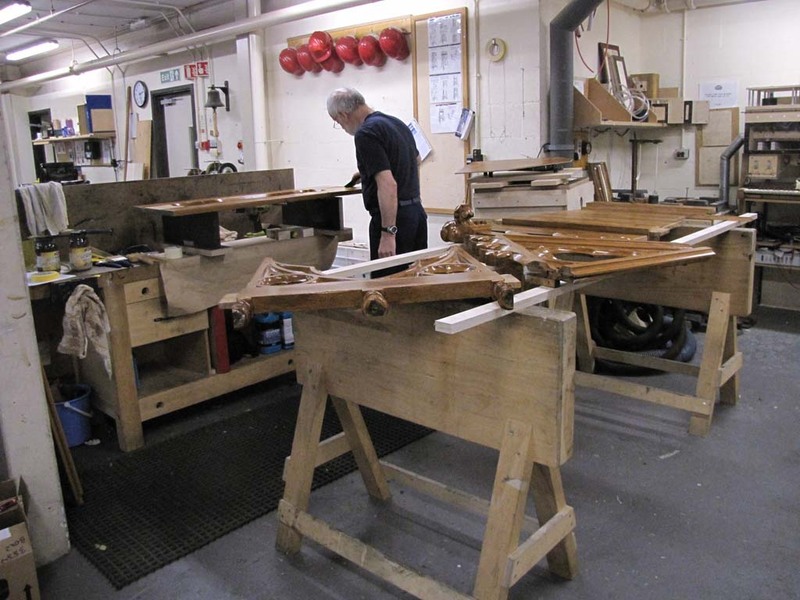 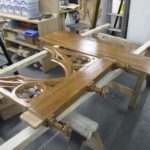 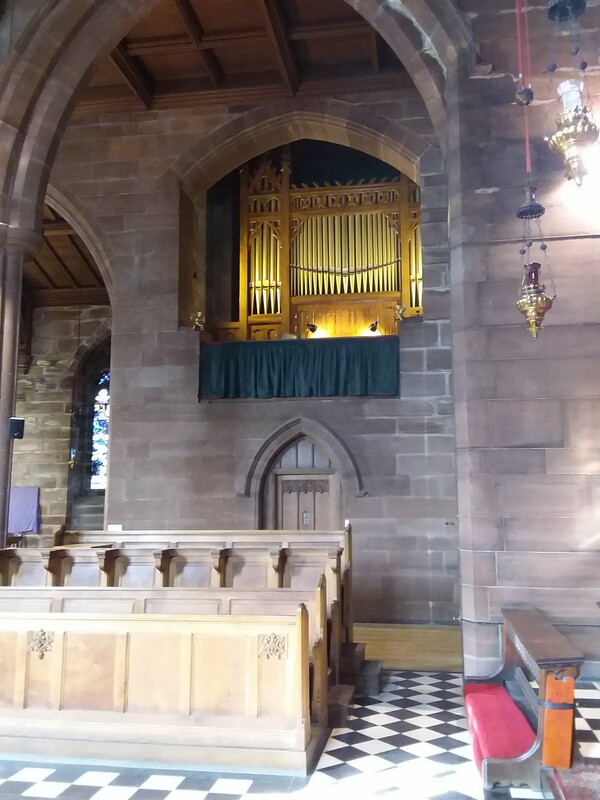 Once re-assembled, the speech and balance of the pipework will be checked, and the organ tuned. 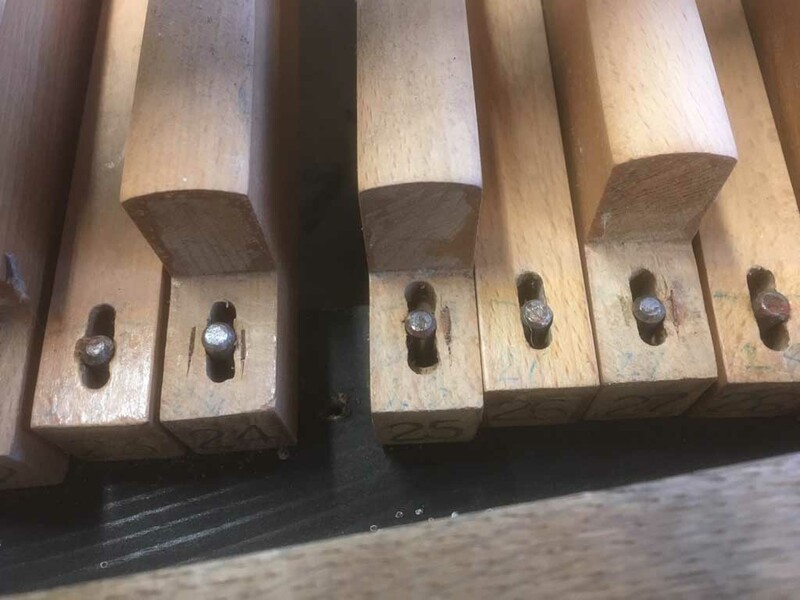 Manual keys cleaned and repaired. 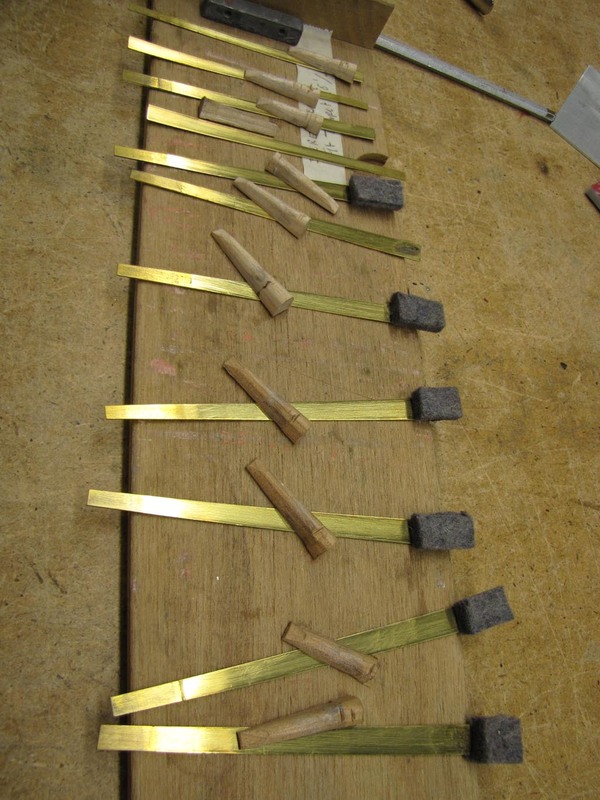 Swell pedal re-faced and composition pedals overhauled and wear in mechanism adjusted. 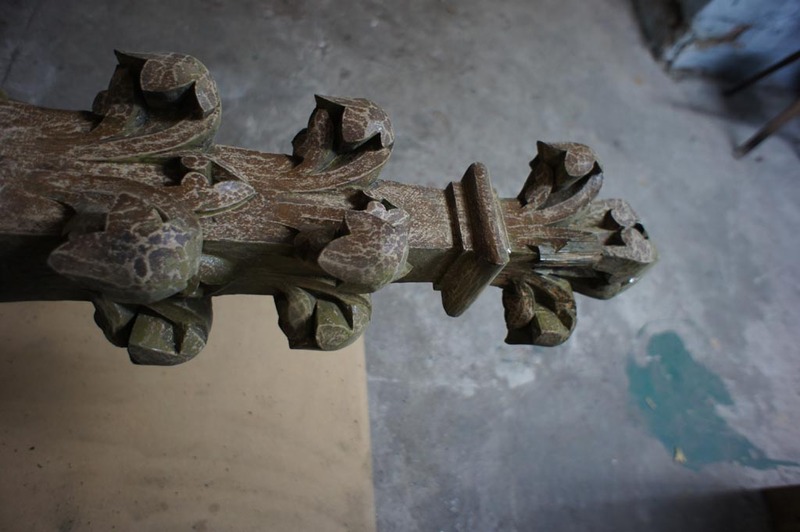 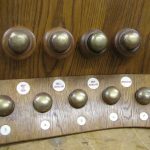 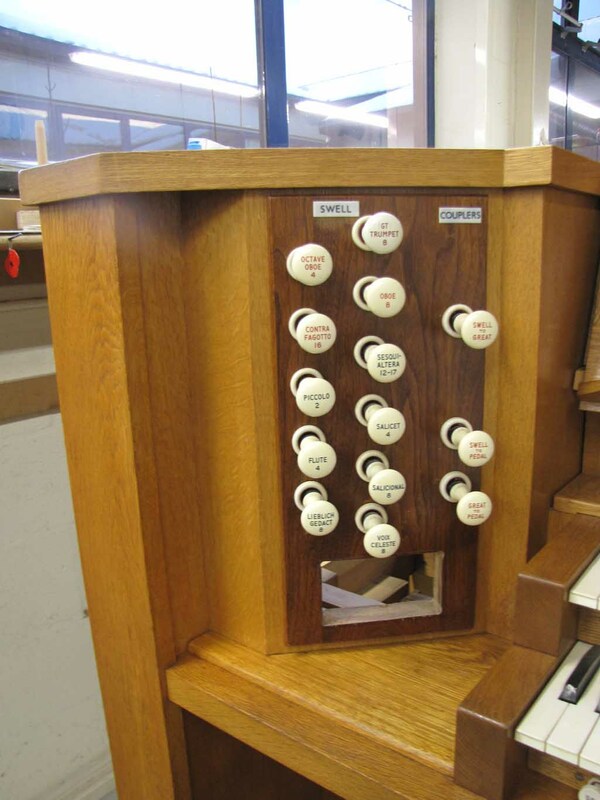 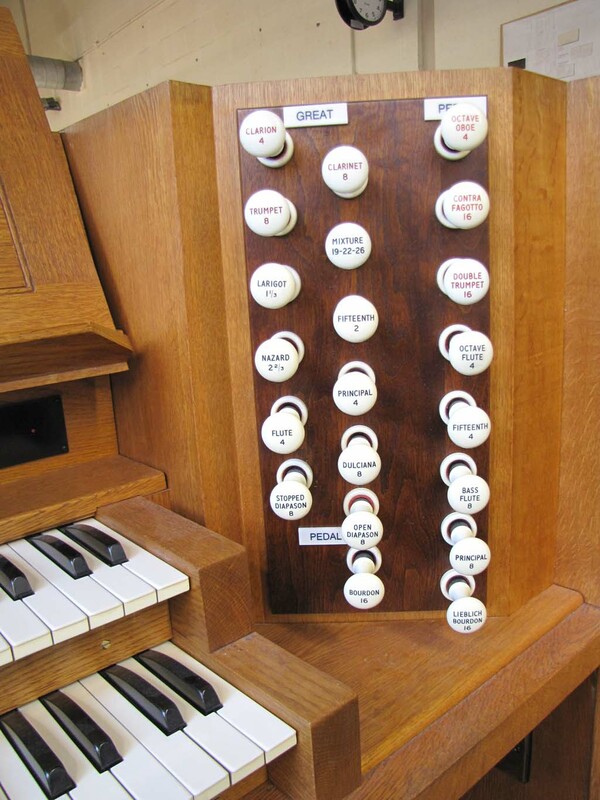 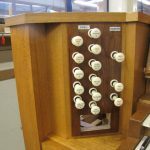 Stop action at the console will be re-bushed and the engraving of stop knobs re-filled. 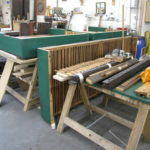 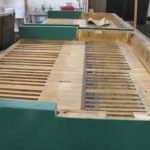 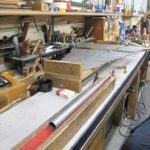 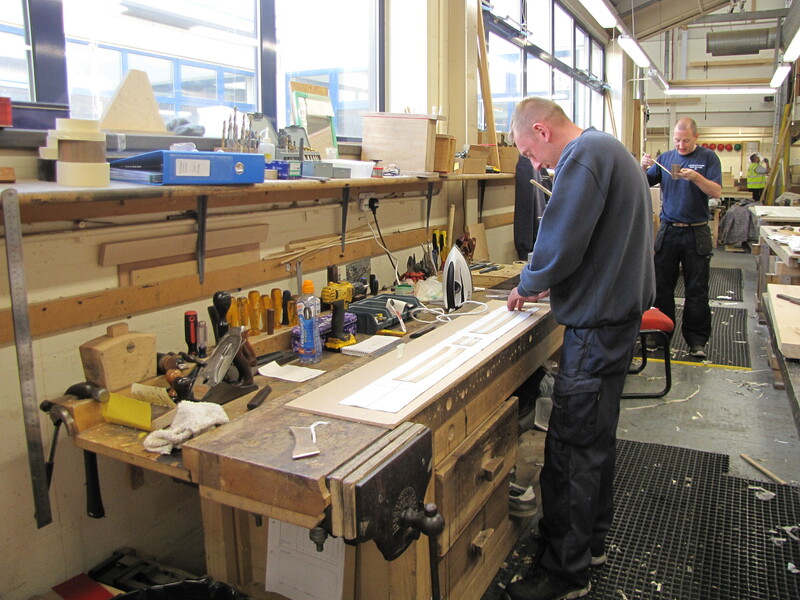 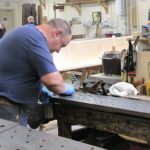 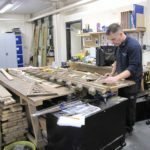 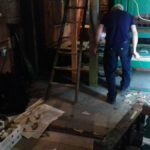 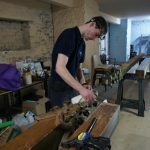 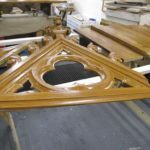 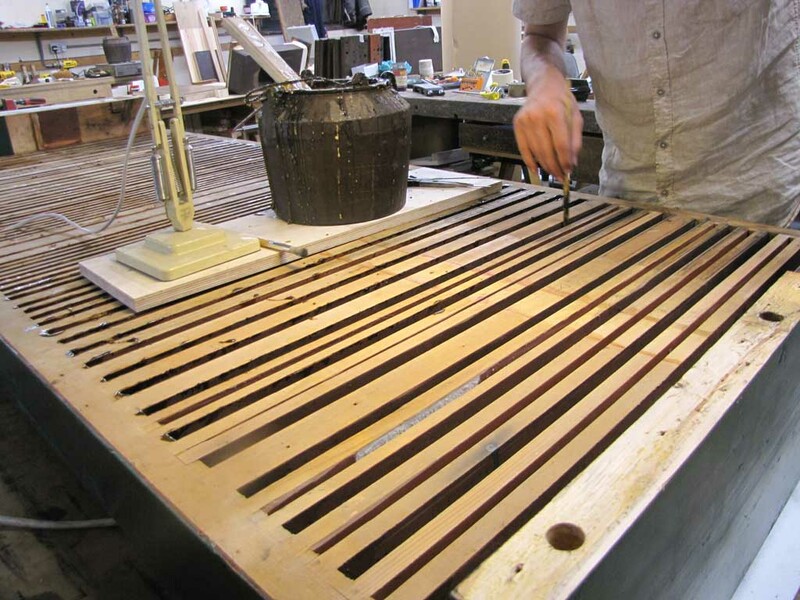 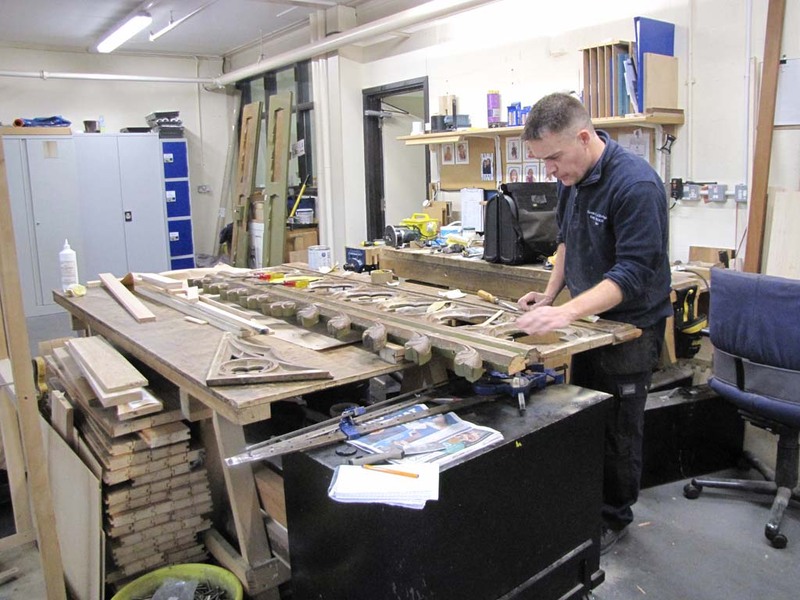 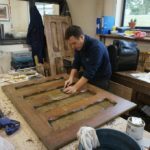 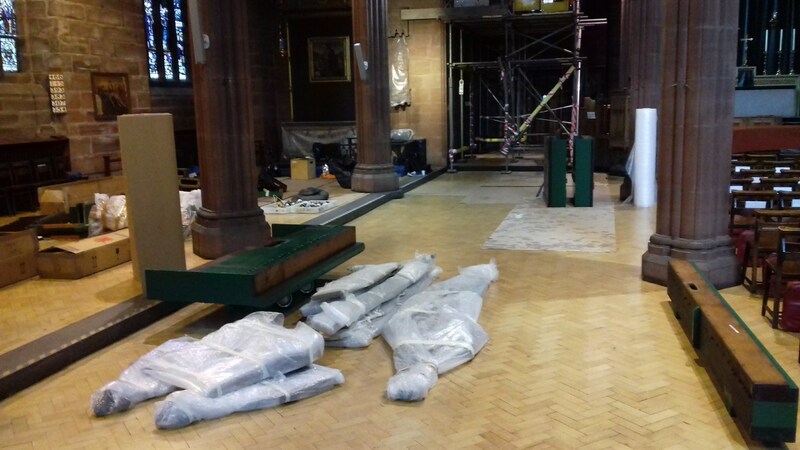 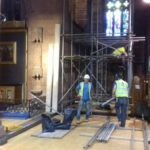 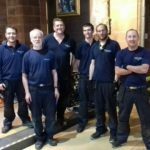 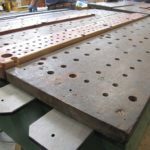 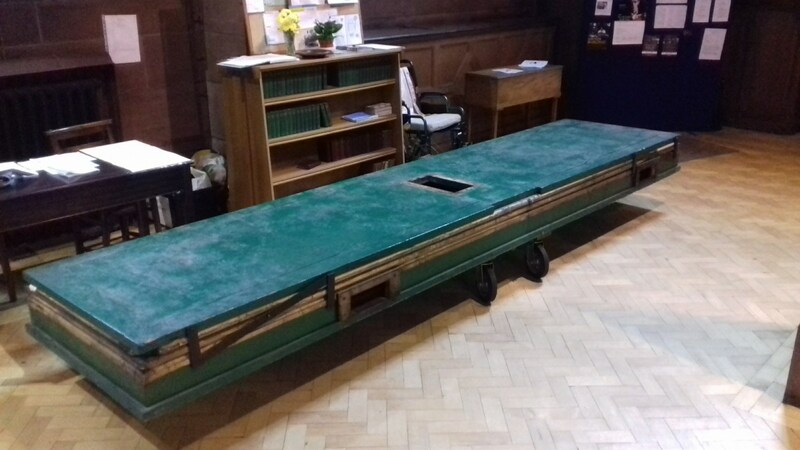 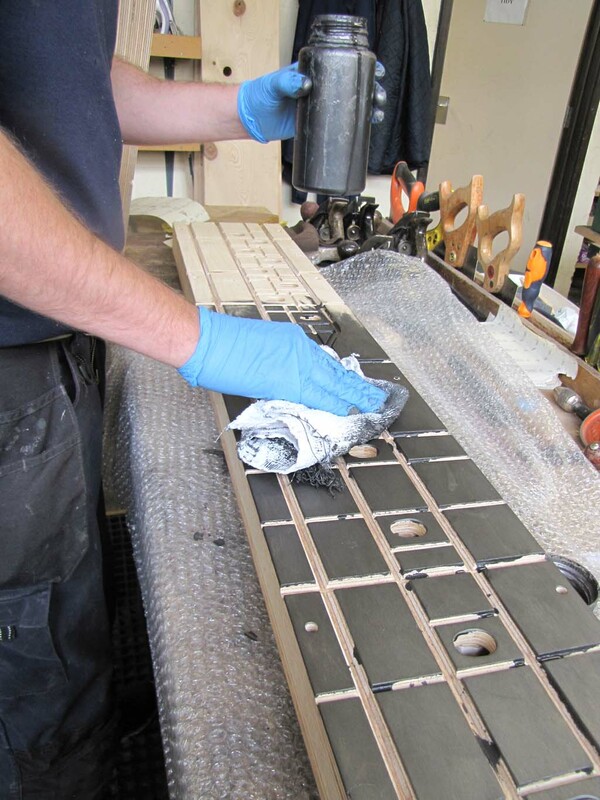 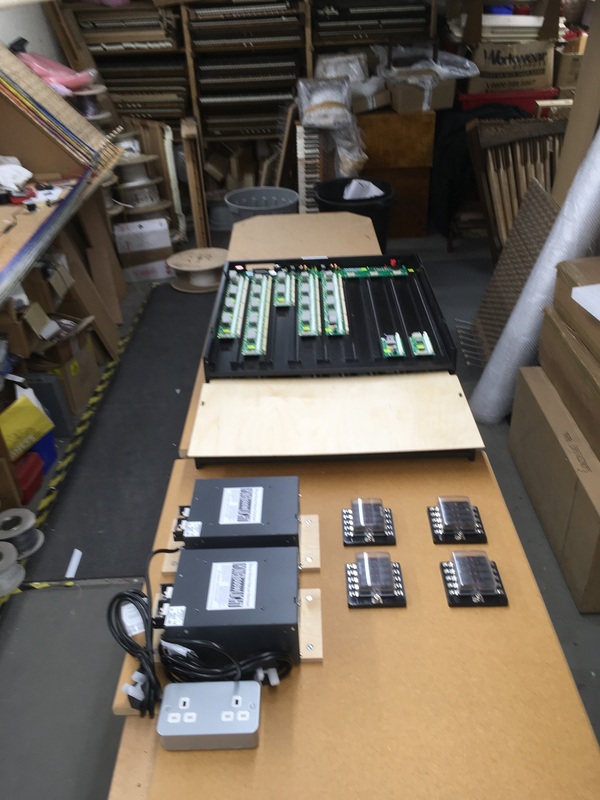 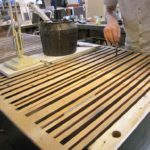 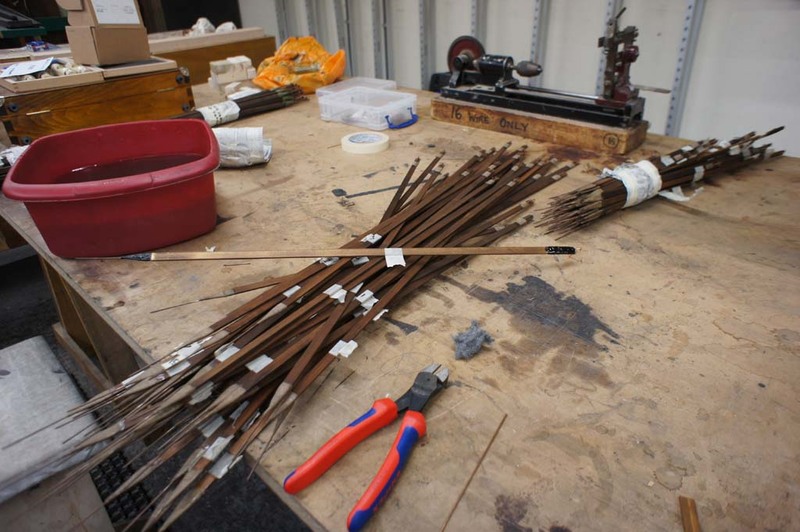 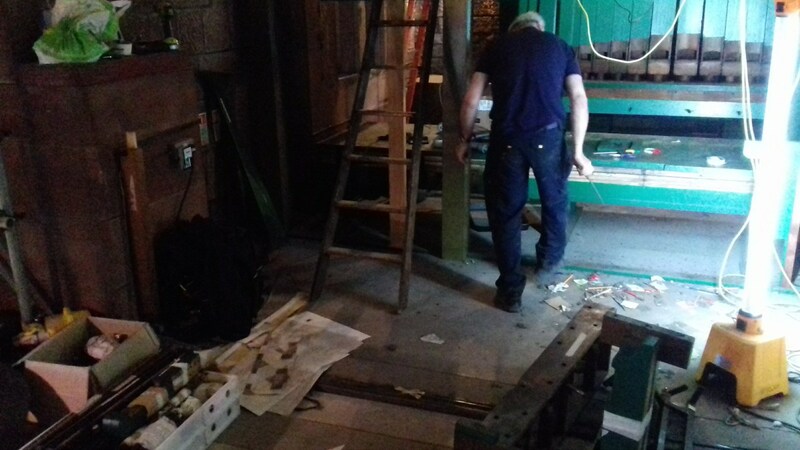 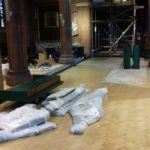 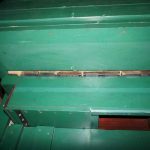 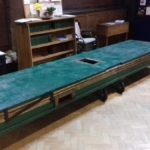 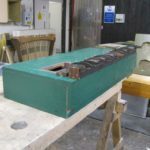 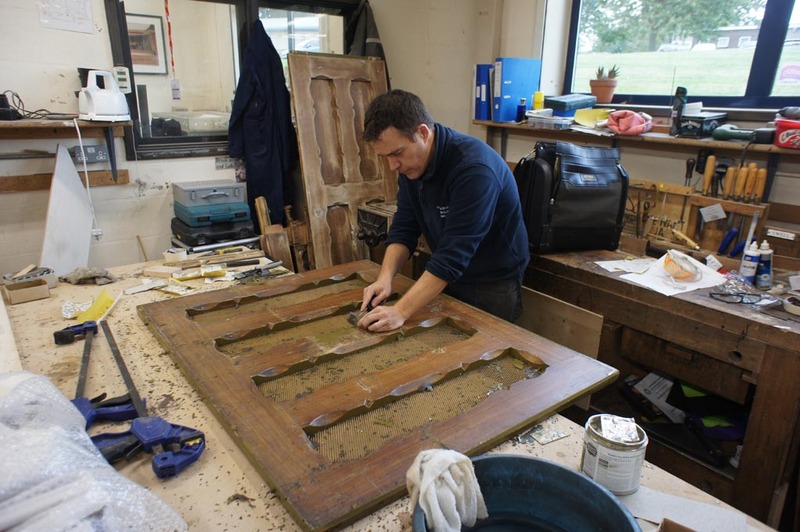 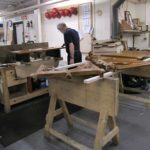 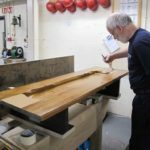 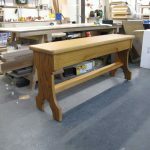 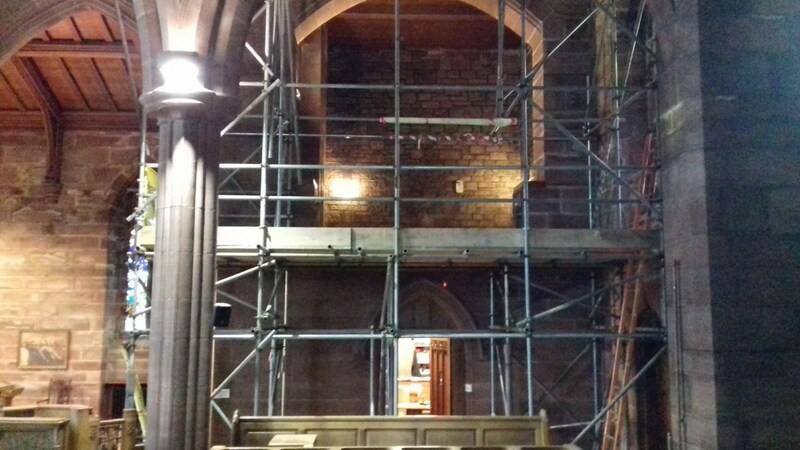 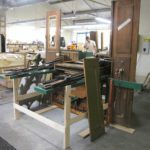 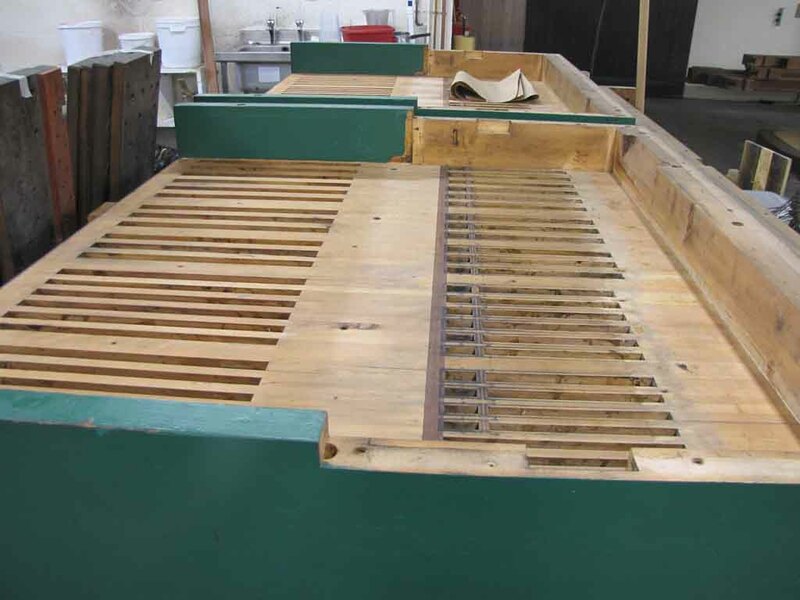 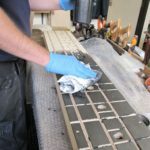 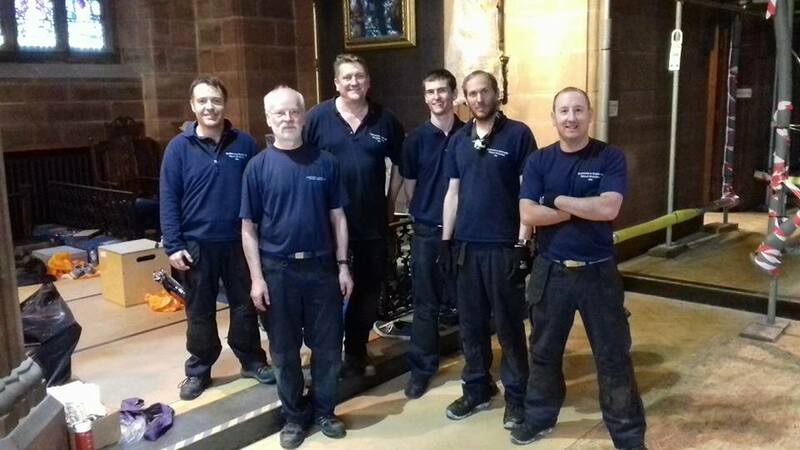 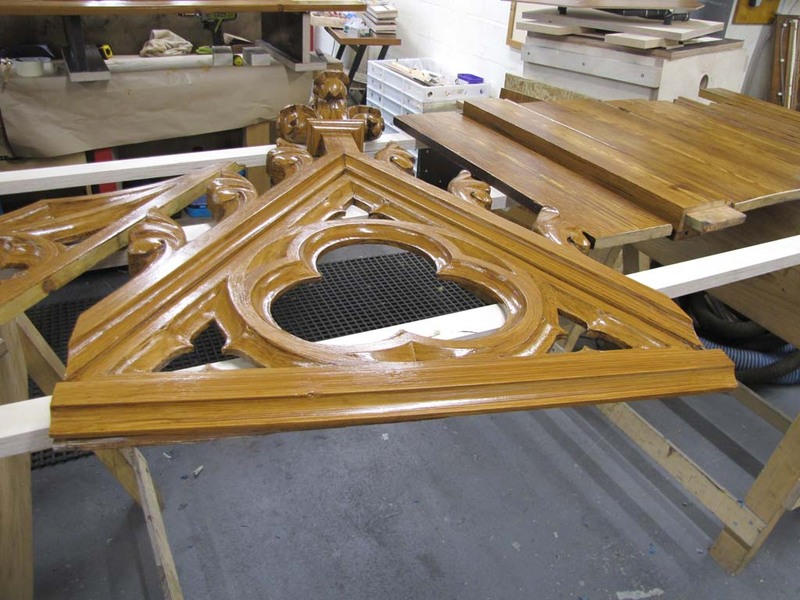 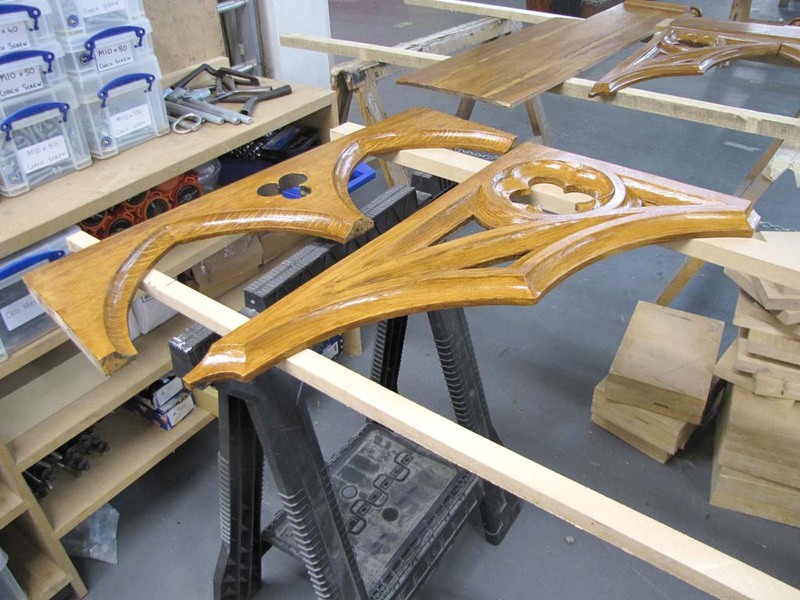 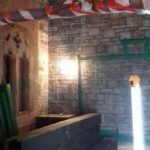 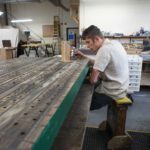 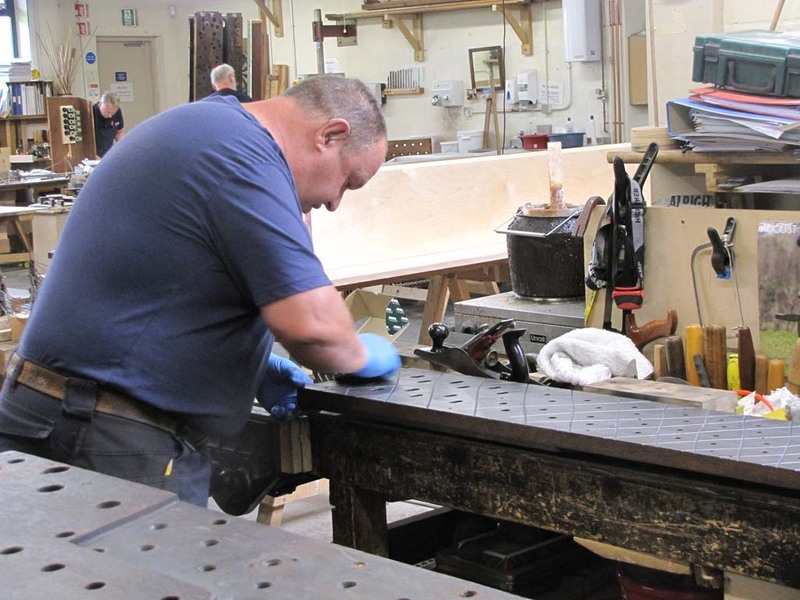 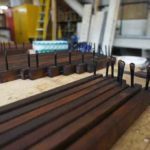 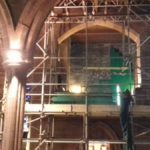 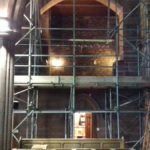 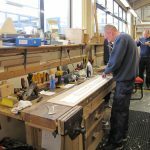 Overhaul of all soundboards including grouting the bars and re-finishing the tables. 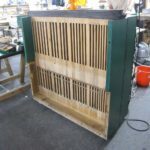 All pallets will be refaced. 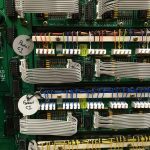 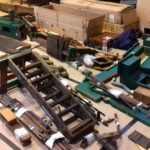 Complete overhaul of the actions and their components. 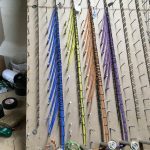 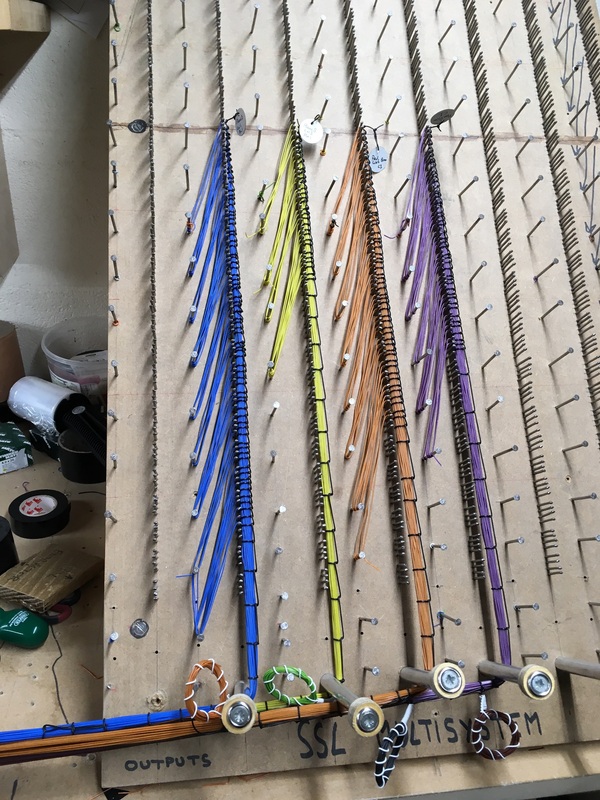 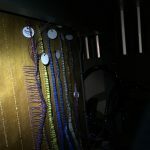 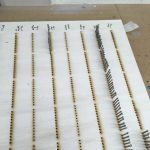 Some new trackers will be made. 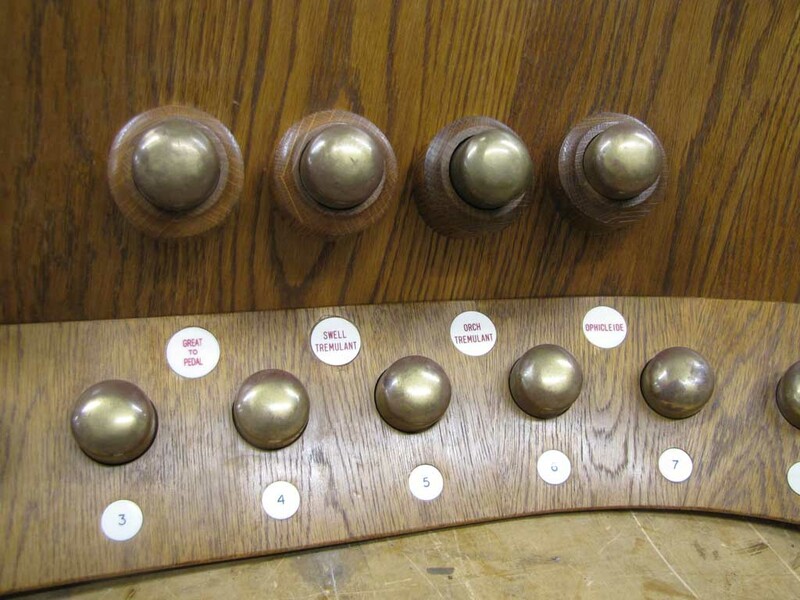 Any broken or poorly-wound trackers will be repaired and all buttons replaced with new leather. 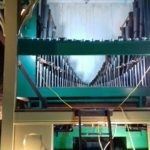 All cloth washers will be renewed. 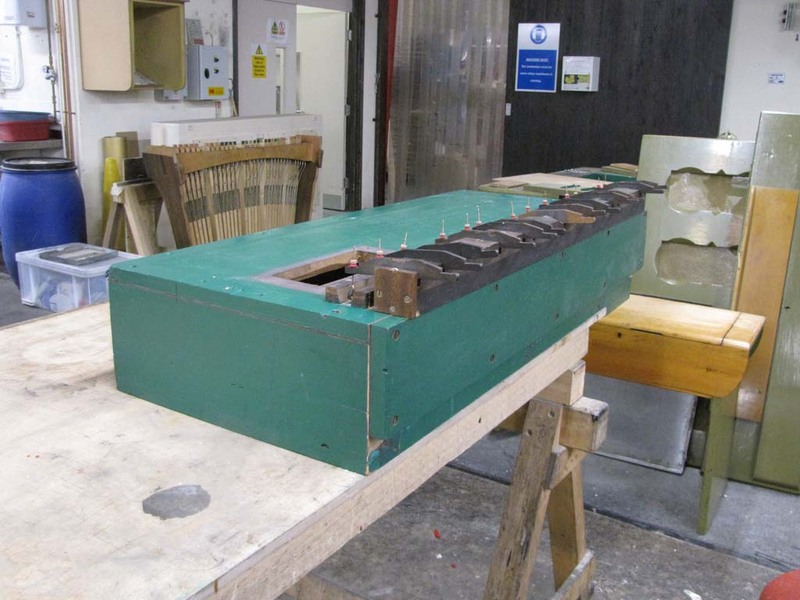 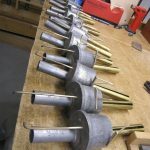 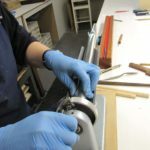 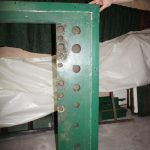 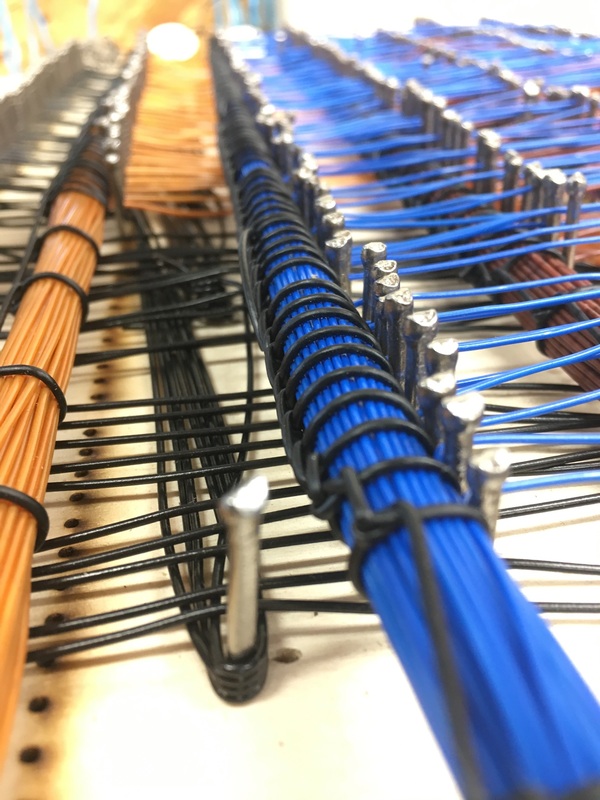 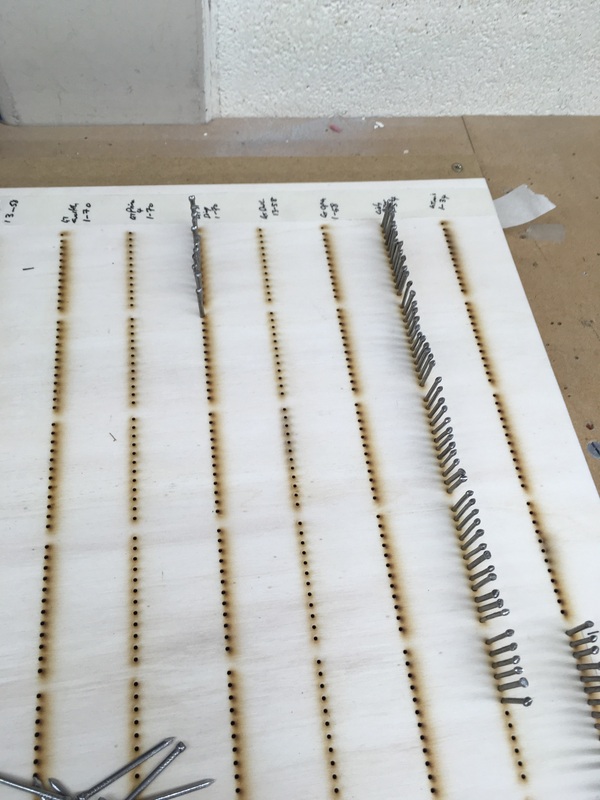 The stop action components will be re-bushed and re-centered and all wear in the mechanism taken up. 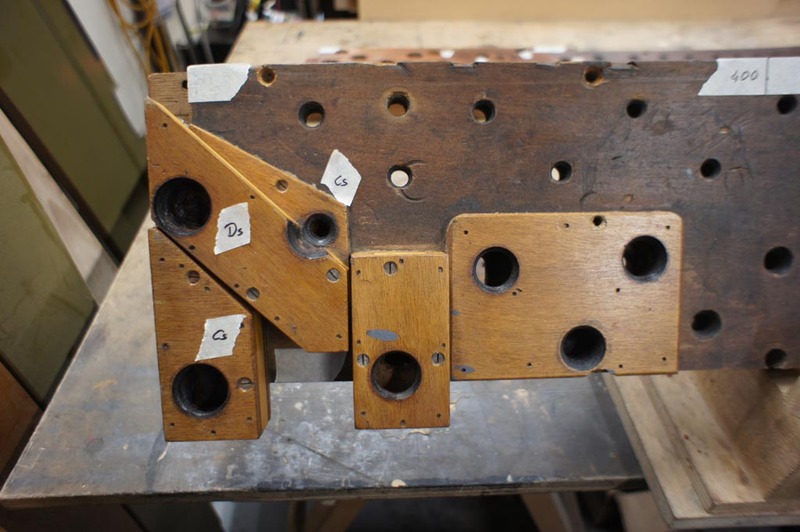 Re-work of the swell pedal mechanism to ensure that the box can be kept closed. 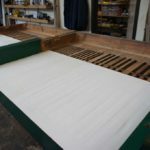 Reservoir to be re-leathered. 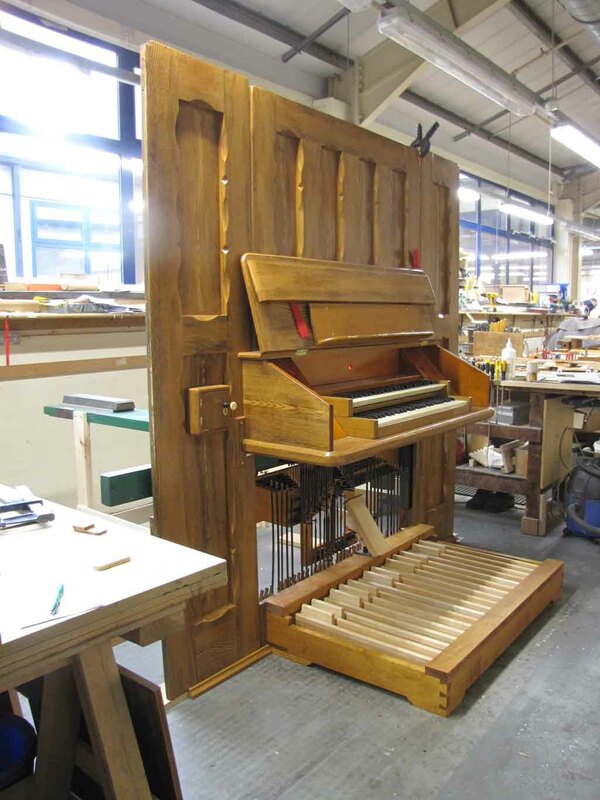 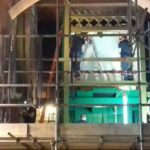 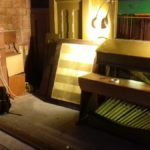 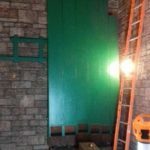 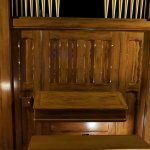 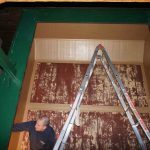 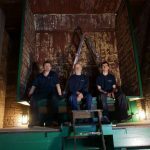 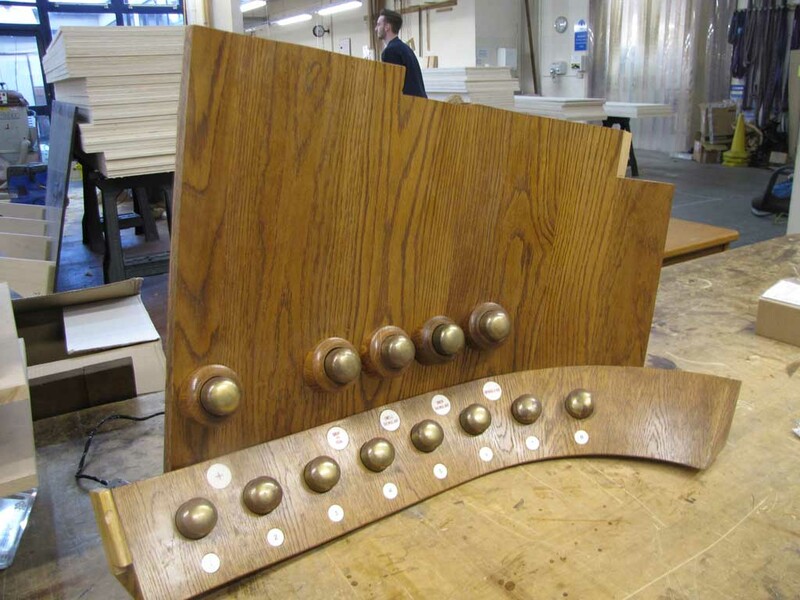 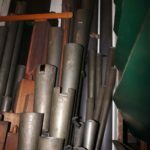 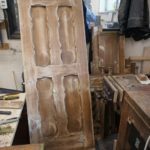 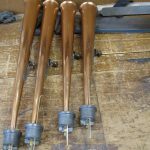 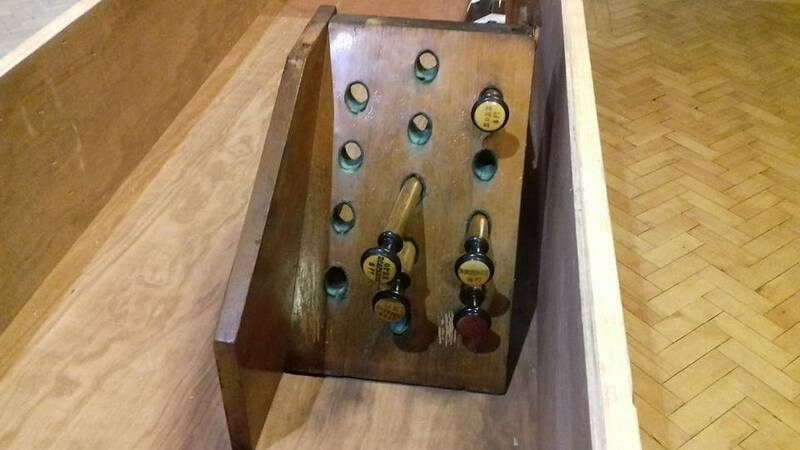 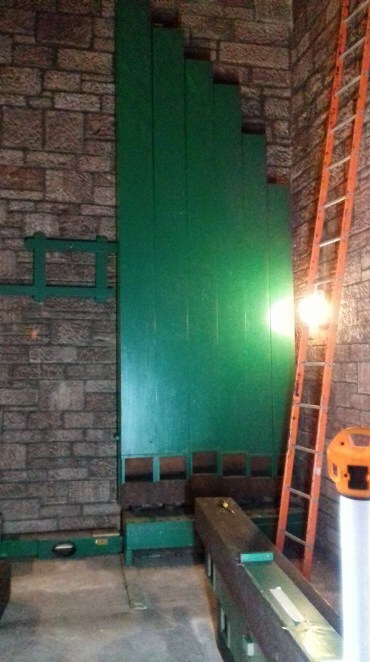 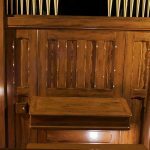 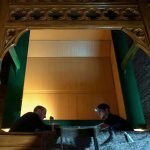 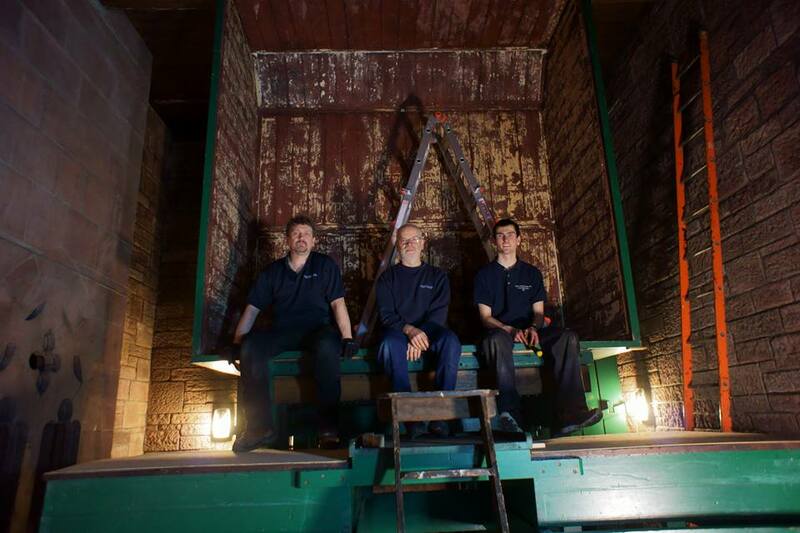 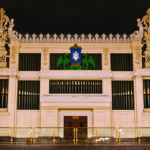 The Great Organ concussion bellows, the tremulant, and Great Organ wooden wind trunk will be re-leathered. 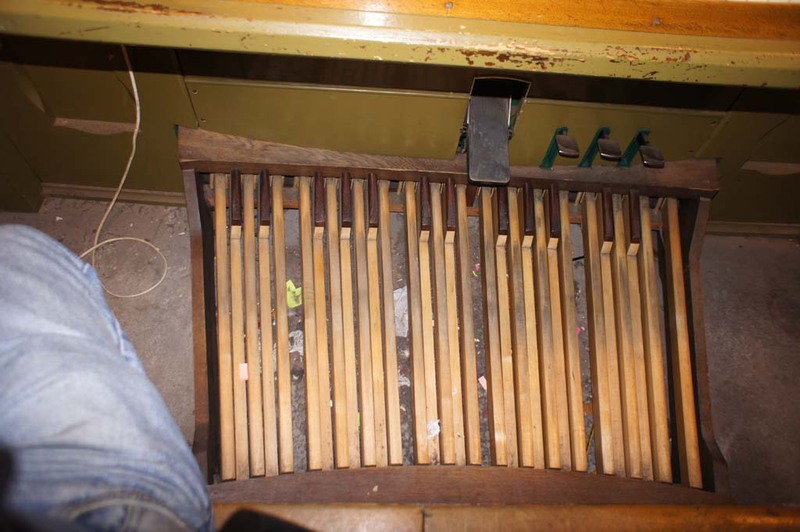 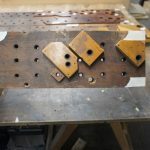 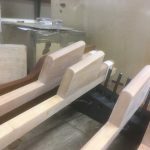 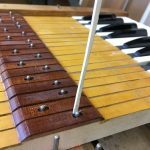 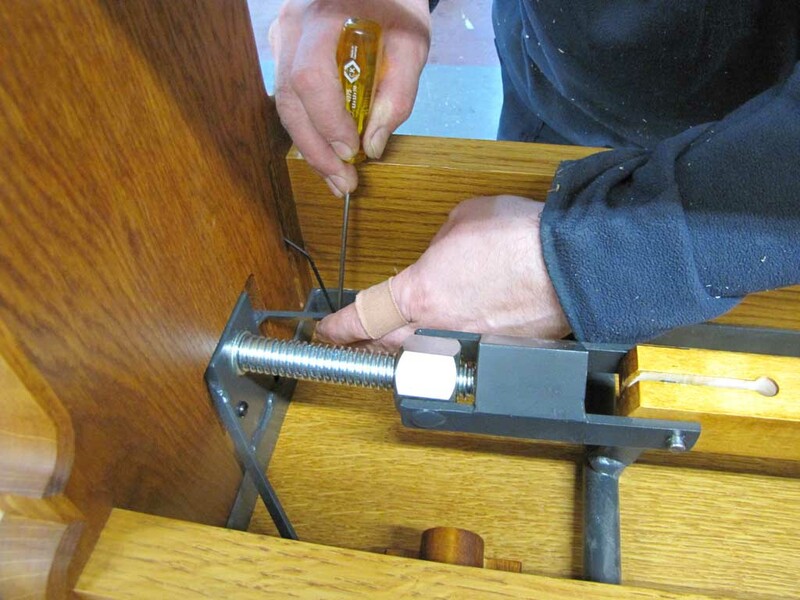 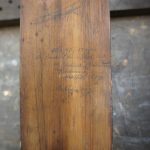 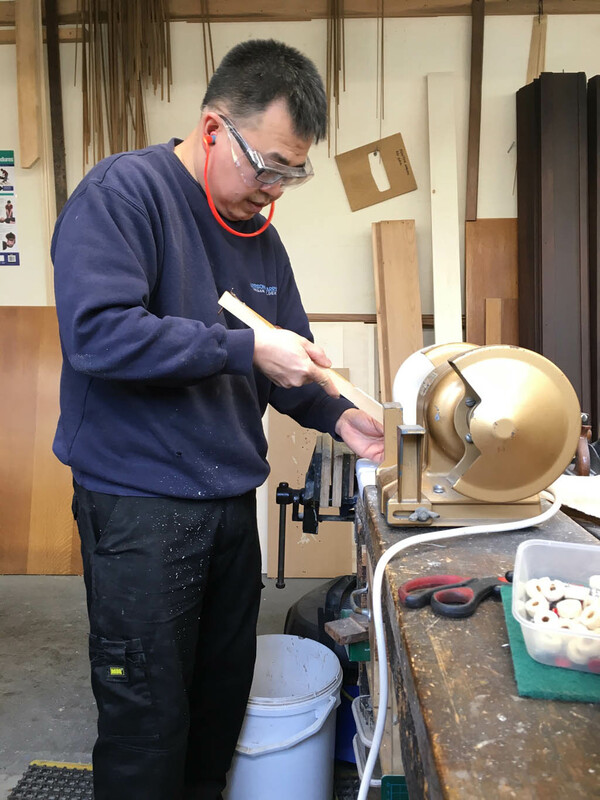 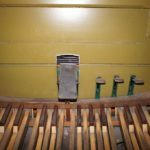 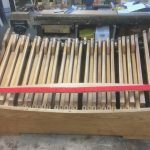 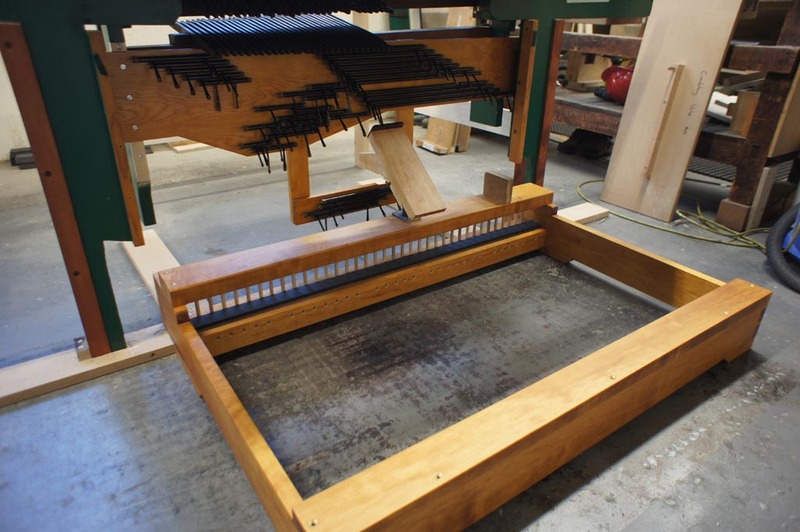 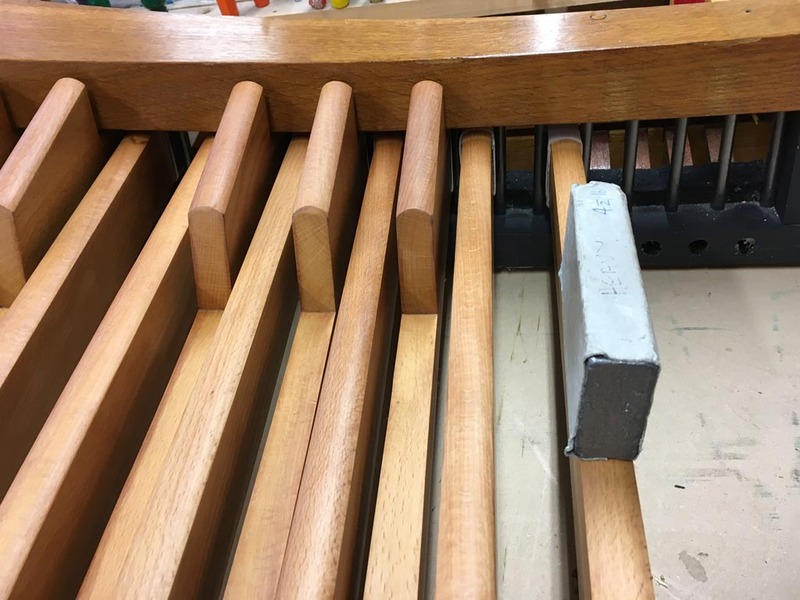 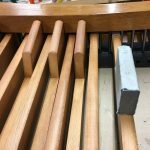 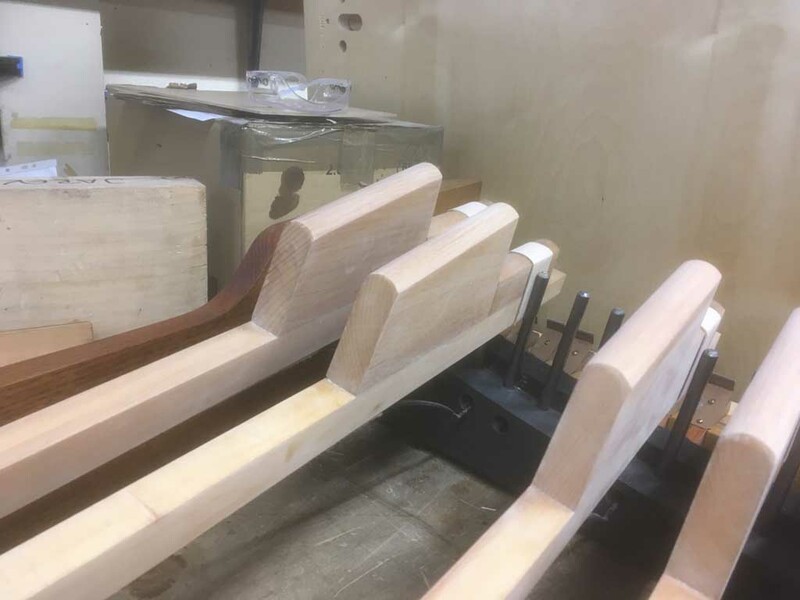 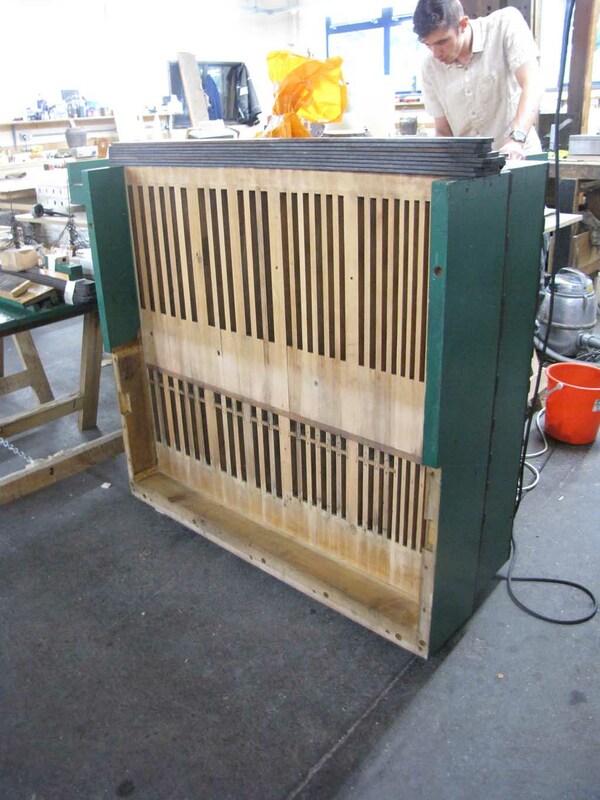 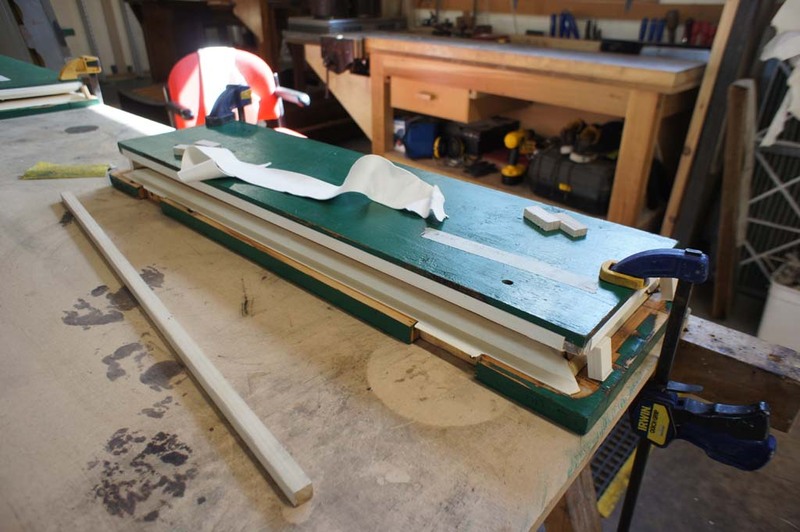 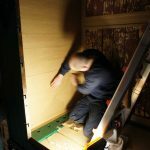 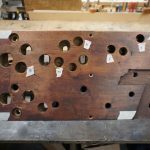 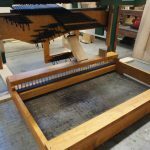 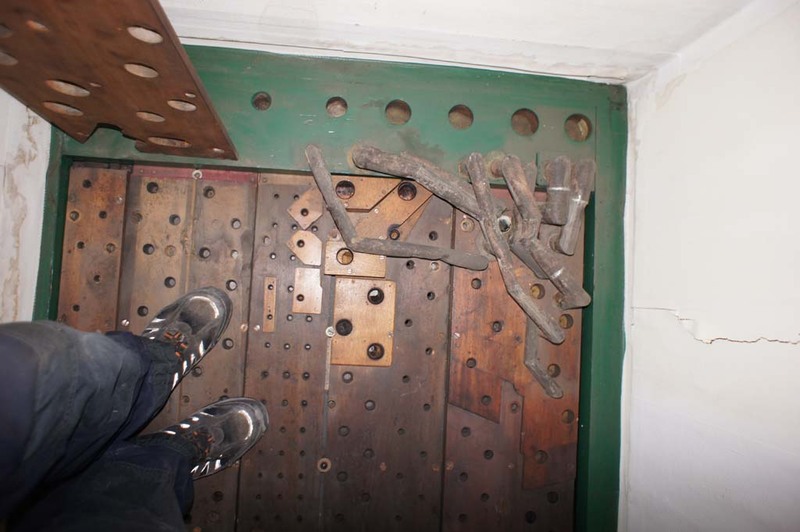 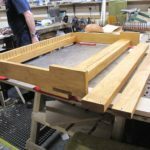 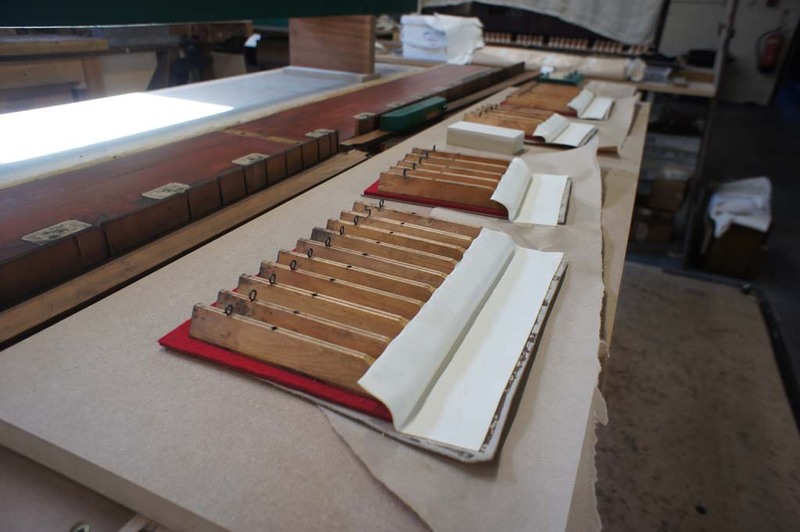 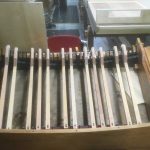 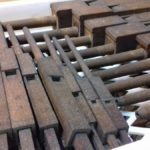 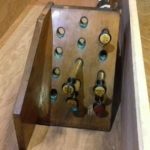 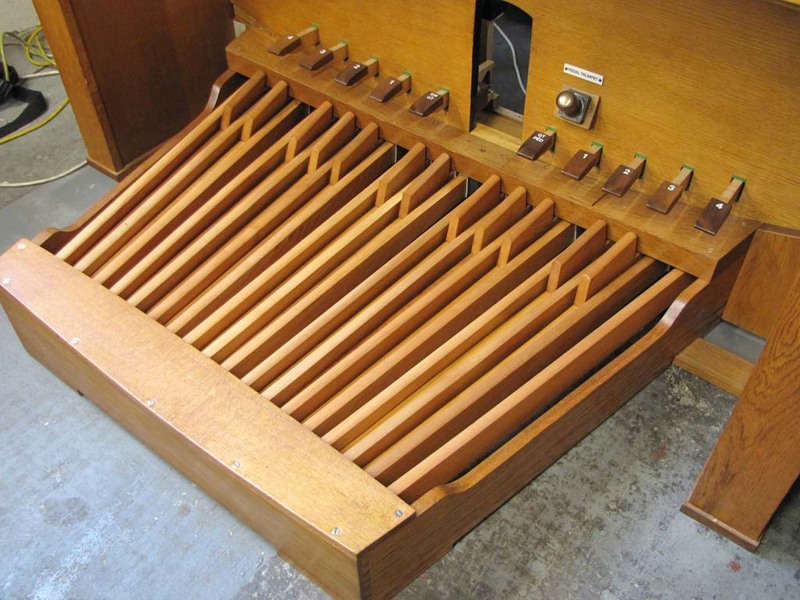 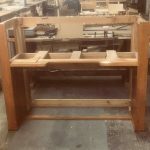 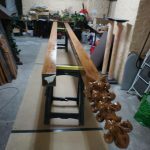 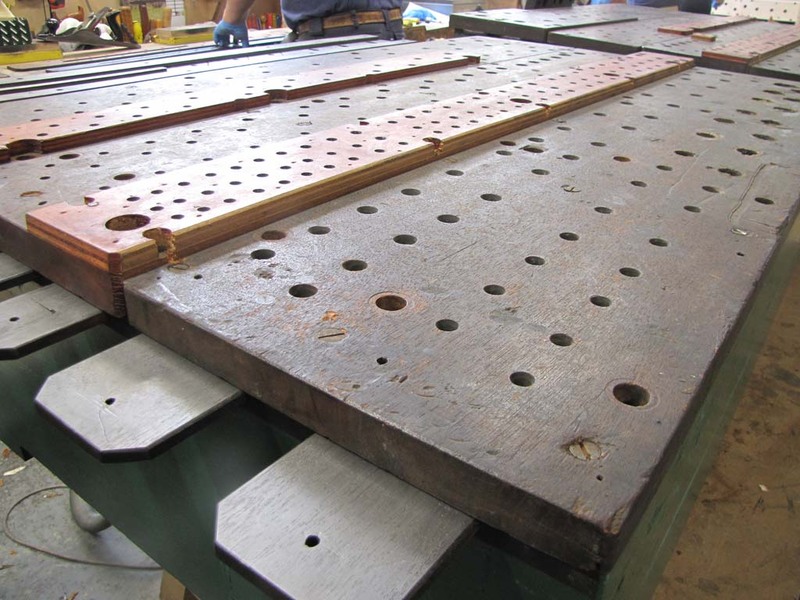 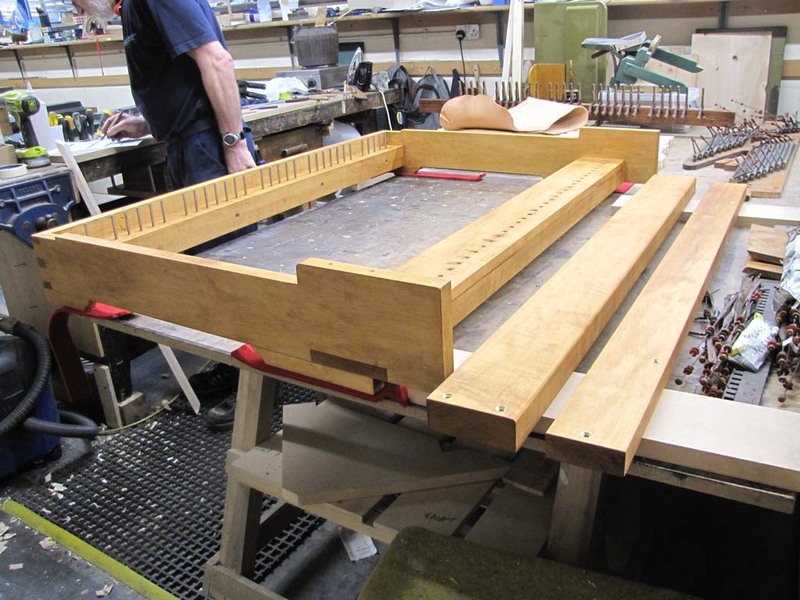 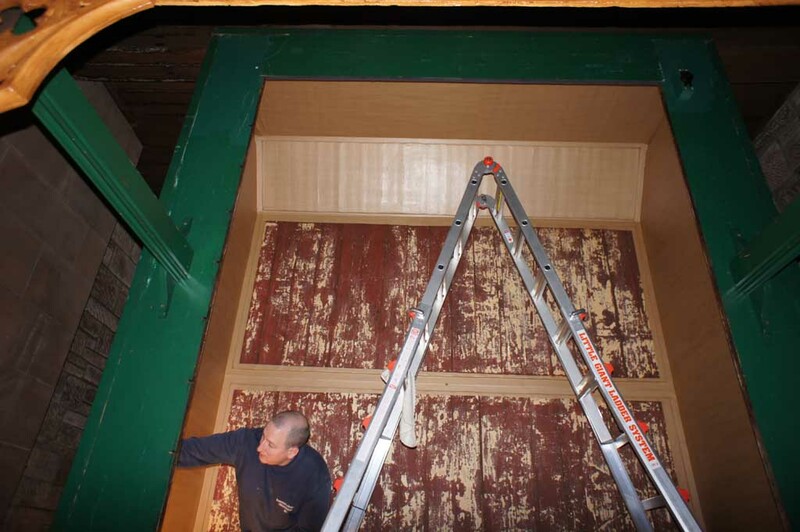 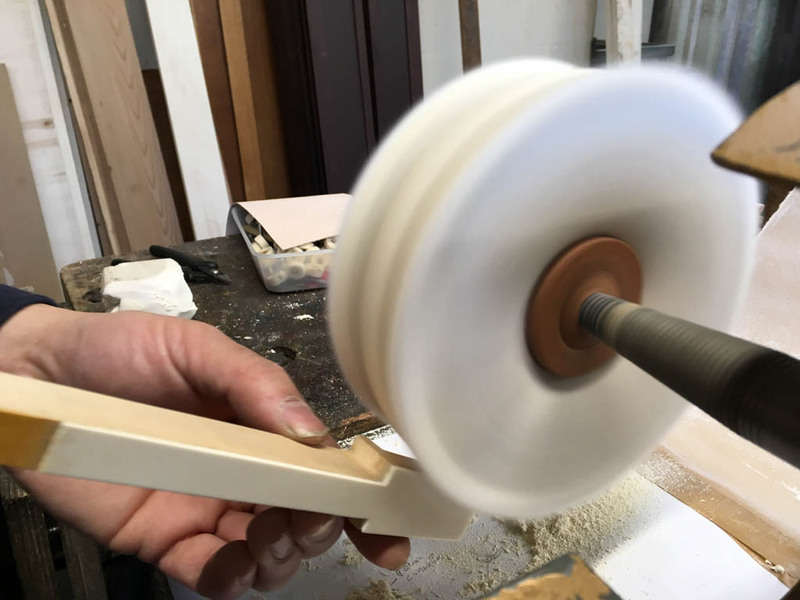 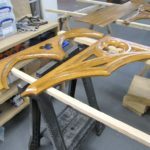 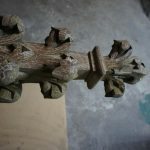 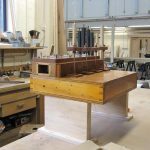 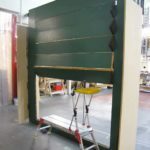 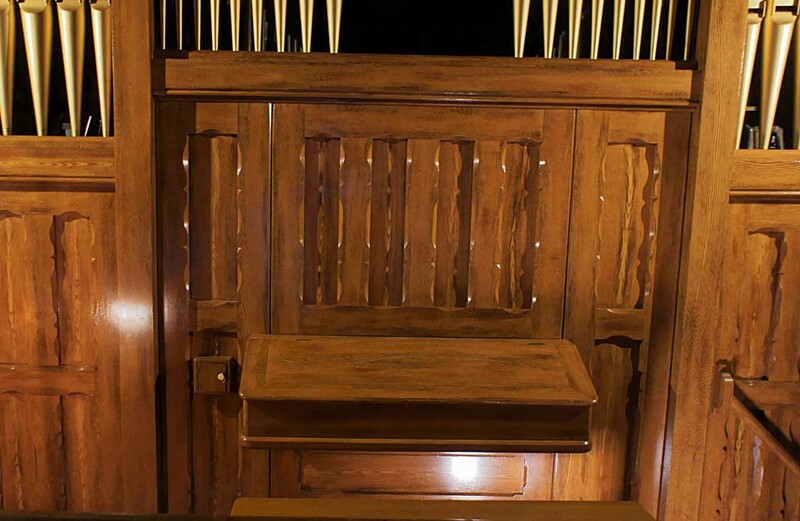 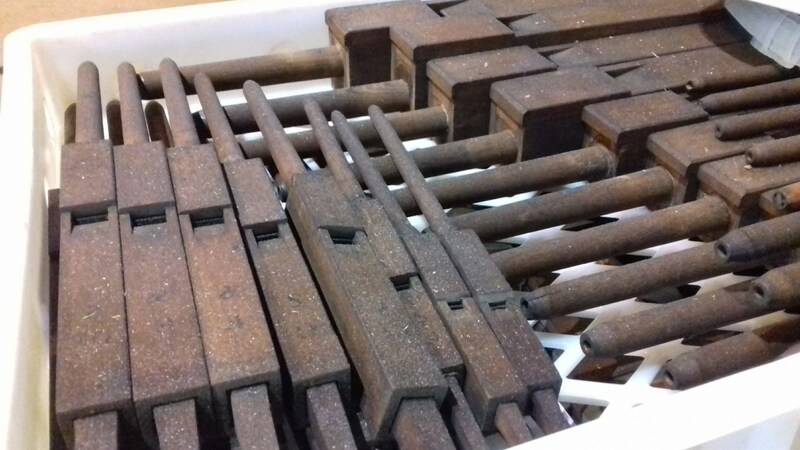 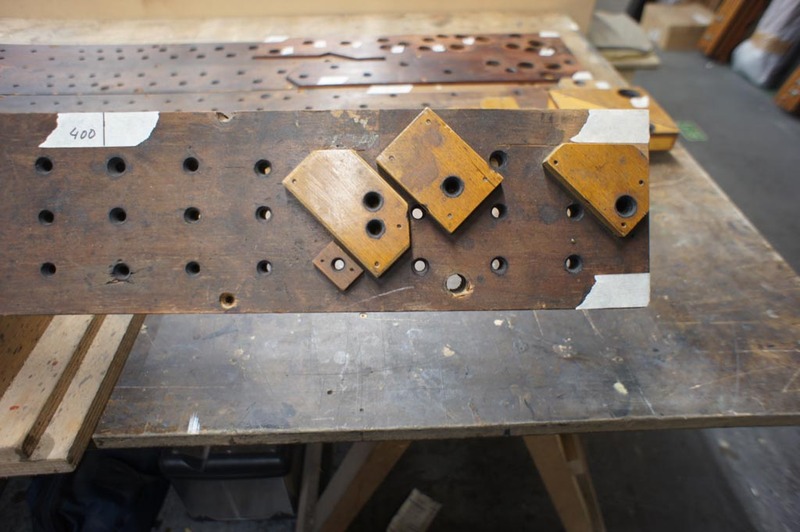 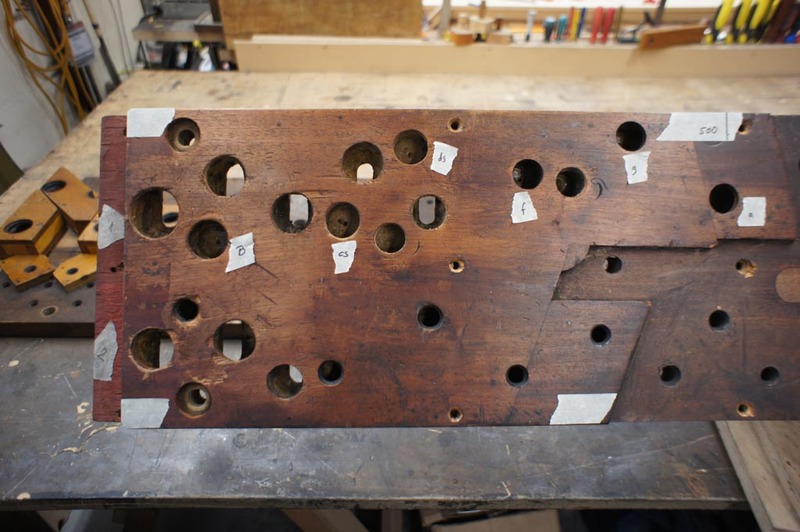 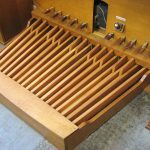 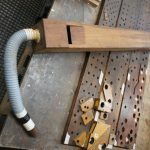 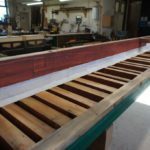 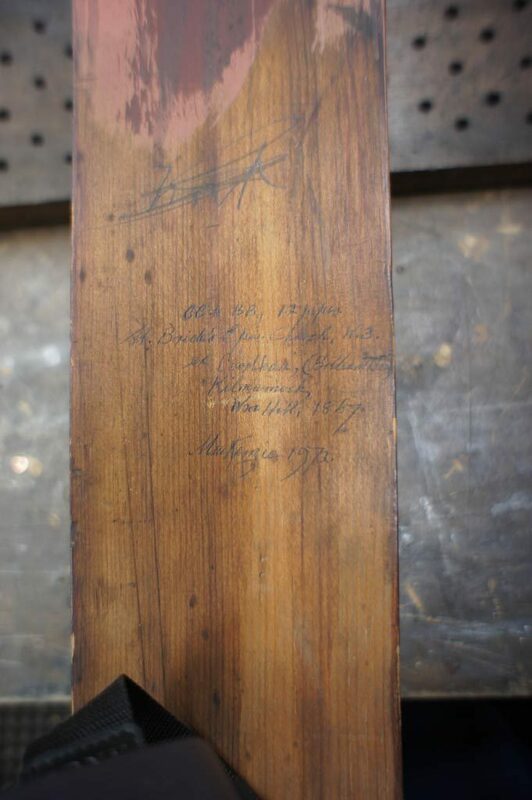 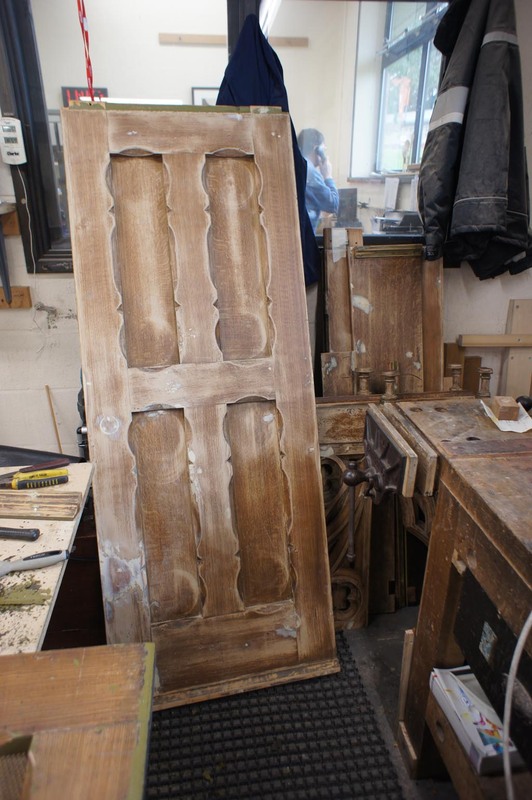 A new wooden trunk, in traditional style, will be made for the Pedal Open Wood. 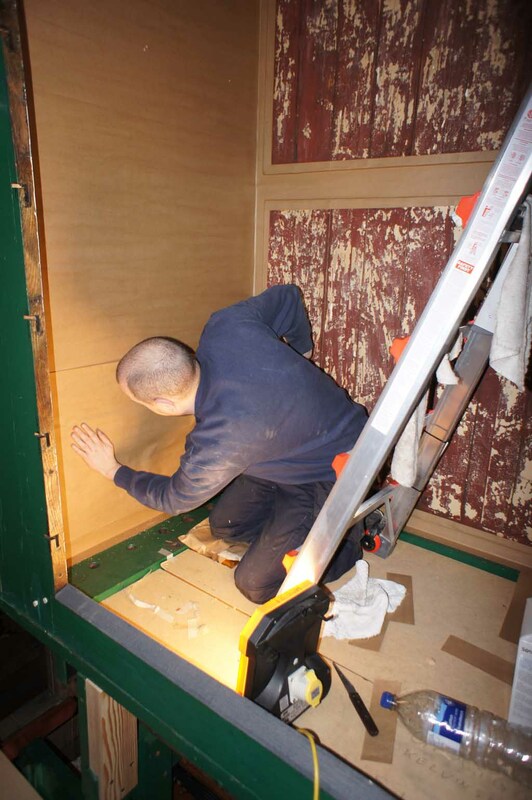 Swell box checked during re-installation. 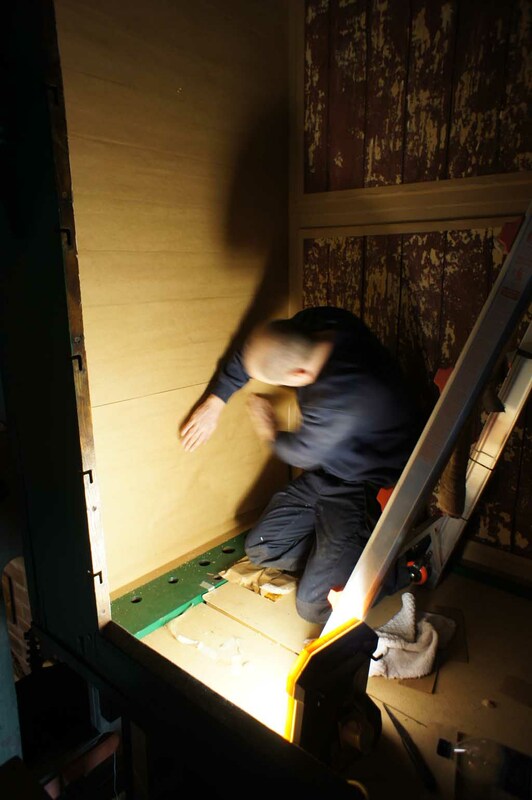 Re-line the box once it is back in-situ. 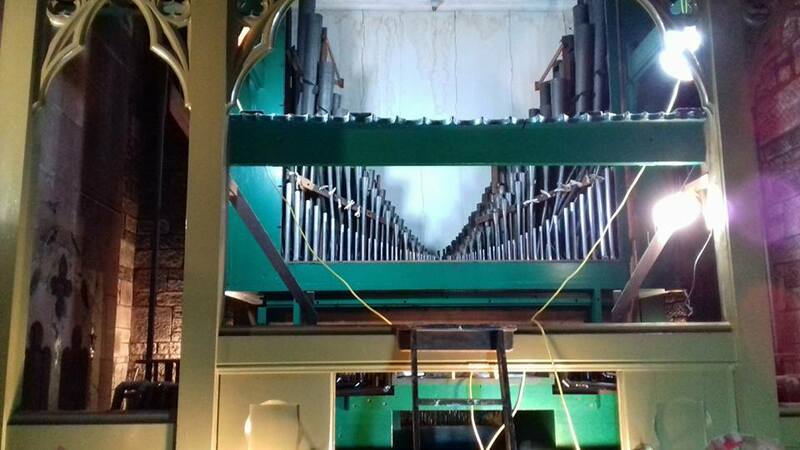 Deane Organ Builders of Taunton 1992. 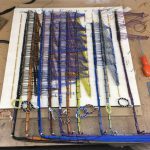 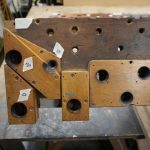 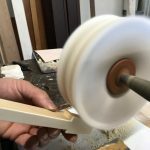 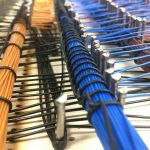 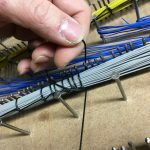 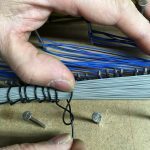 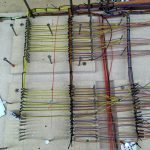 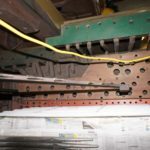 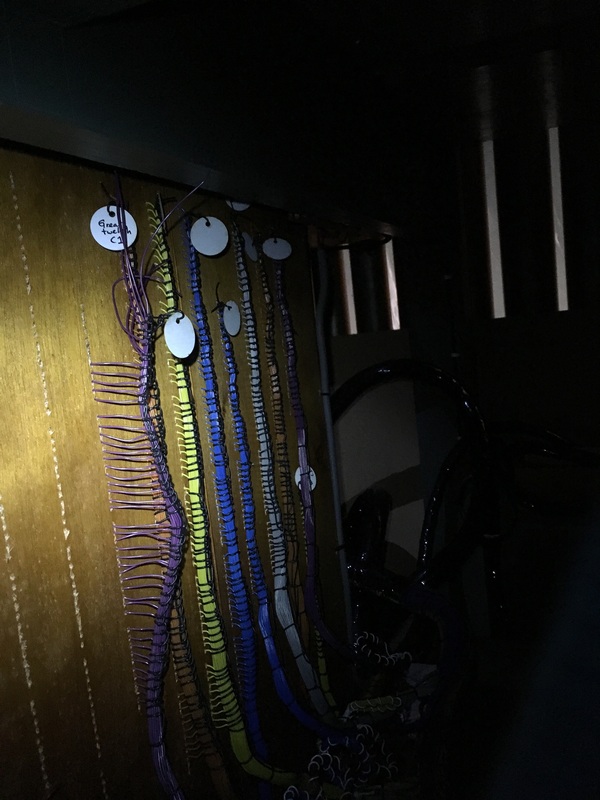 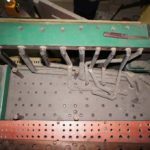 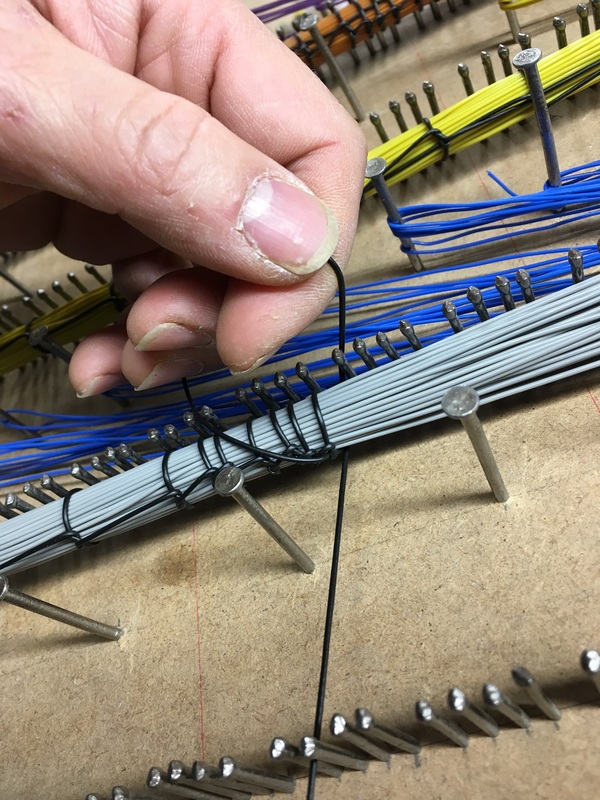 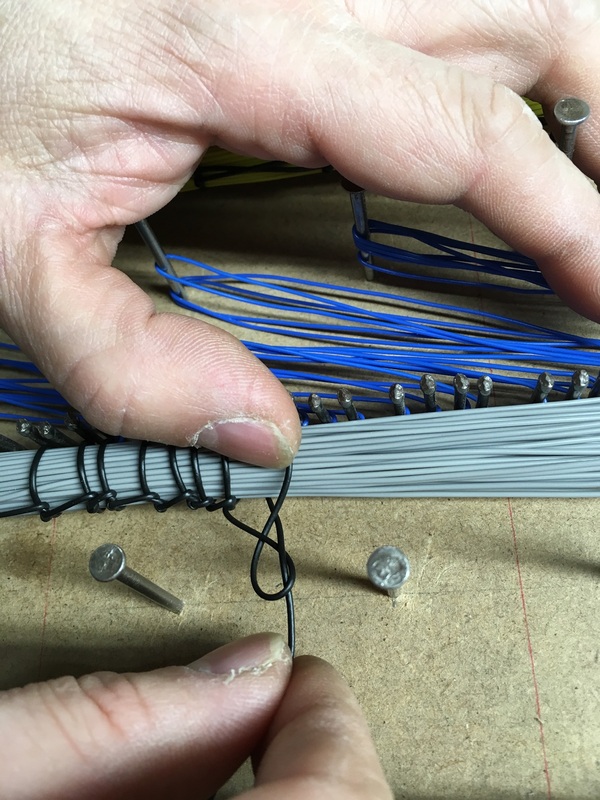 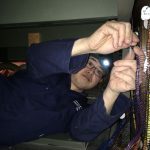 2 manual 32 stops on extension principal.